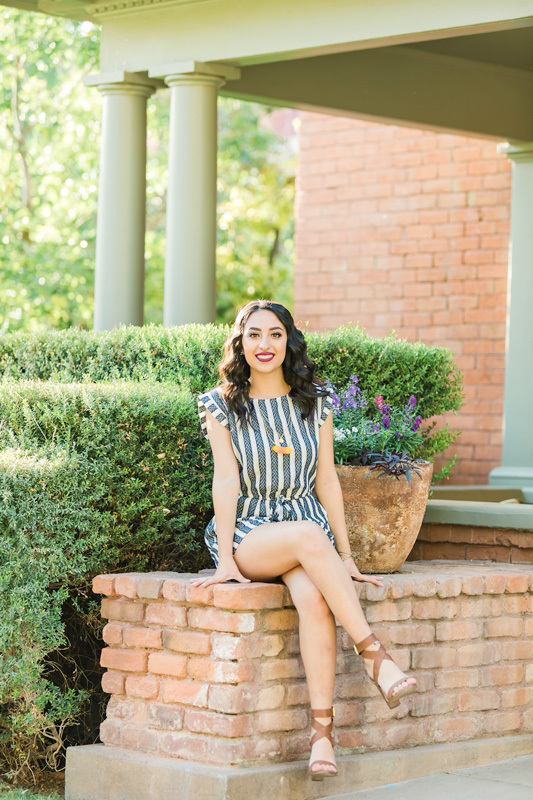 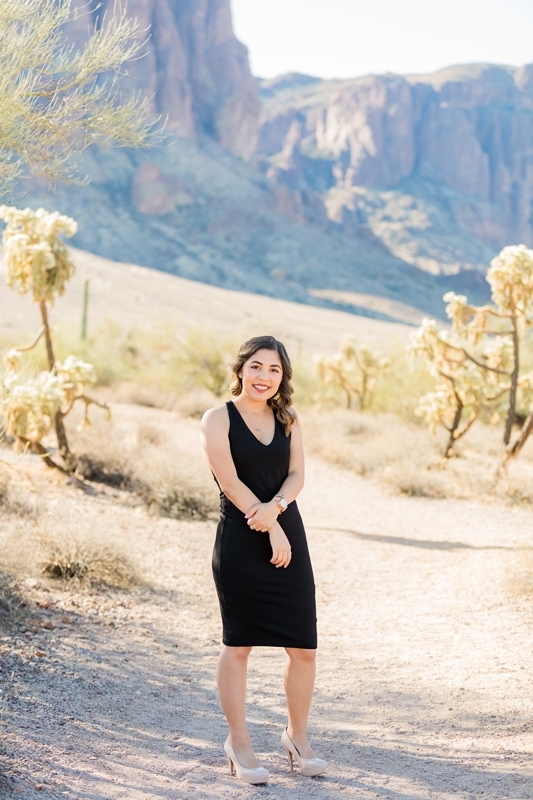 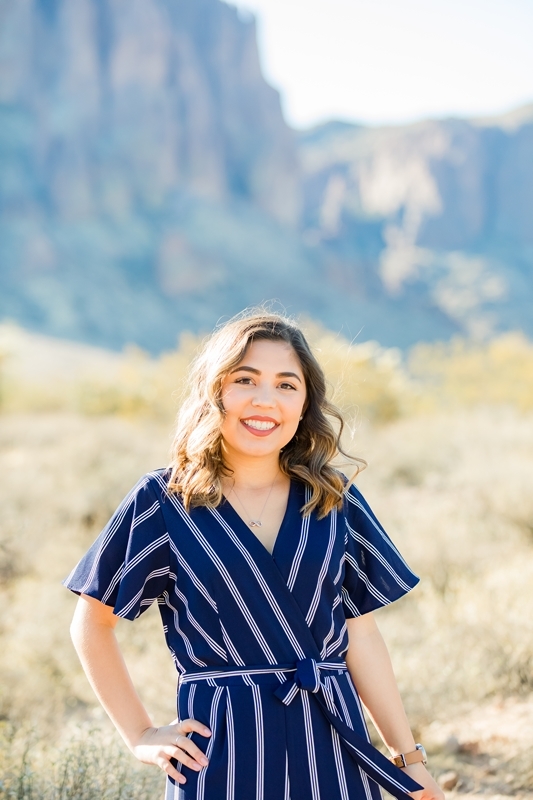 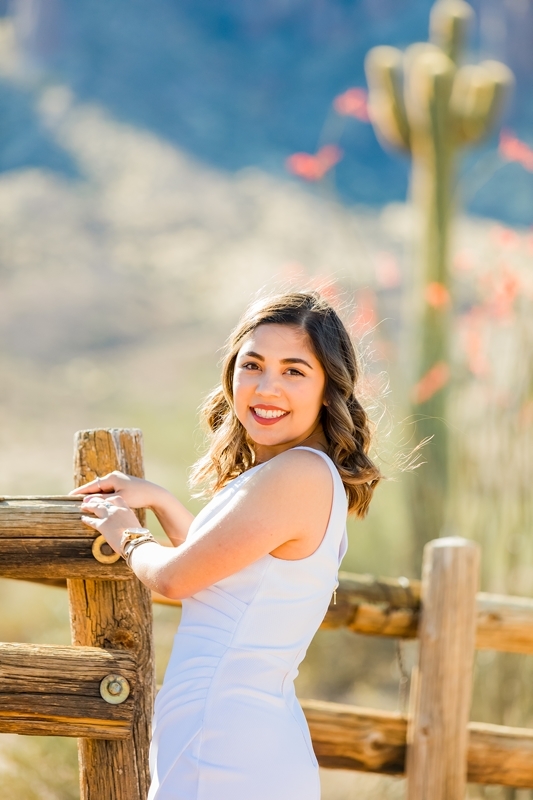 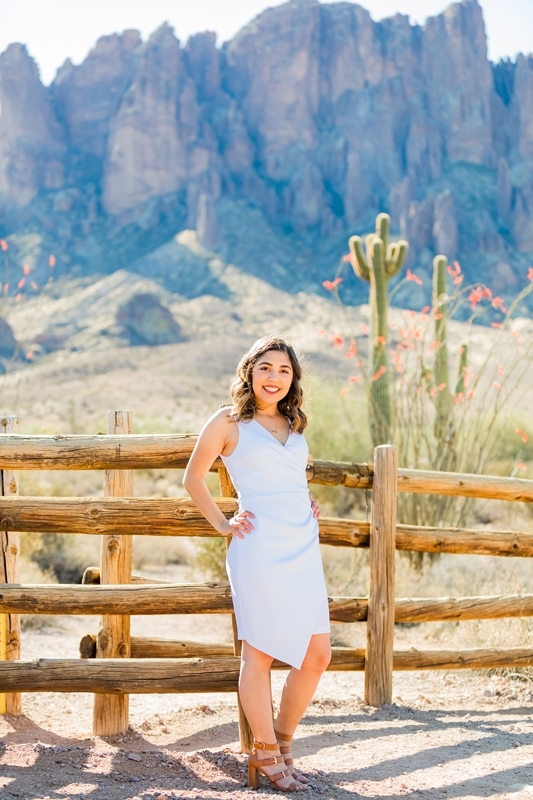 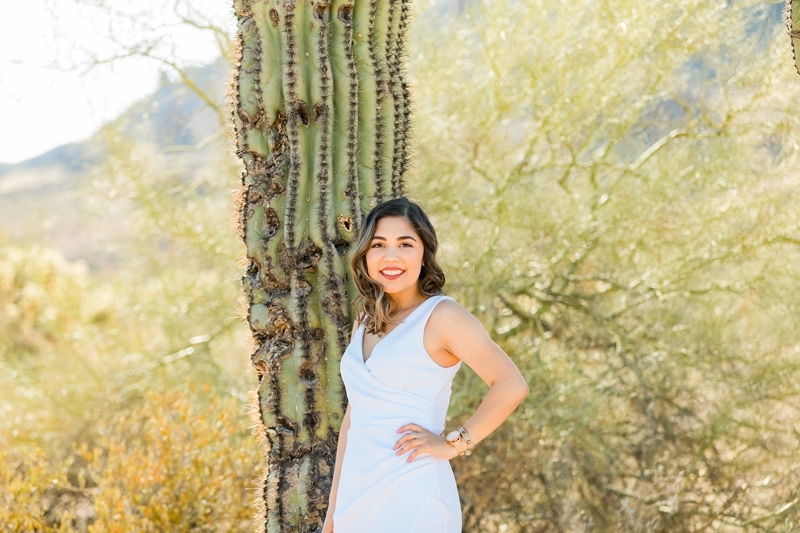 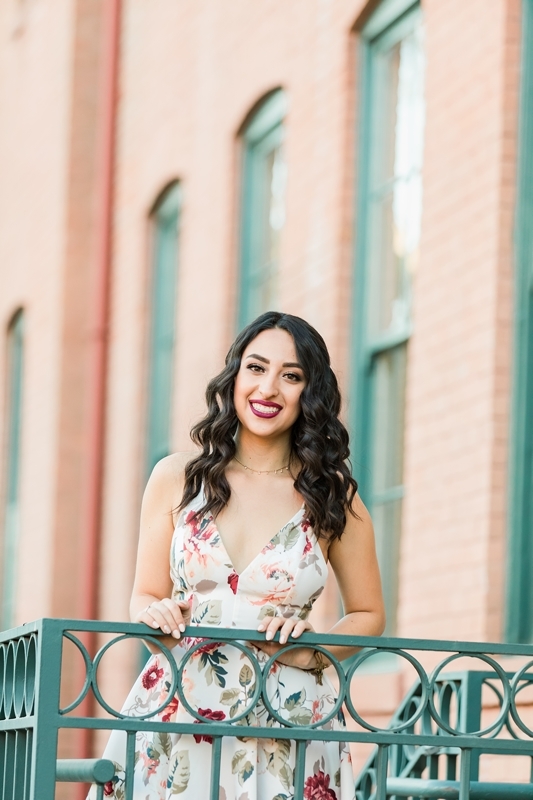 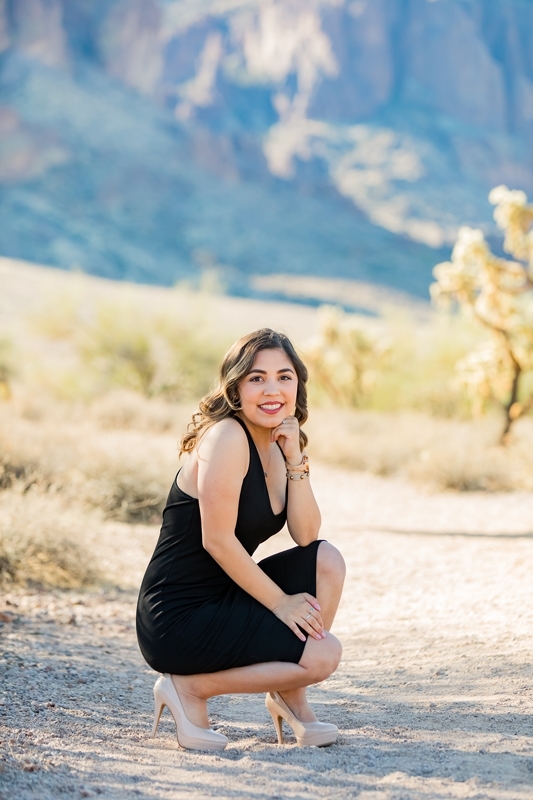 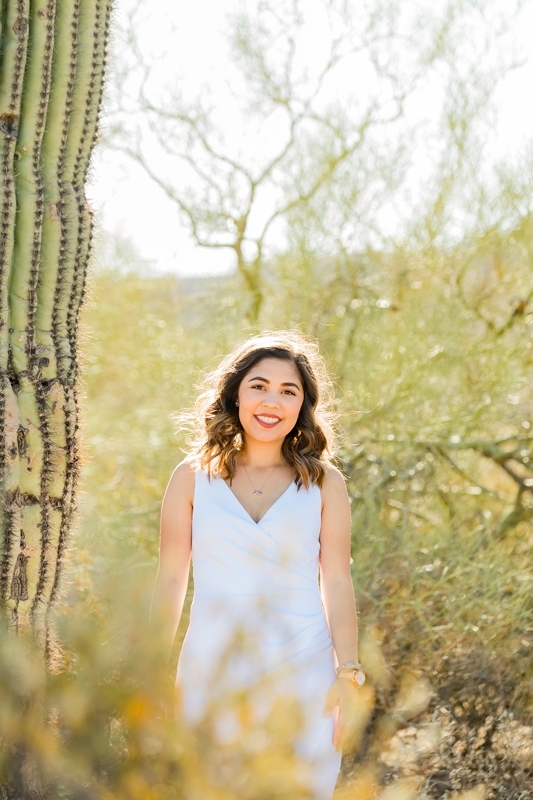 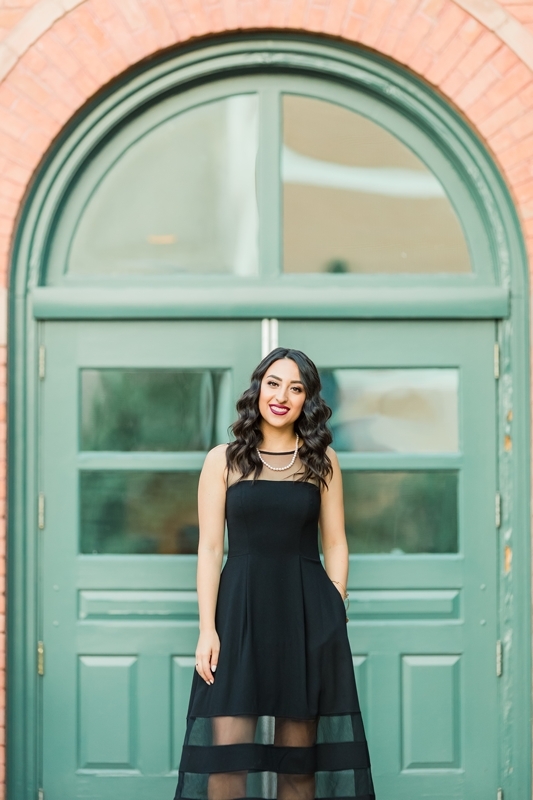 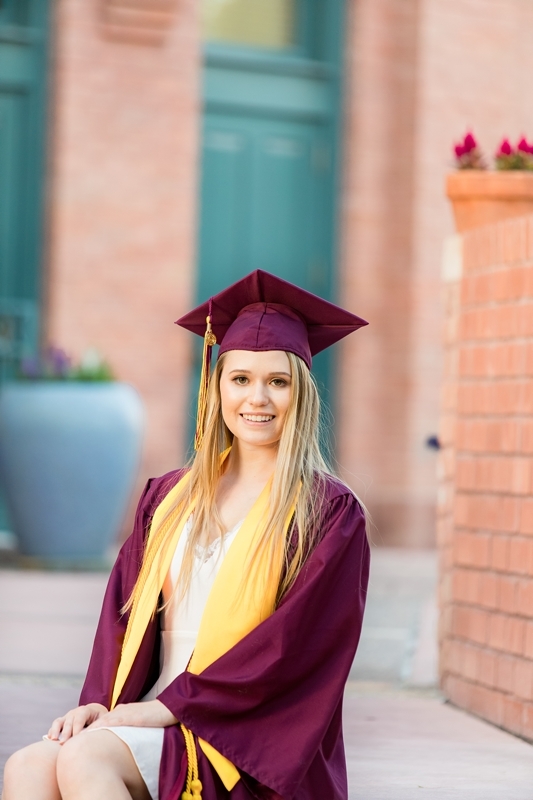 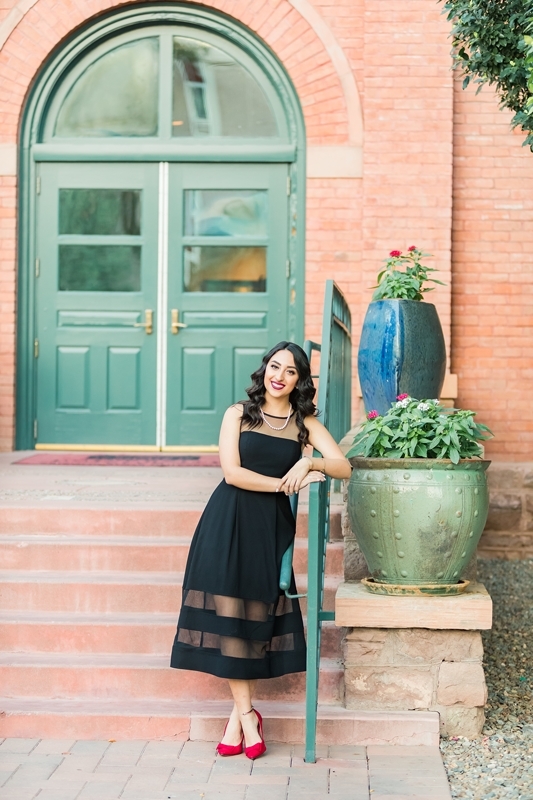 Alysia drove all the way down from Tucson to have her senior pictures taken. 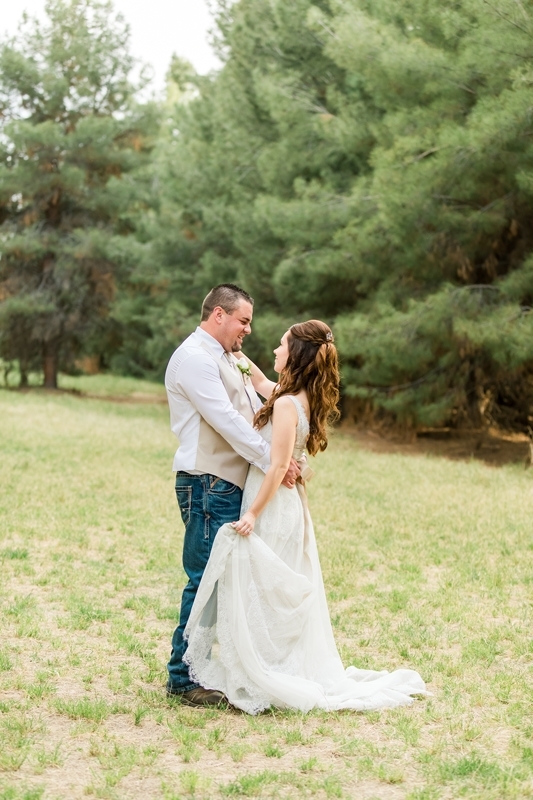 These mountain views really are breathtaking! 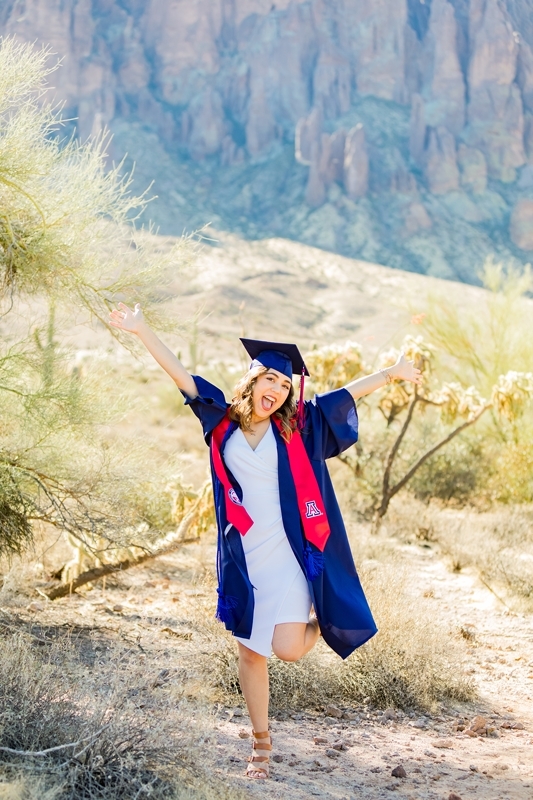 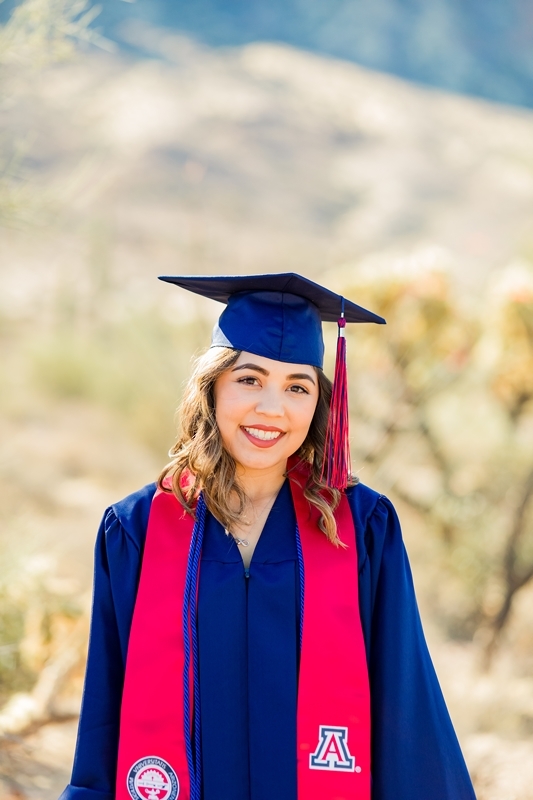 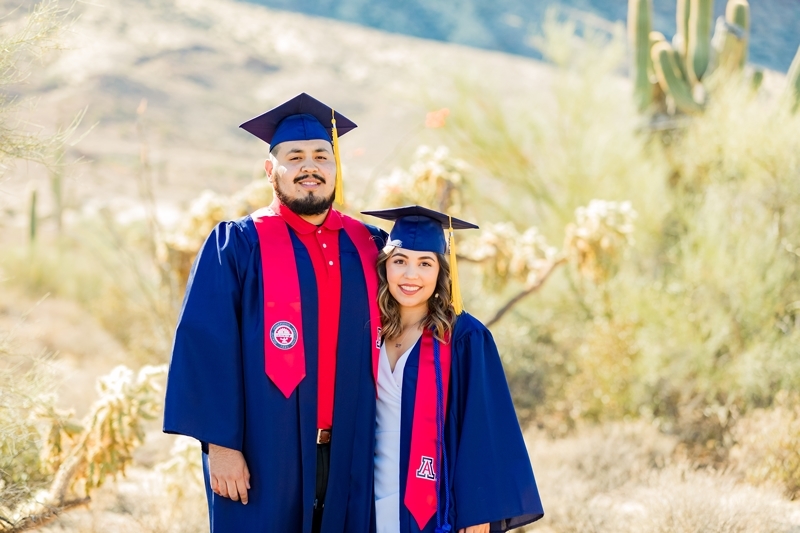 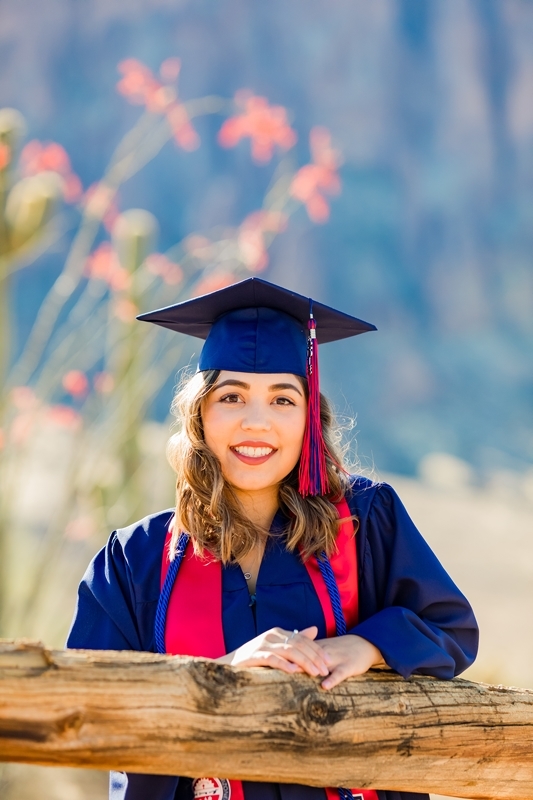 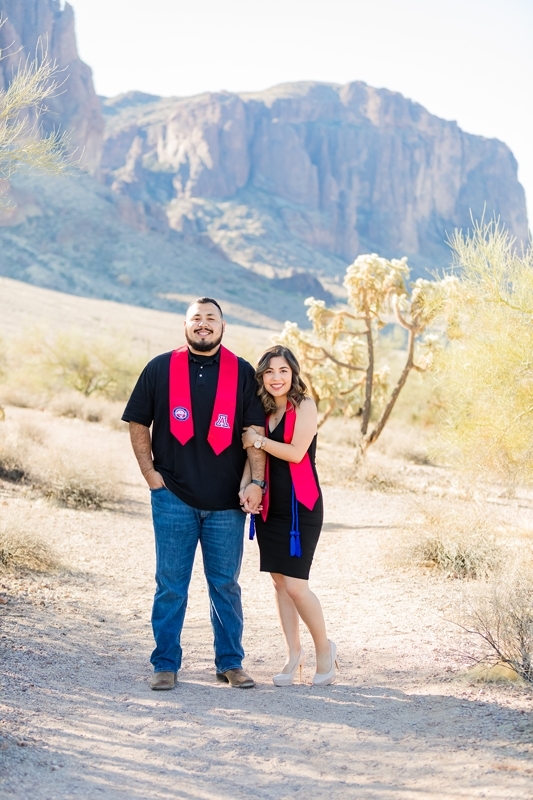 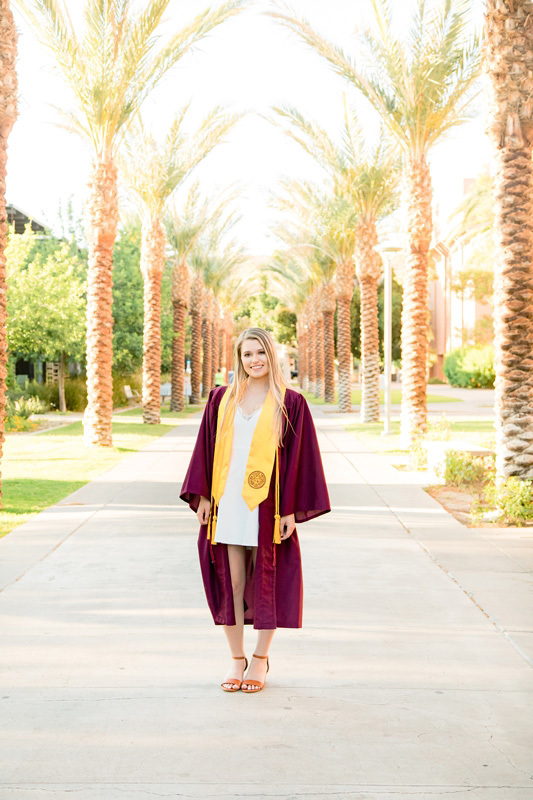 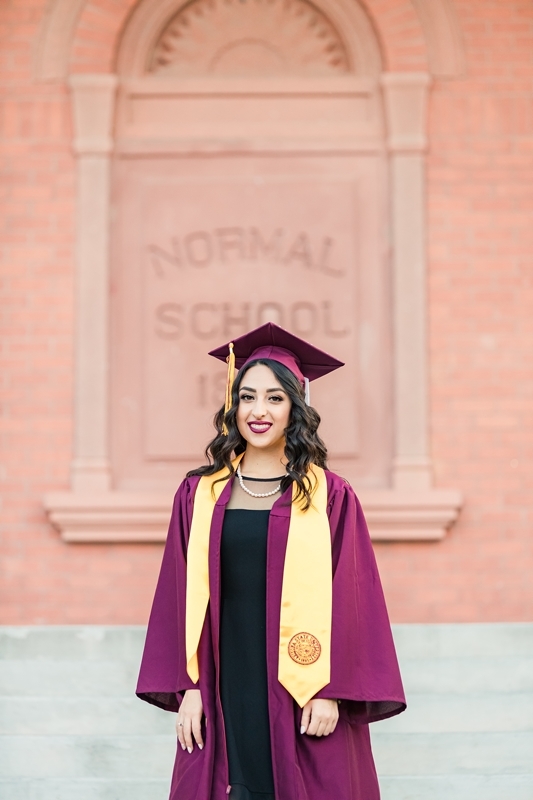 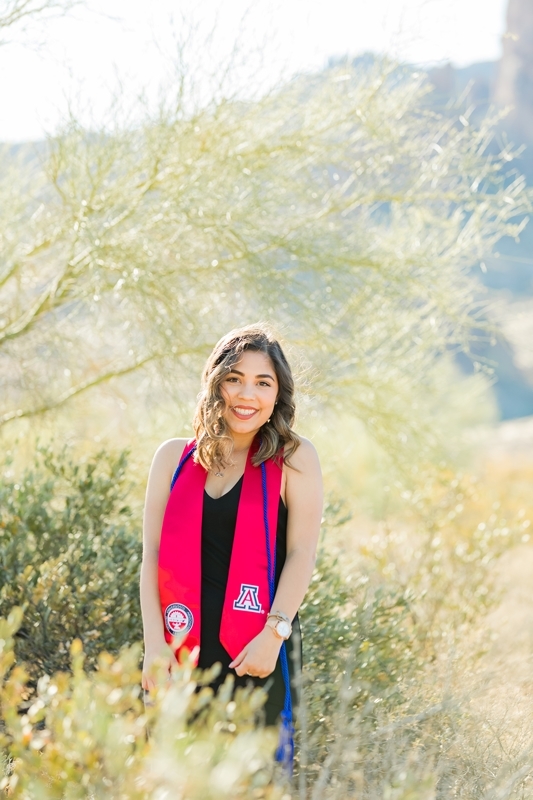 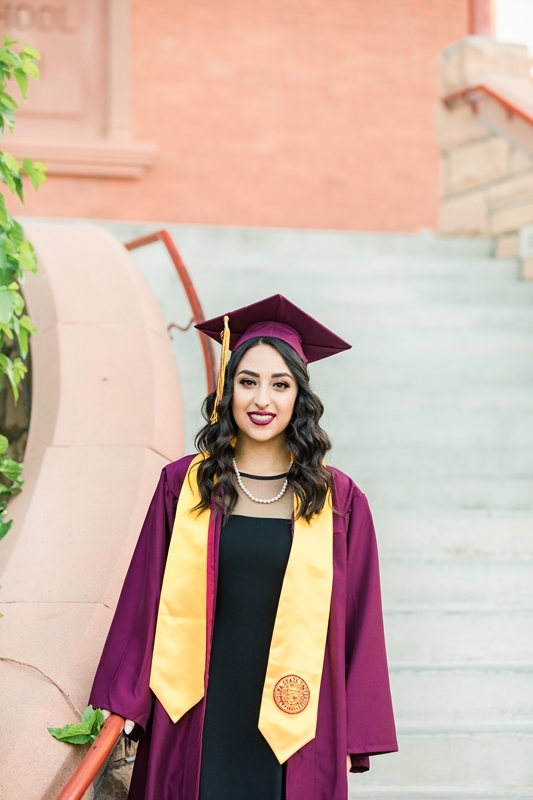 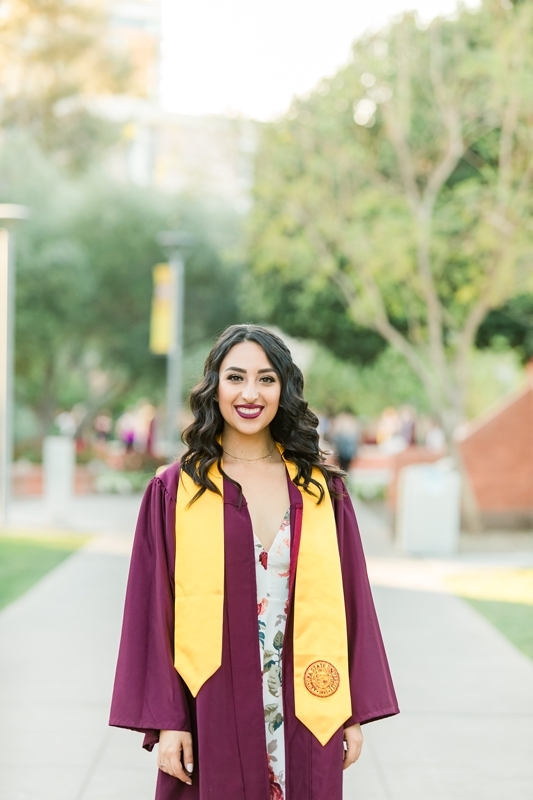 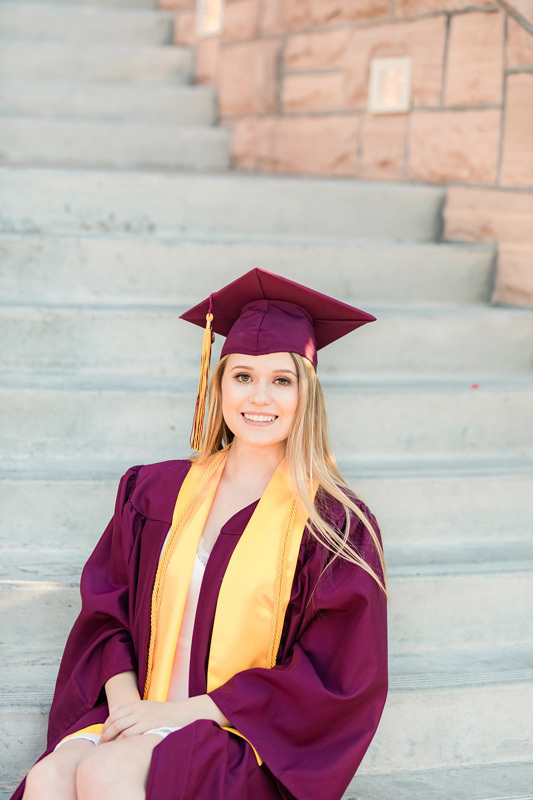 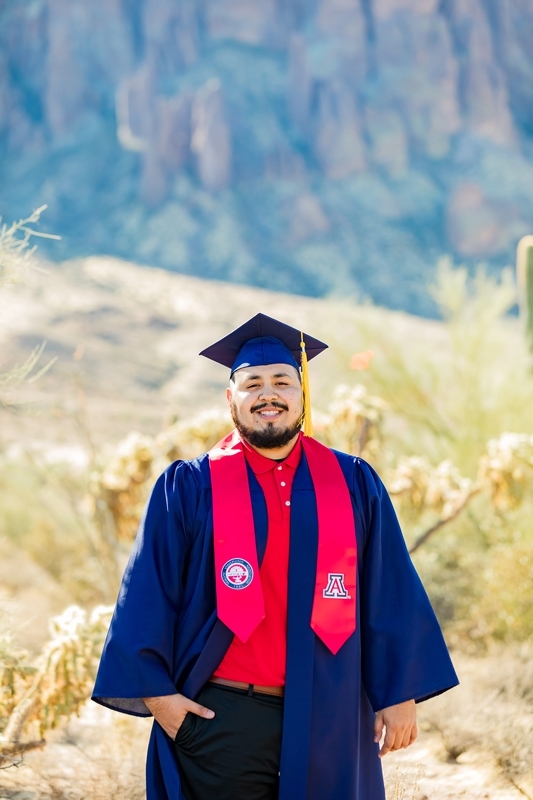 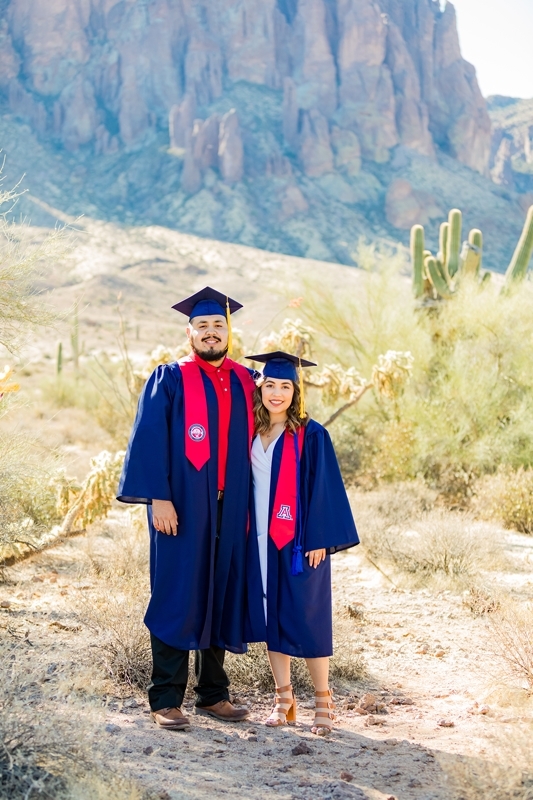 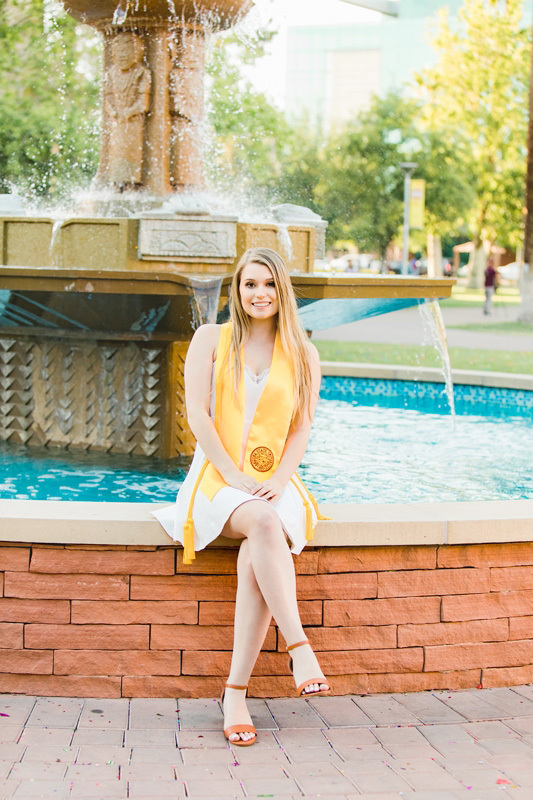 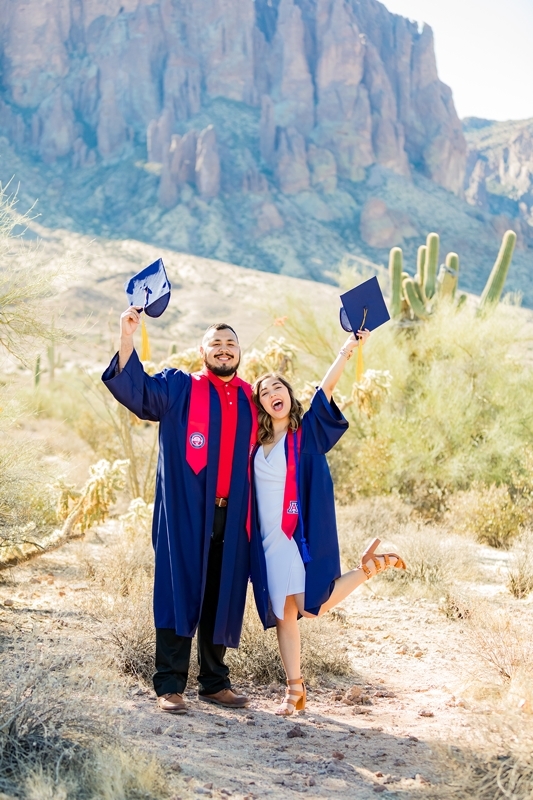 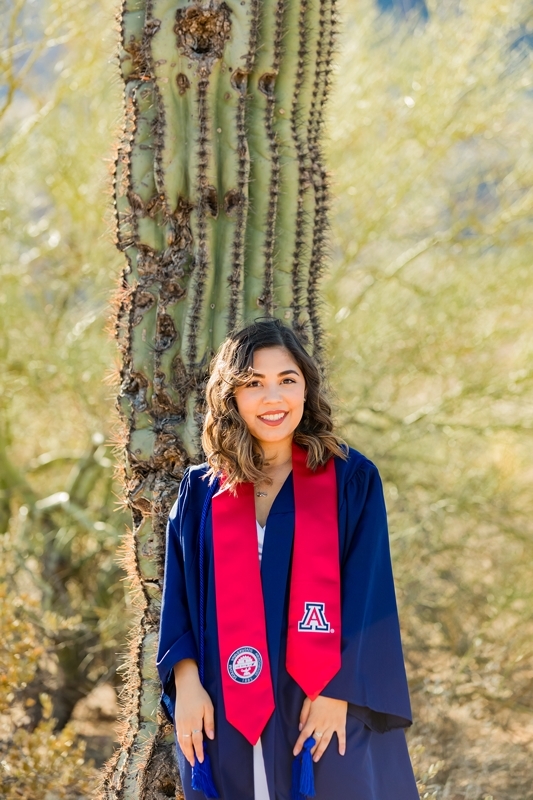 I’m so happy I was able to be her U of A Senior Photographer and I wish her and her boyfriend the best of luck in their bright futures. 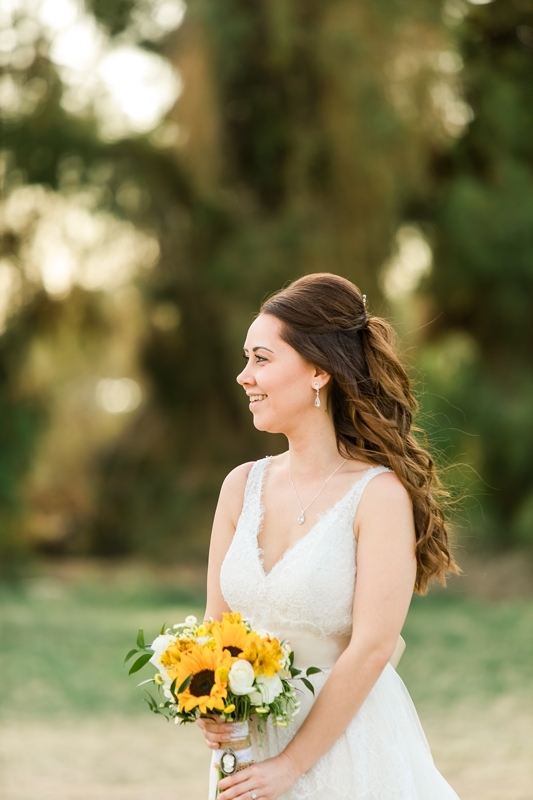 Isn’t Kathy beautiful? 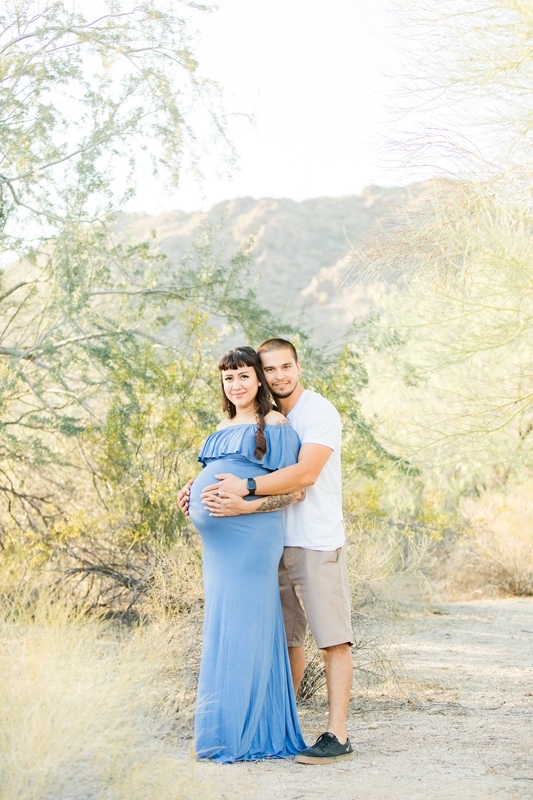 She was glowing like every expectant mother to be! 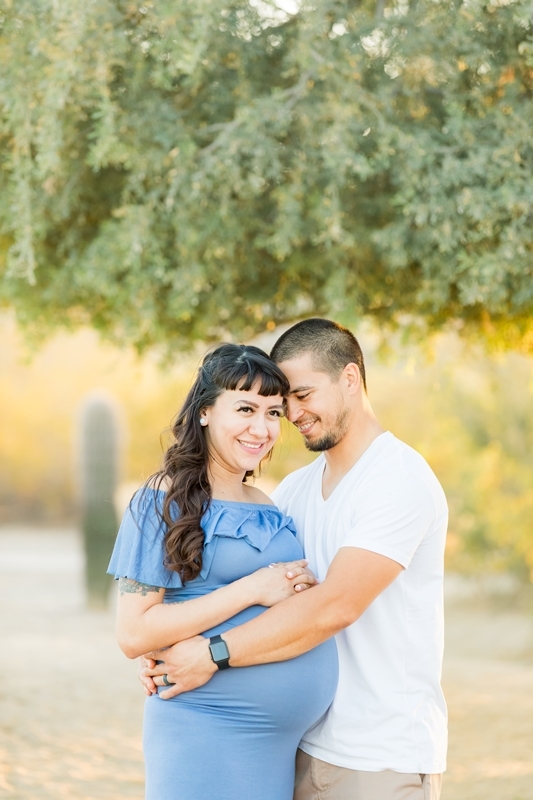 I was so excited she asked me to be her maternity photographer. 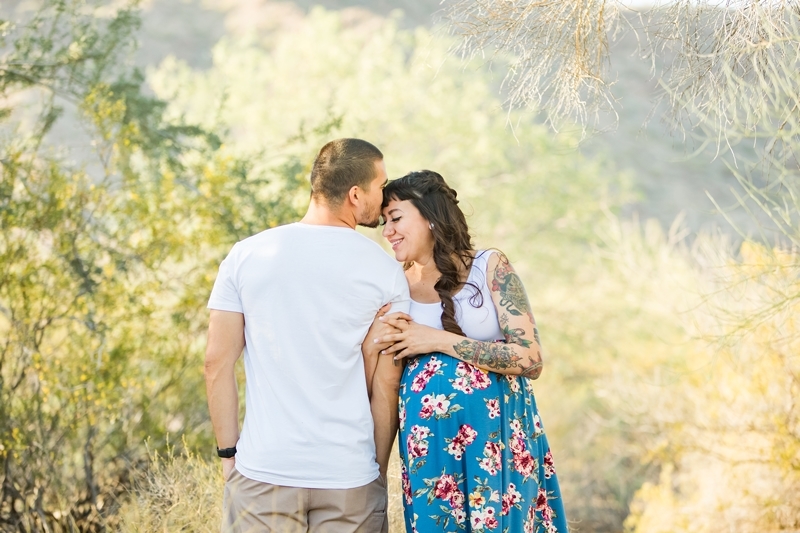 She and her husband were anxiously awaiting their sweet little baby boy. 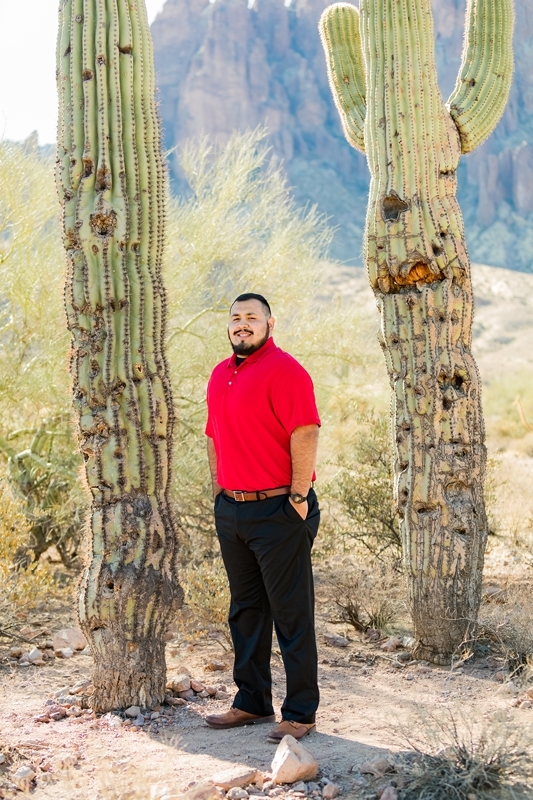 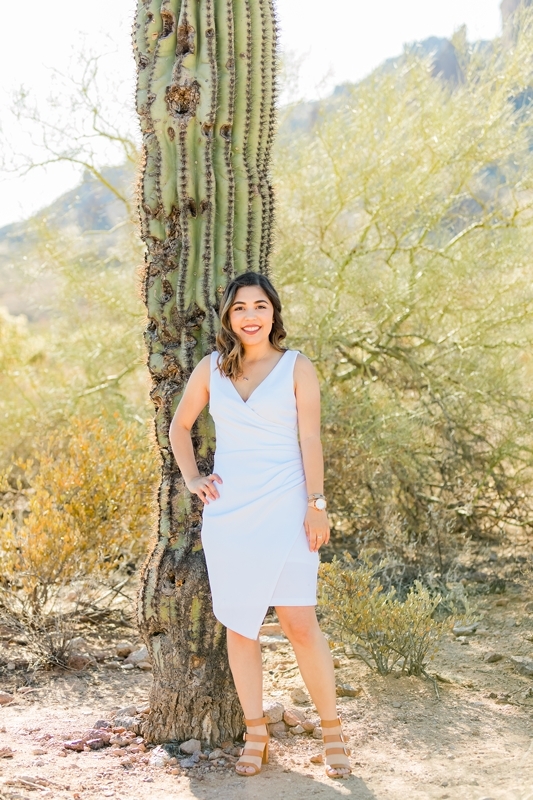 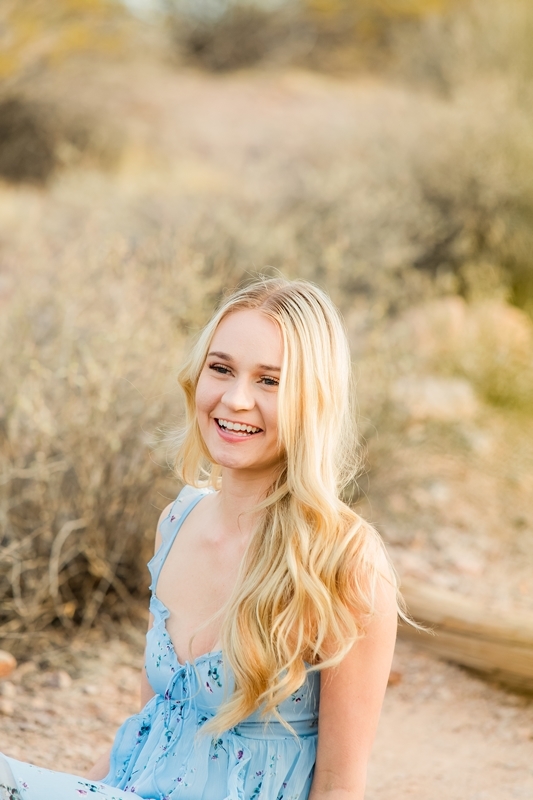 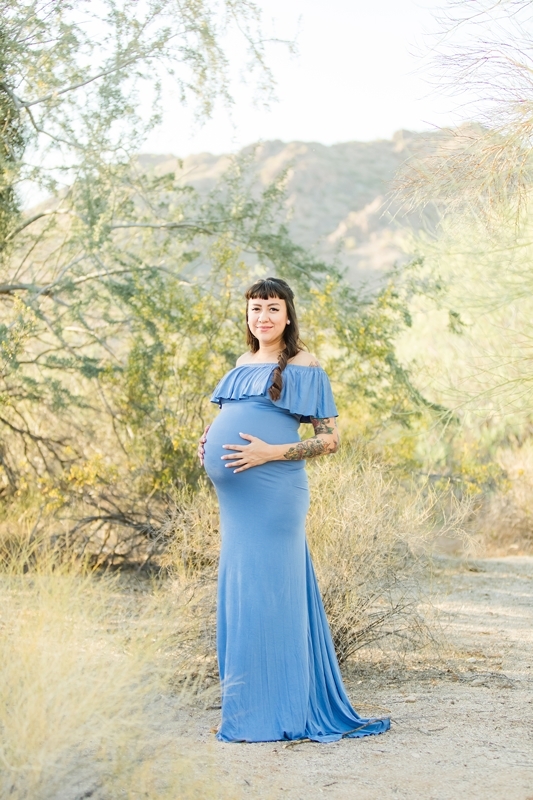 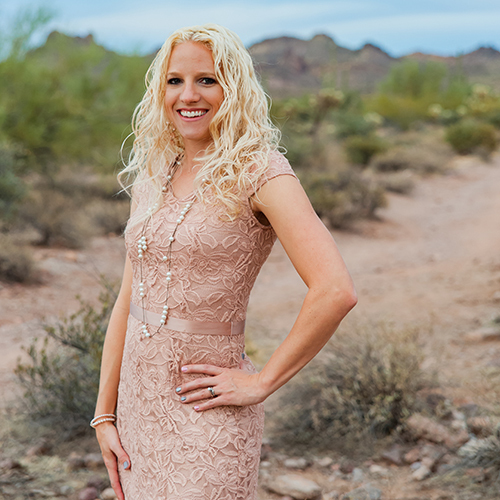 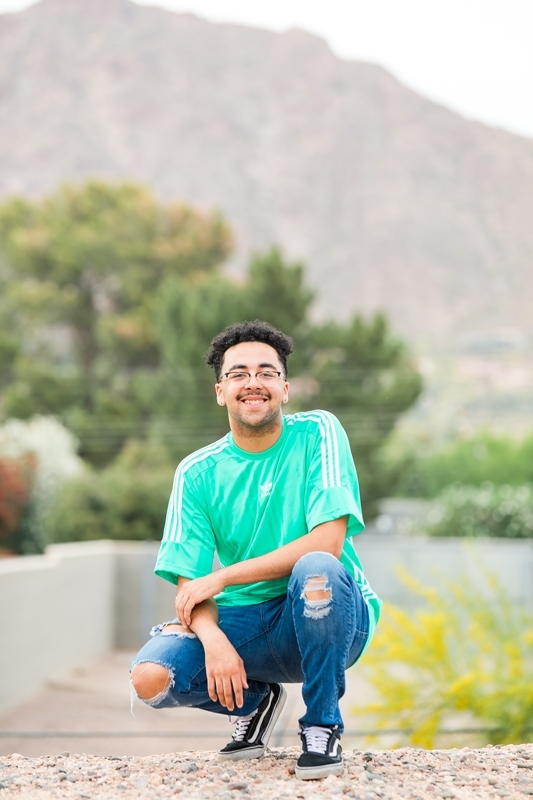 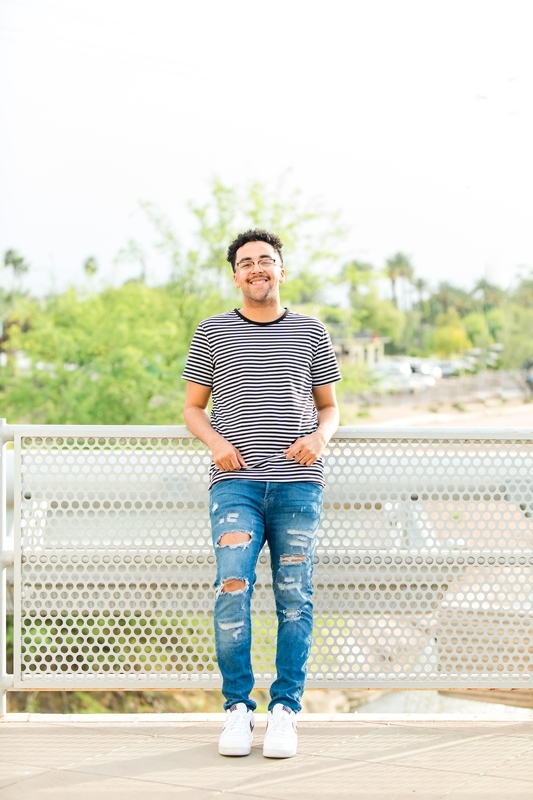 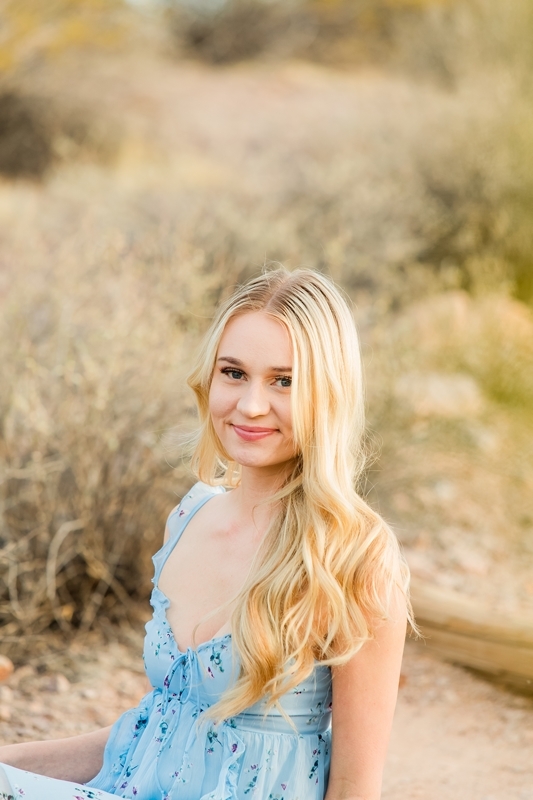 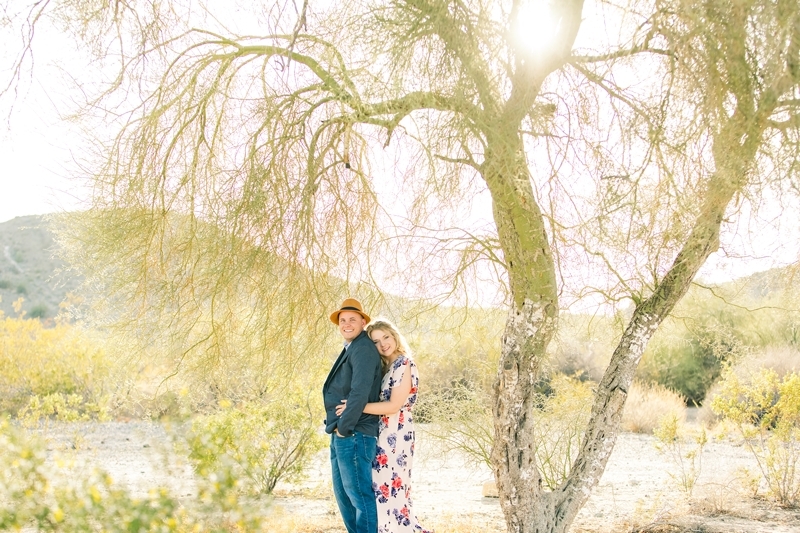 We chose this beautiful desert location for their photos. 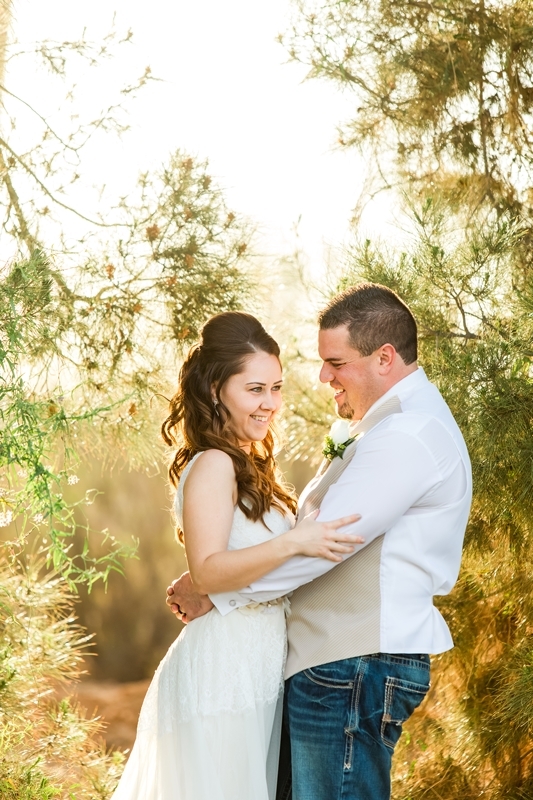 The light was amazing! 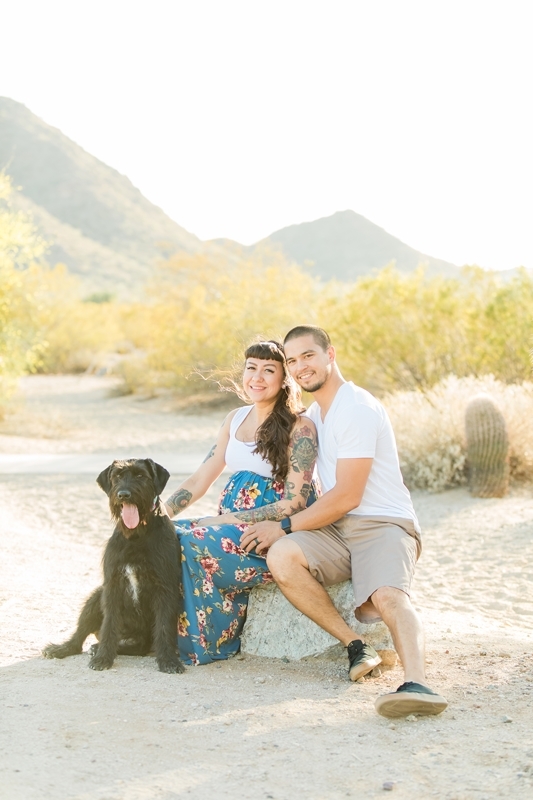 I love that they brought their dog along for some pictures. 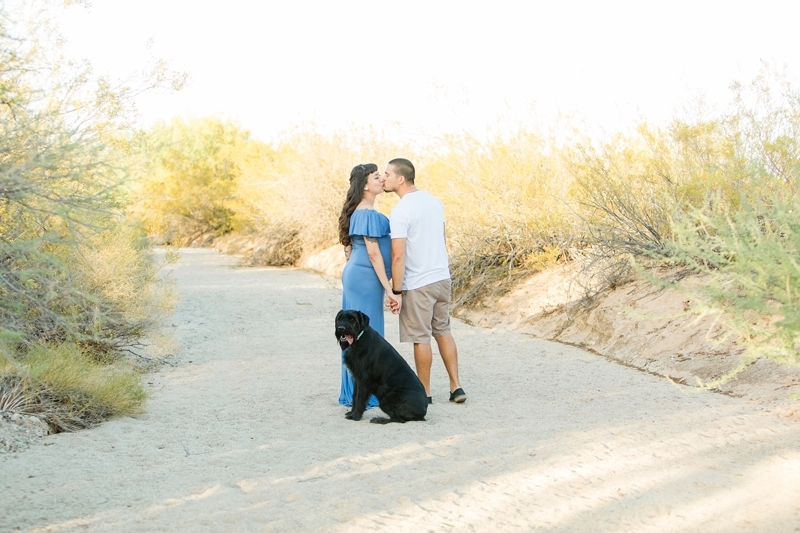 He was having so much fun exploring the area and looking for things to sniff. 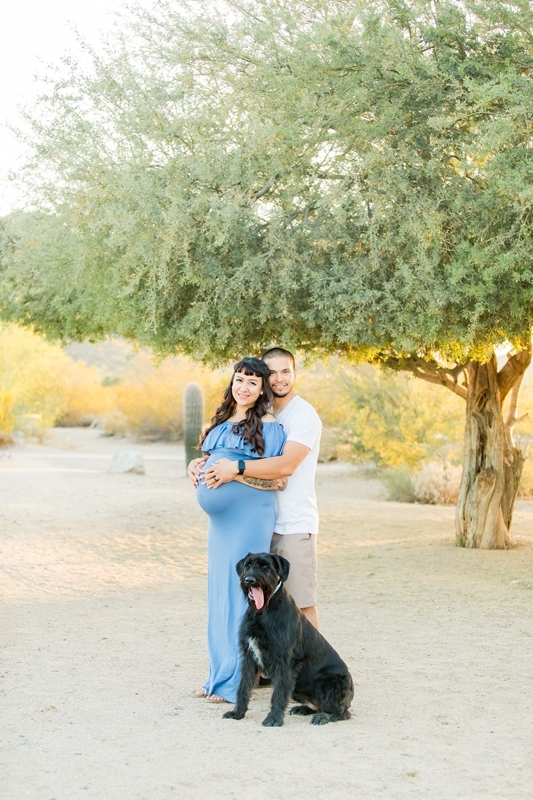 He was actually pretty cooperative too. 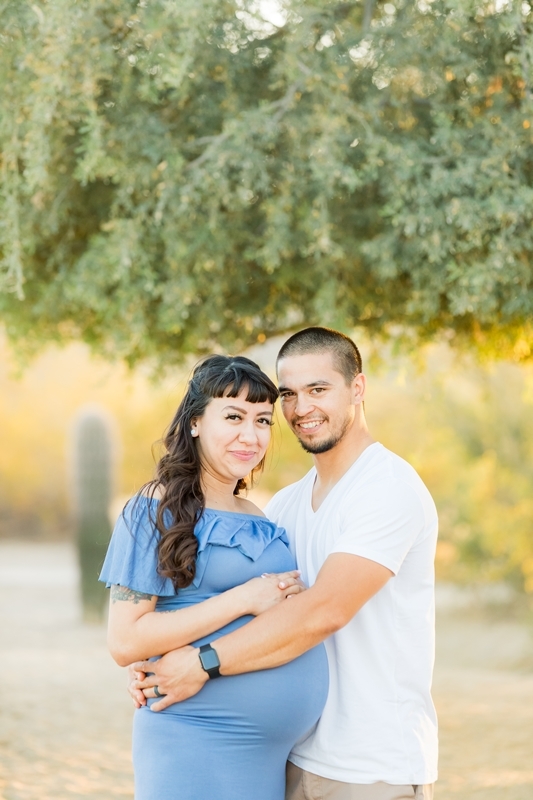 I can’t wait to meet their little boy when he arrives in a few weeks. 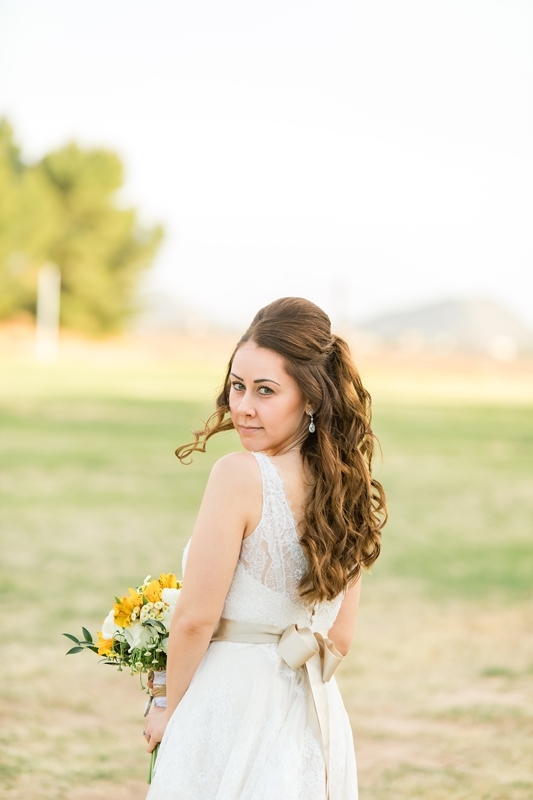 Kathy decided to change dresses at this point in the session. 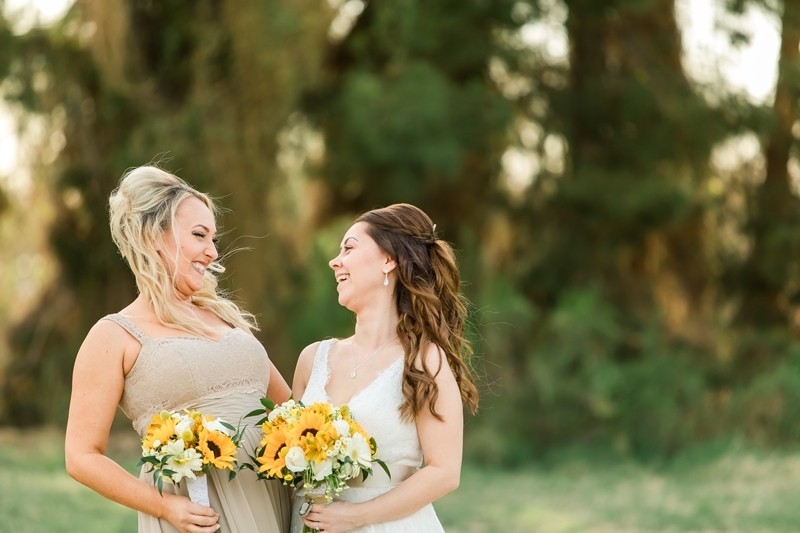 They’re both so pretty! 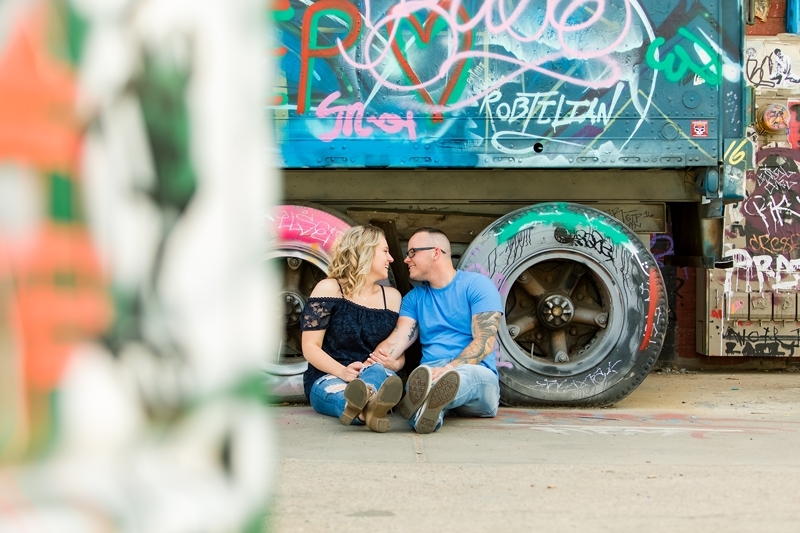 She has excellent taste. 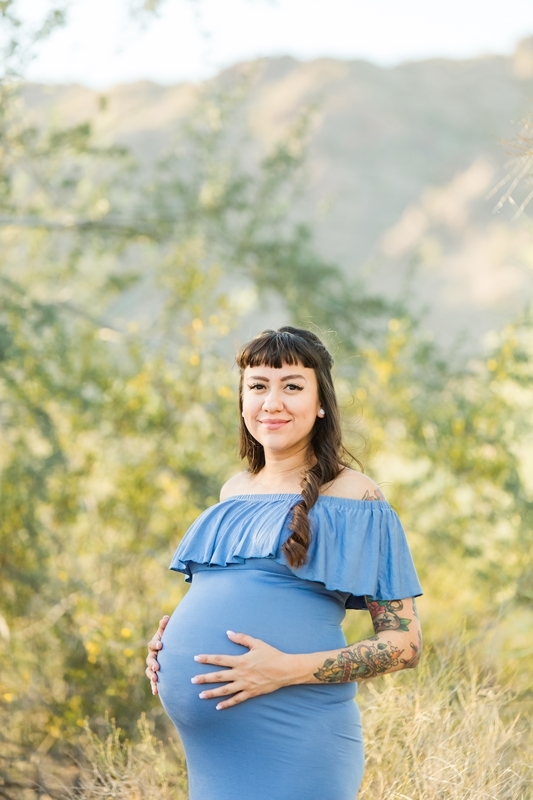 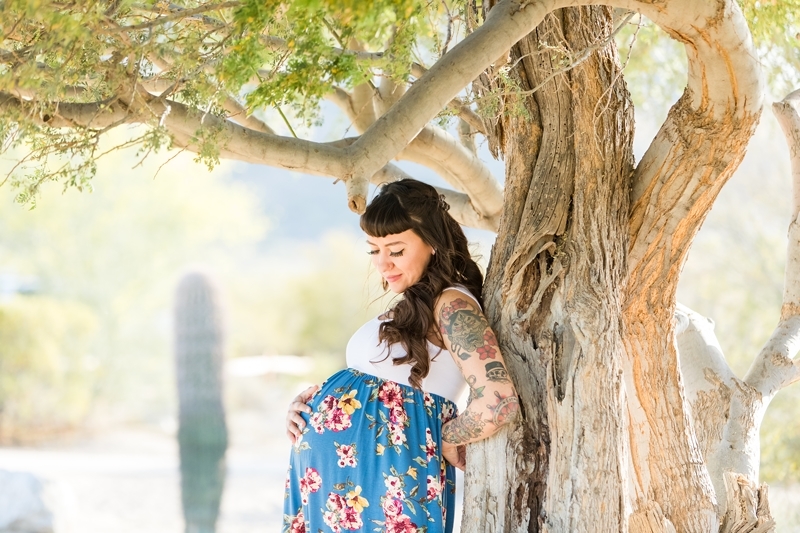 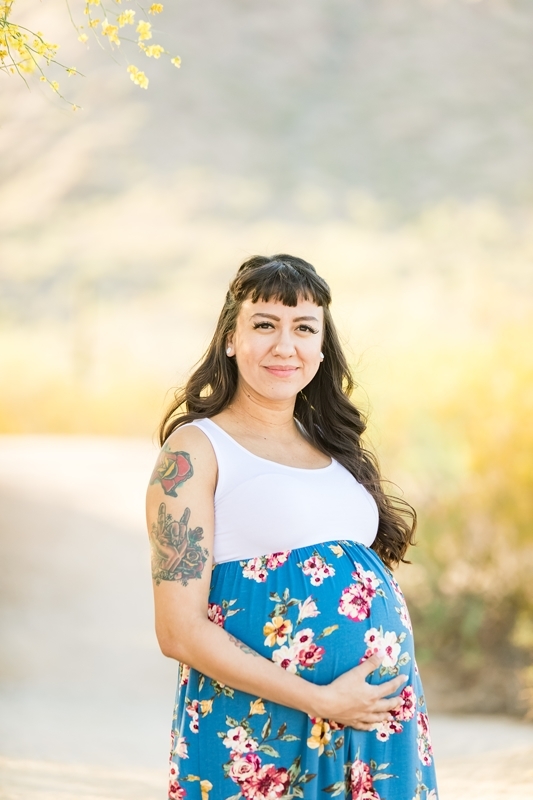 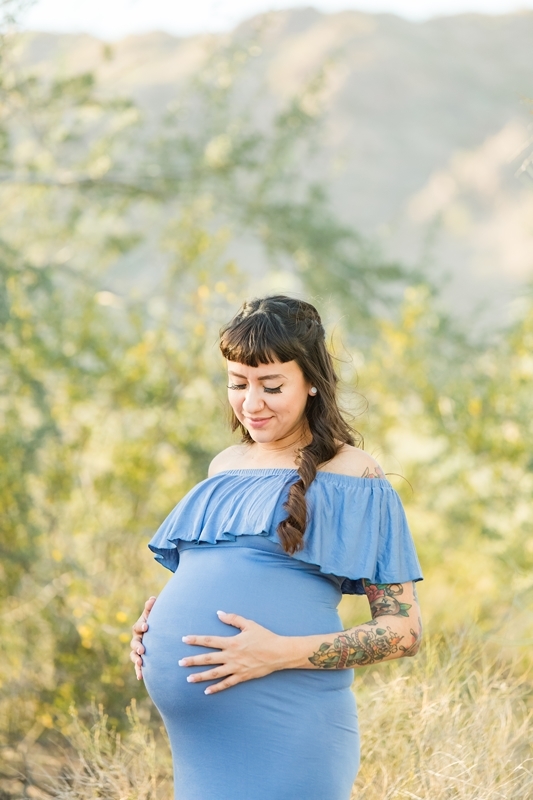 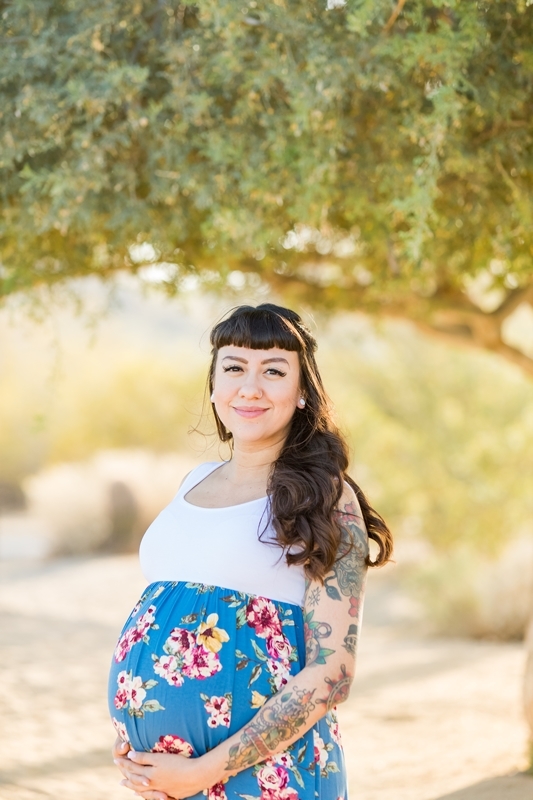 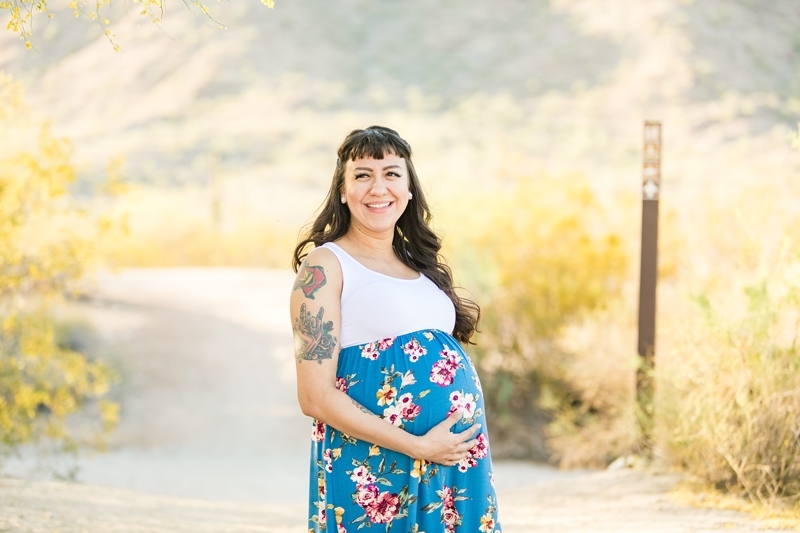 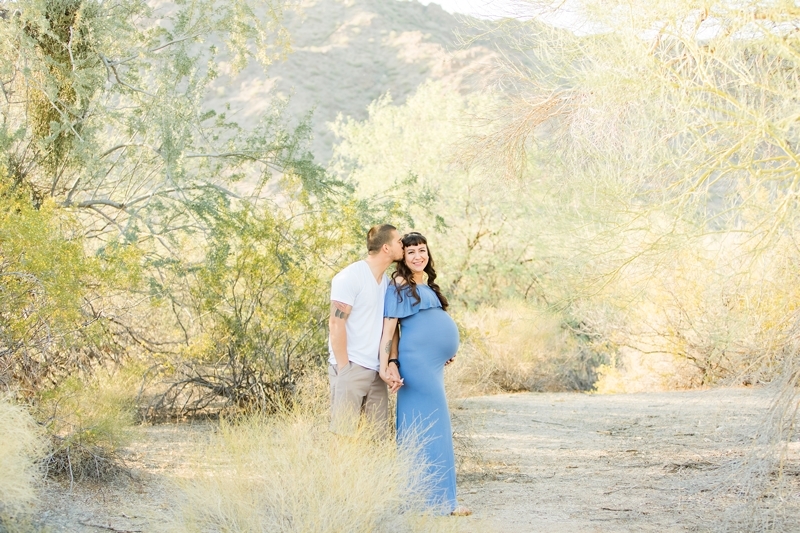 Thanks so much for a great maternity session! 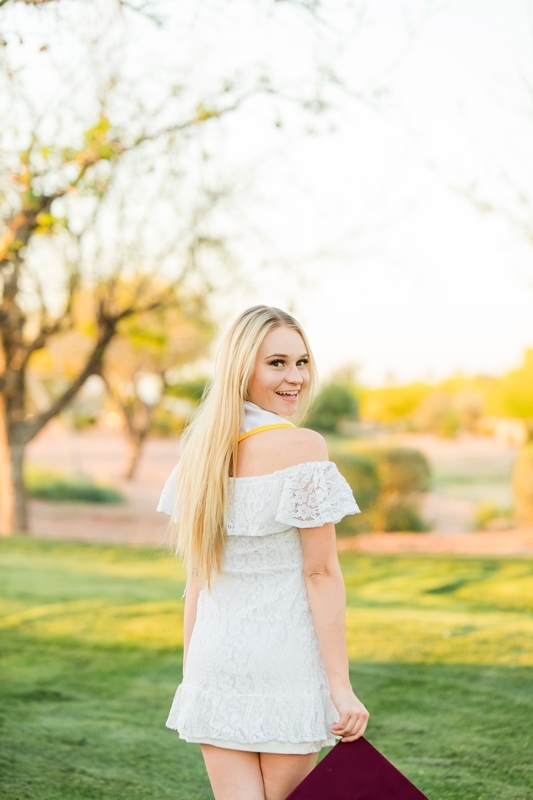 I had so much fun taking your pictures! 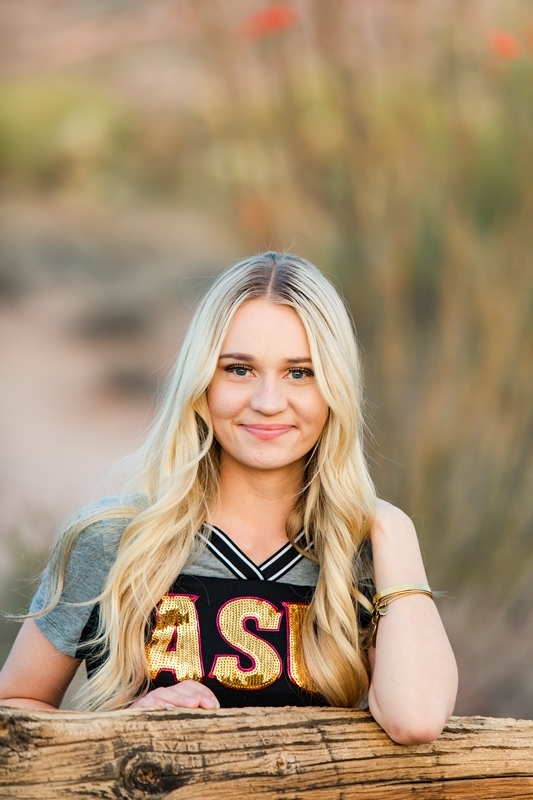 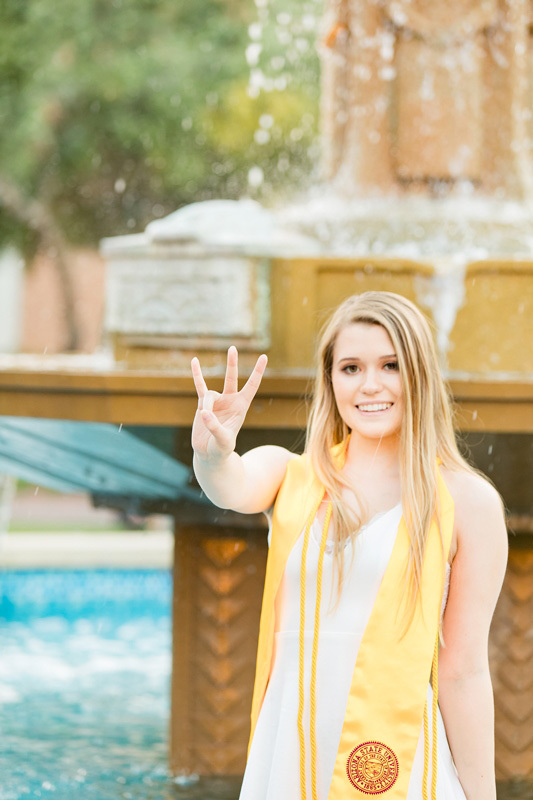 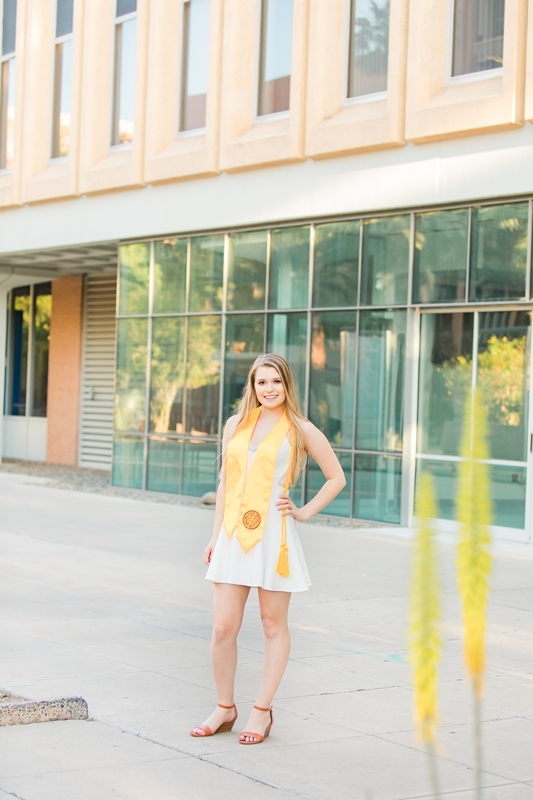 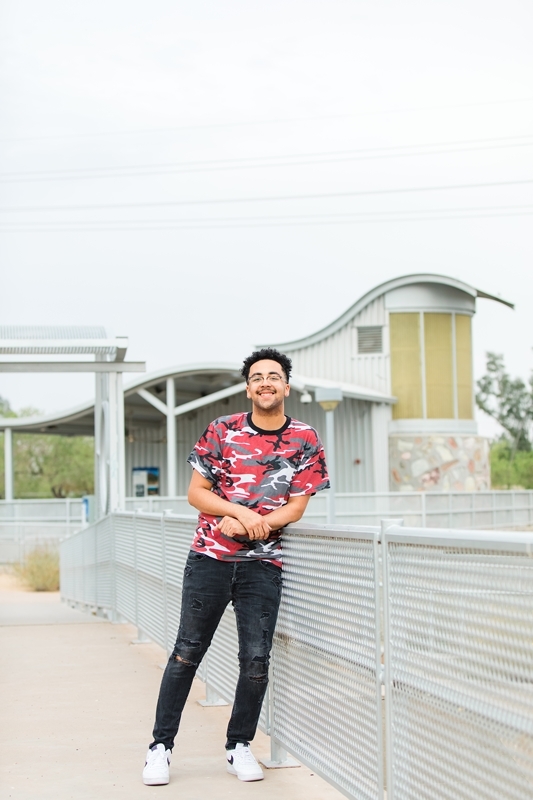 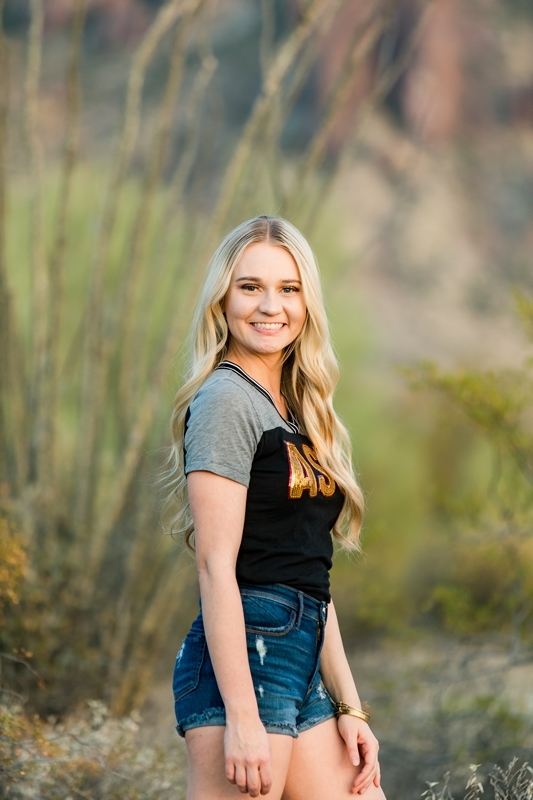 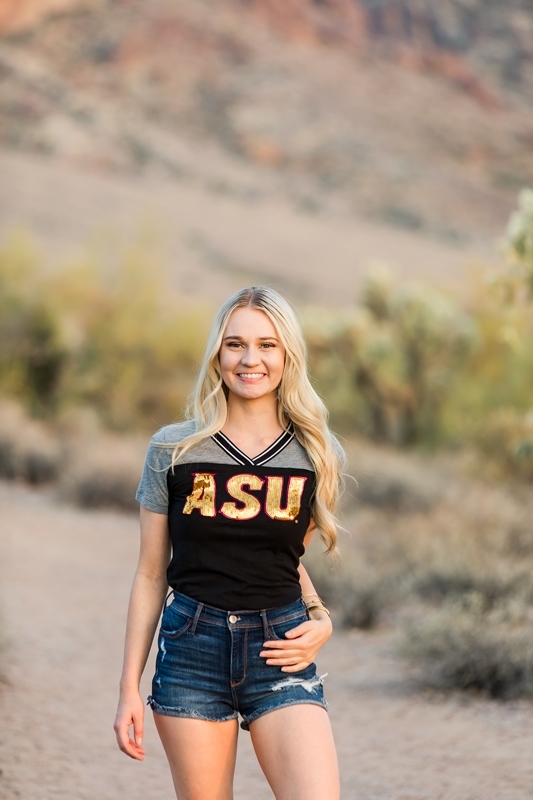 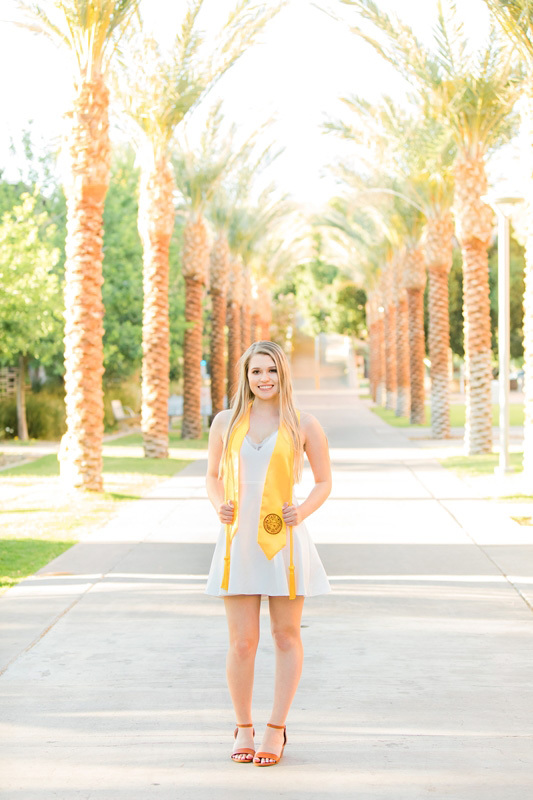 I had so much fun with Taylor for her ASU senior photography session. 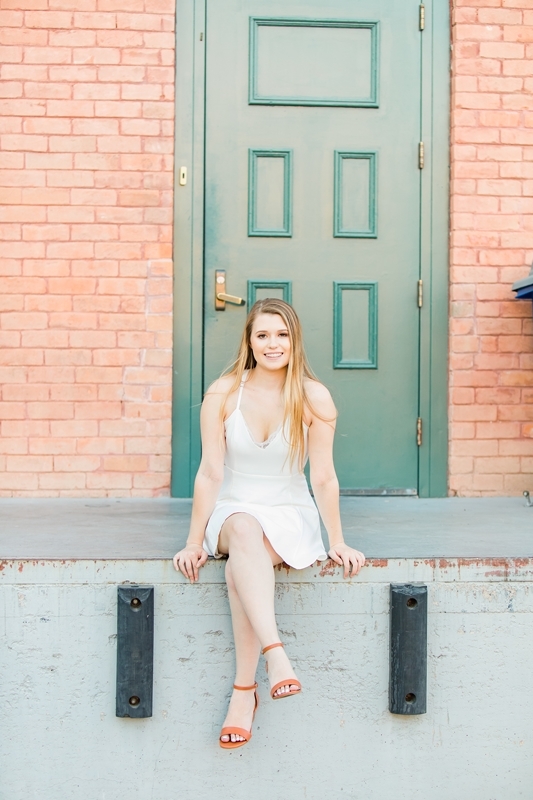 She is a sweet and beautiful girl with lots of big plans for her future! 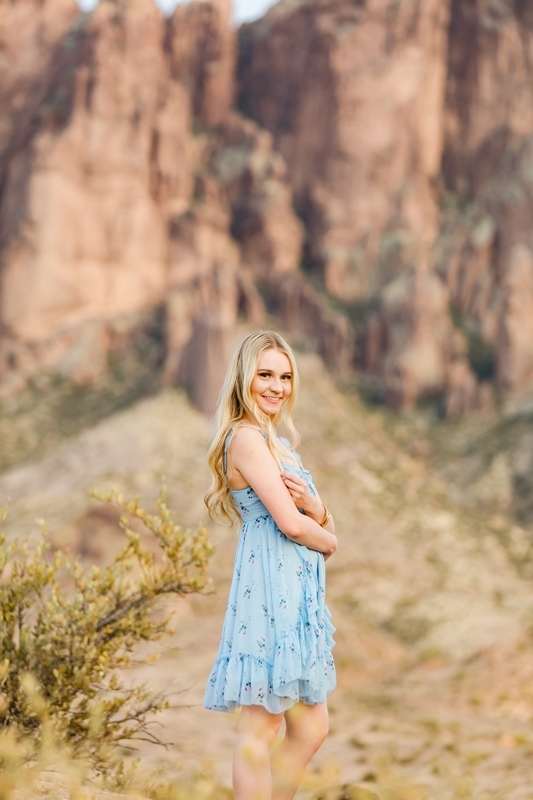 She had the cutest blue dress that looked amazing against the colorful mountain views. 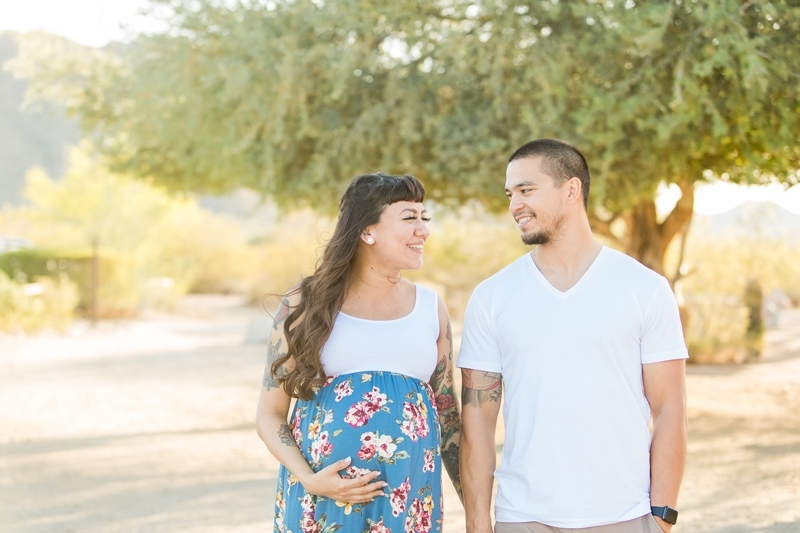 Planning everything for portrait sessions is a lot of work and can be stressful. 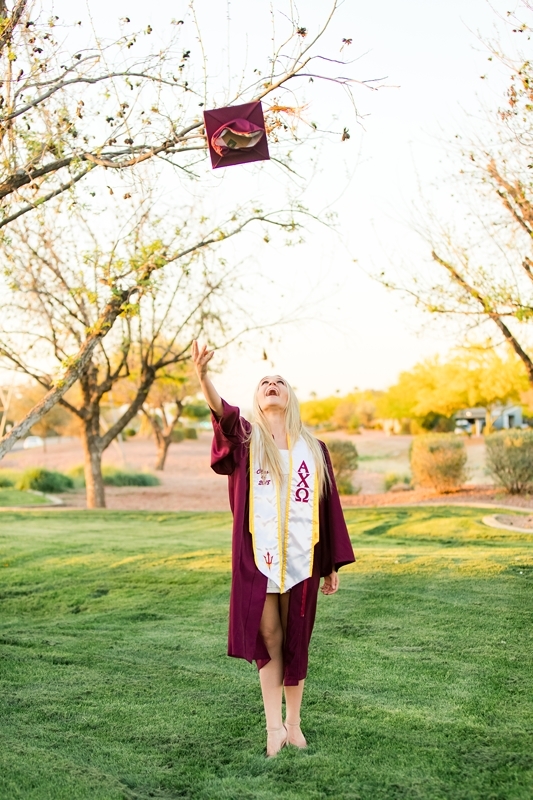 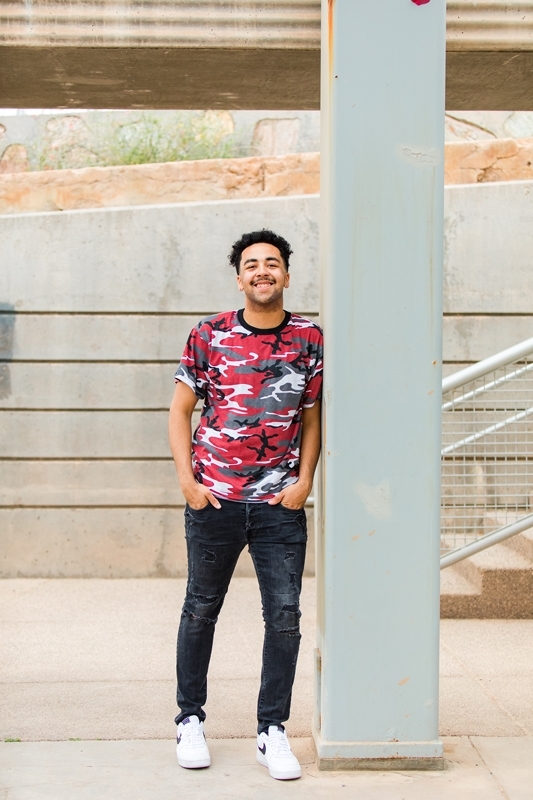 Add that to finishing up classes at ASU and it’s only natural that an important outfit would be forgotten. 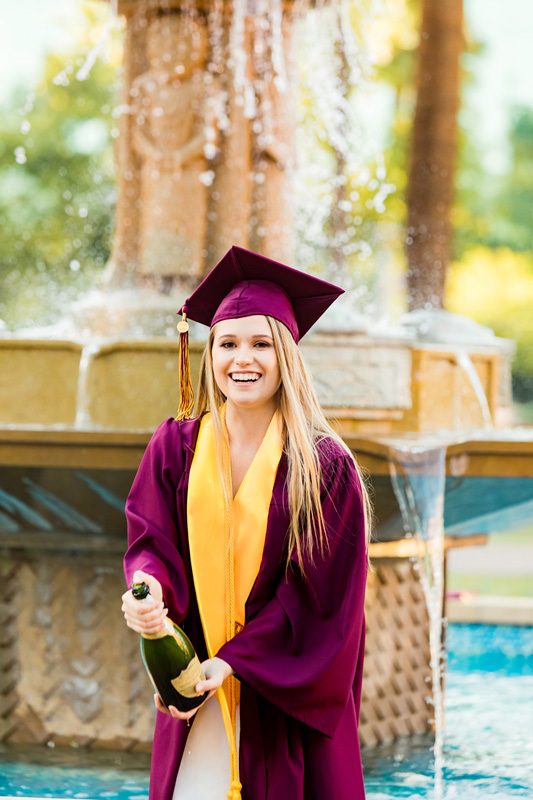 Taylor was so sad that she left her cap and gown at home. 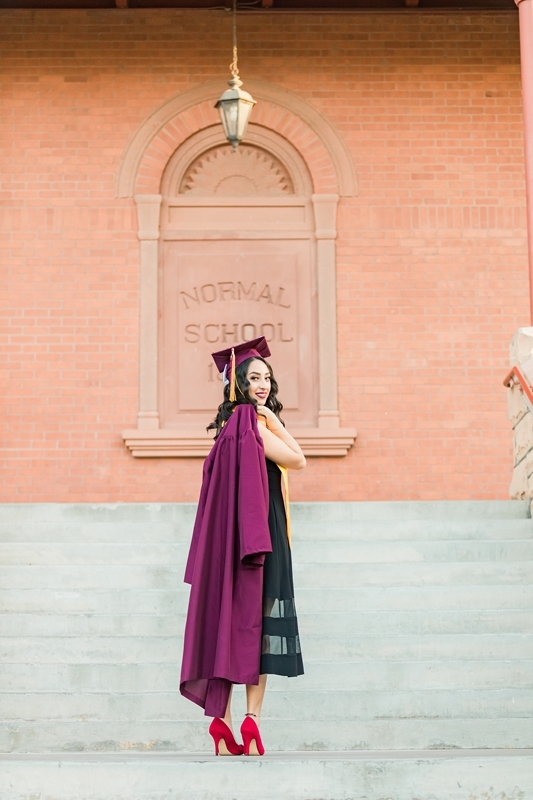 I could tell she was really disappointed so I had her come out by my house to take a few quick pictures in her cap and gown on a different day. 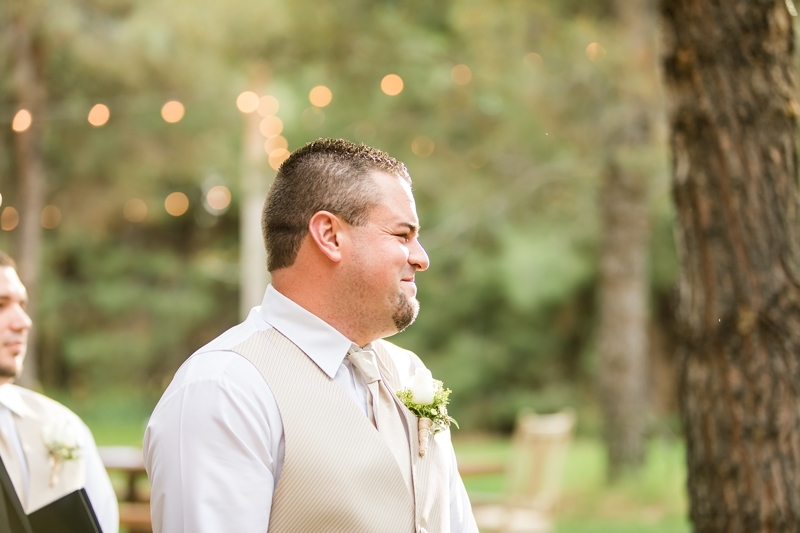 I’m so glad we did that. 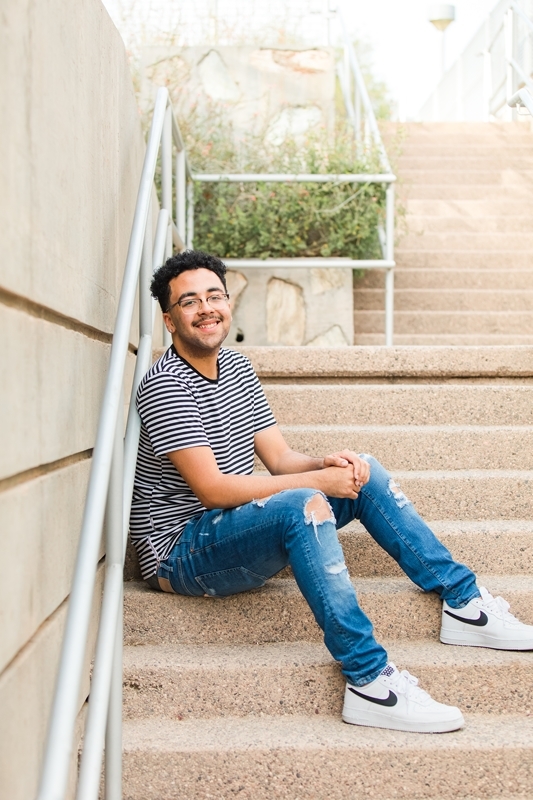 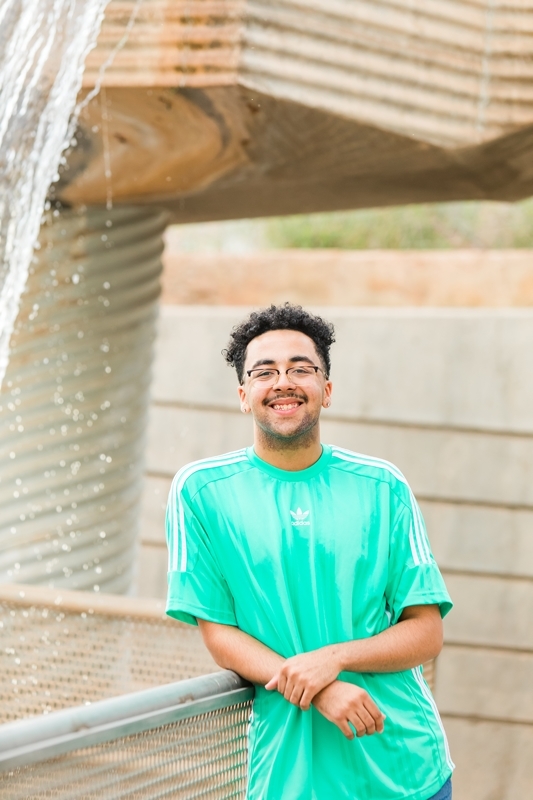 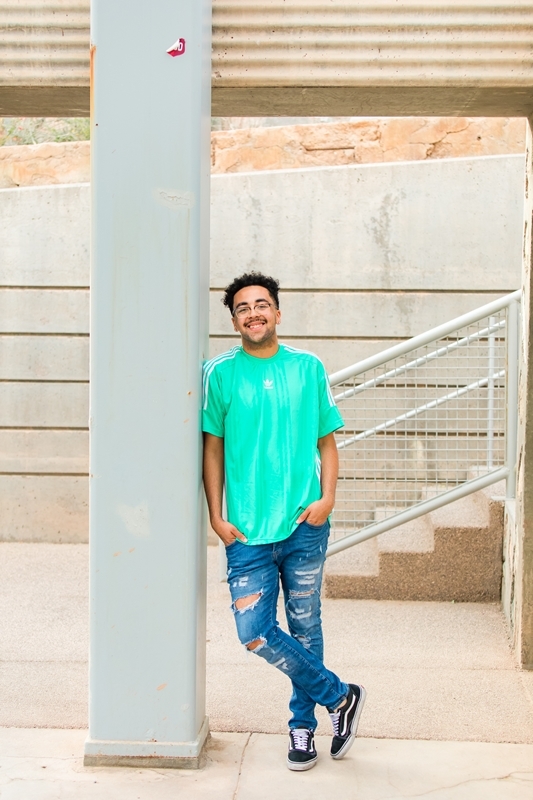 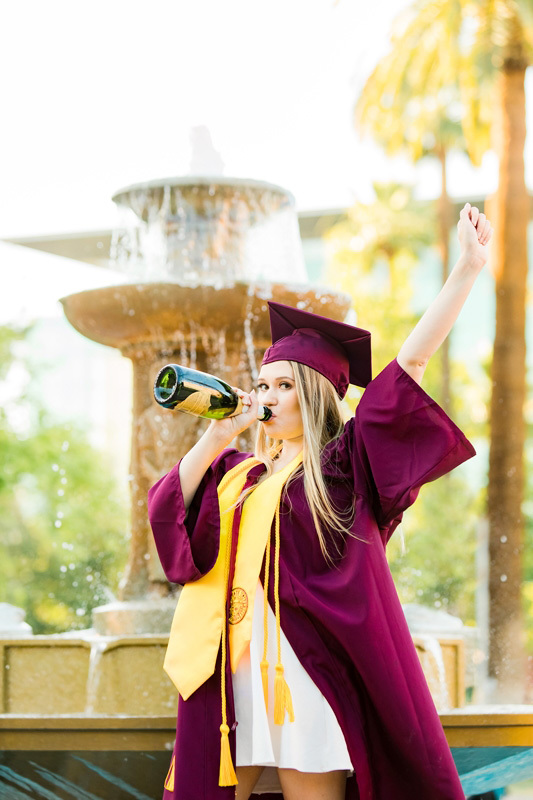 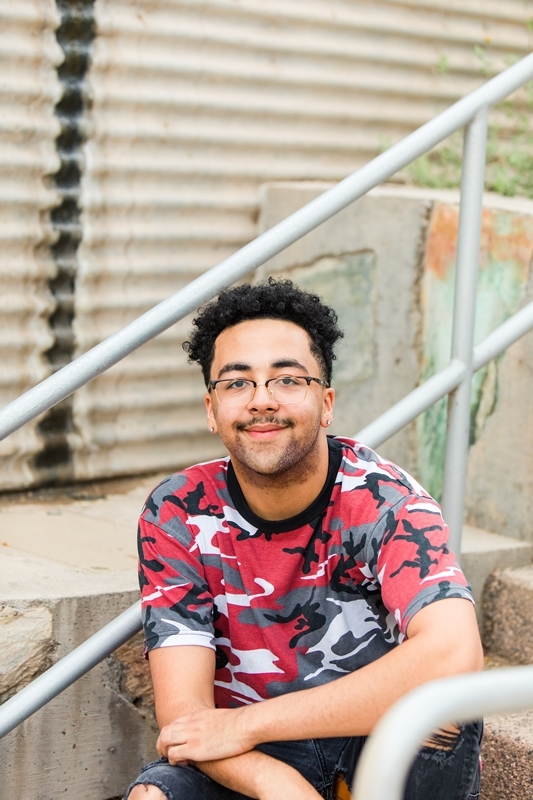 It’s an important part of graduation pictures. 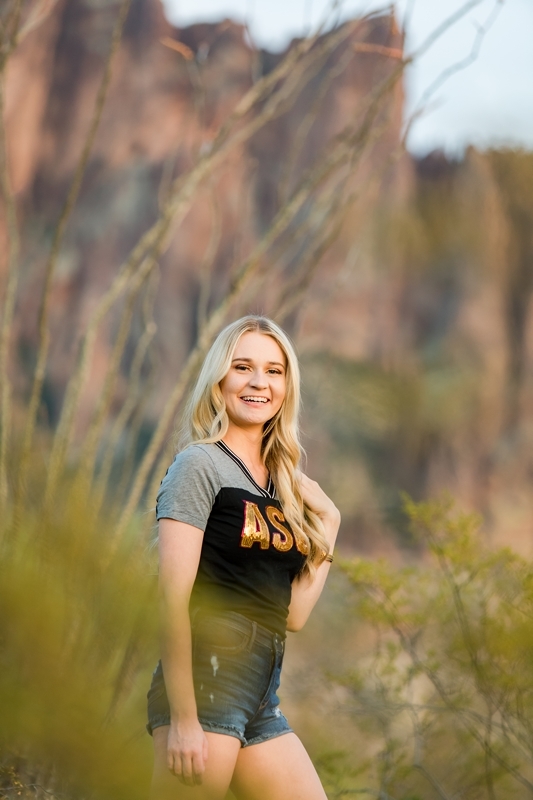 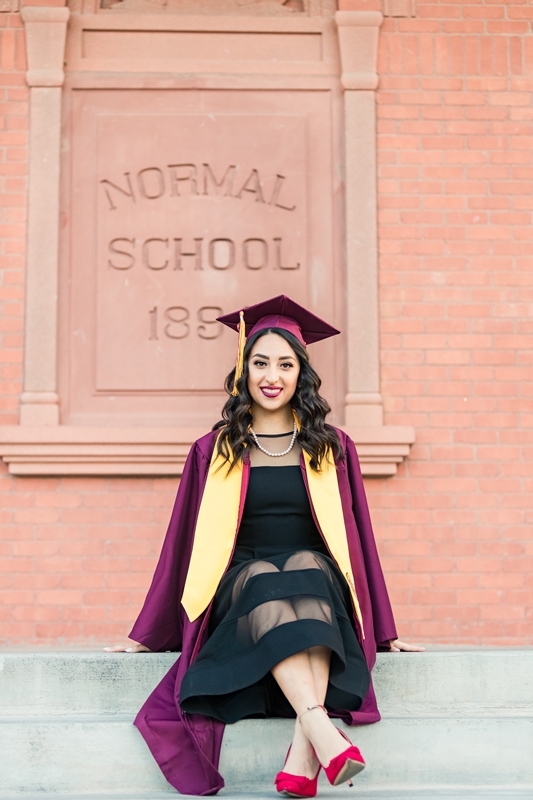 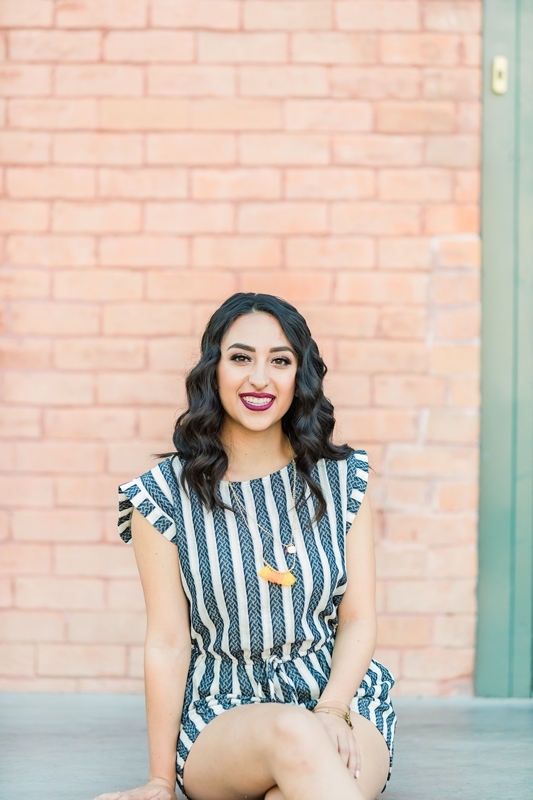 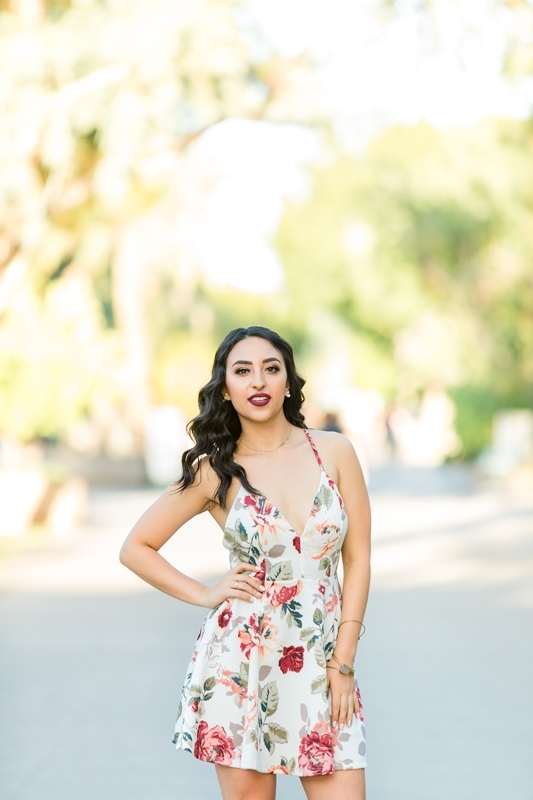 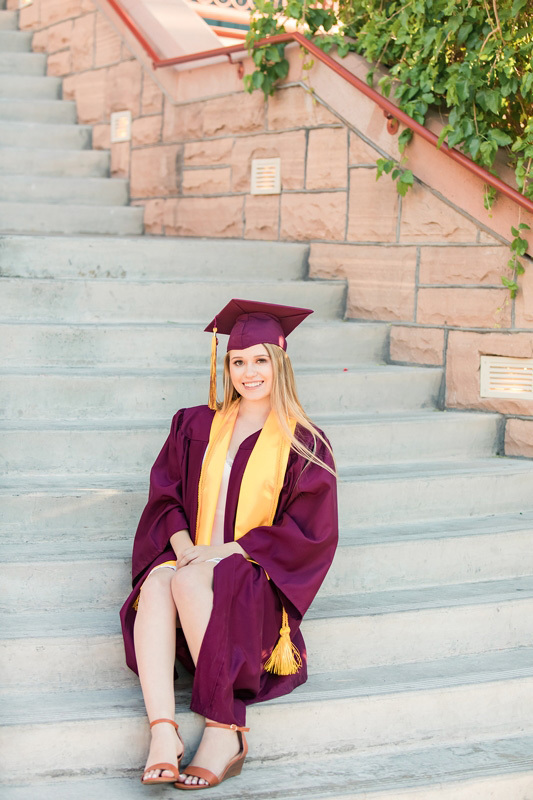 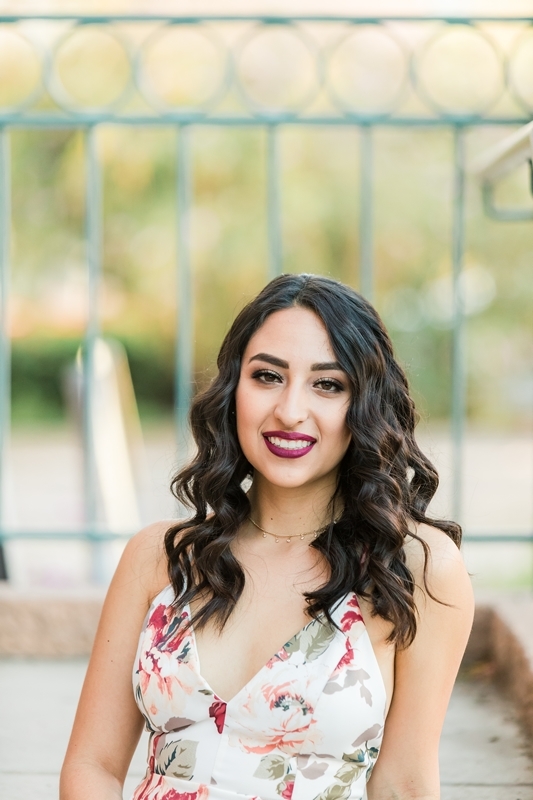 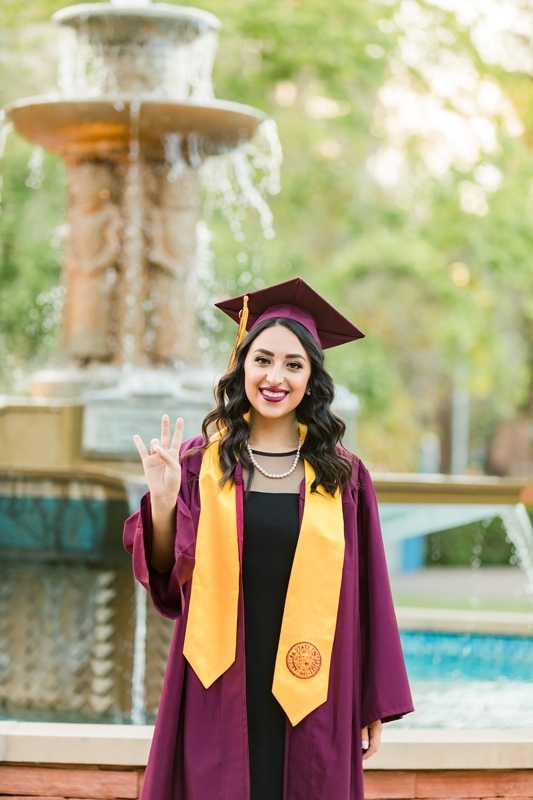 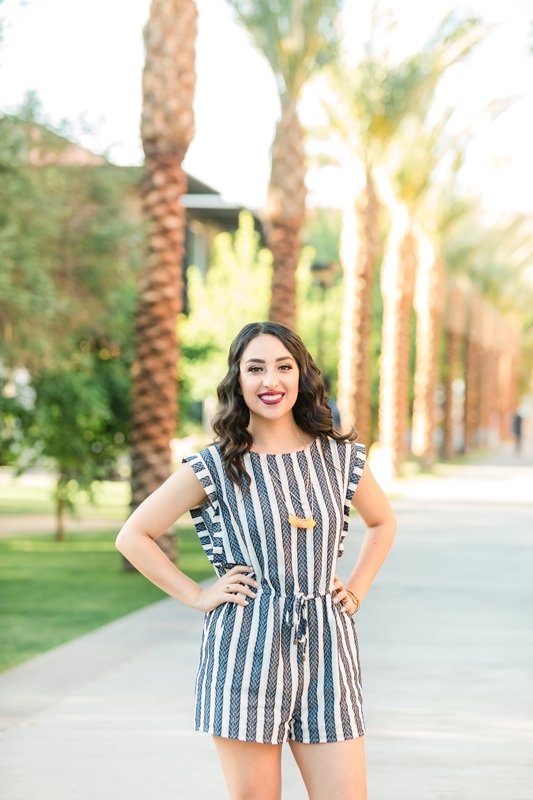 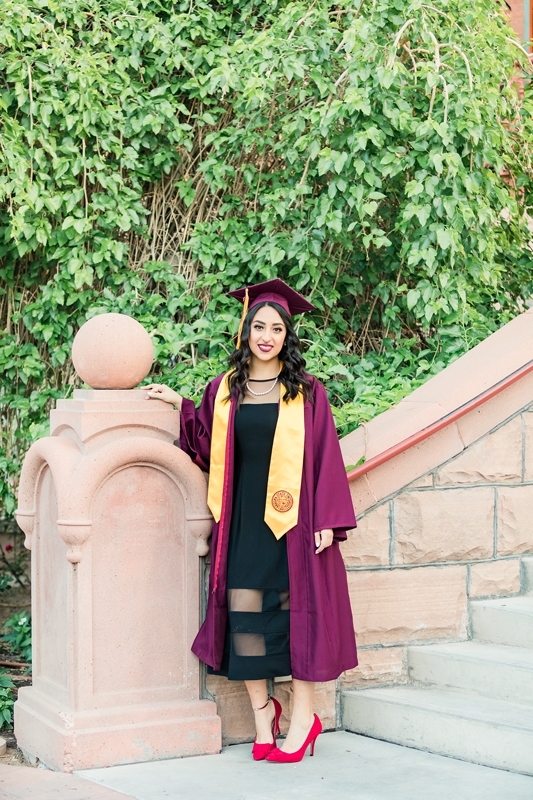 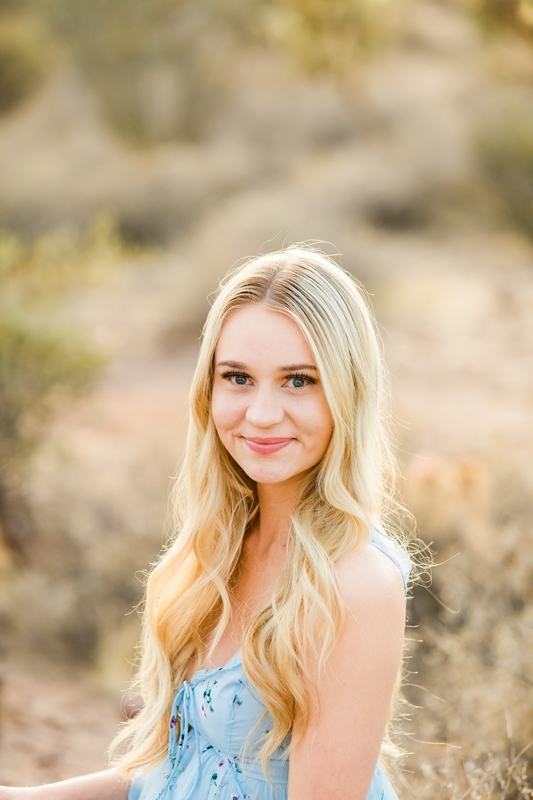 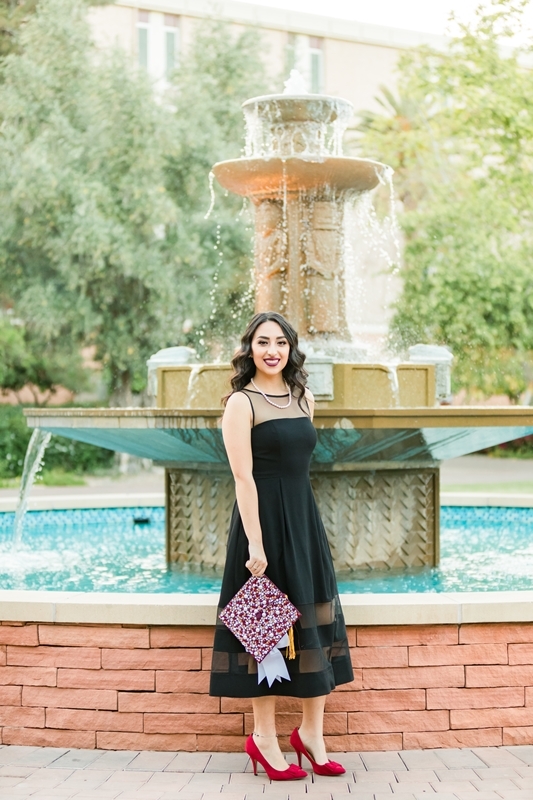 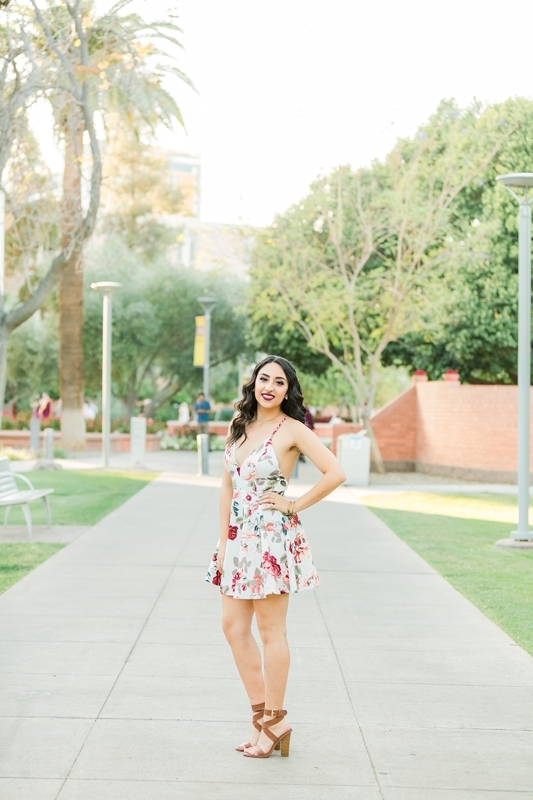 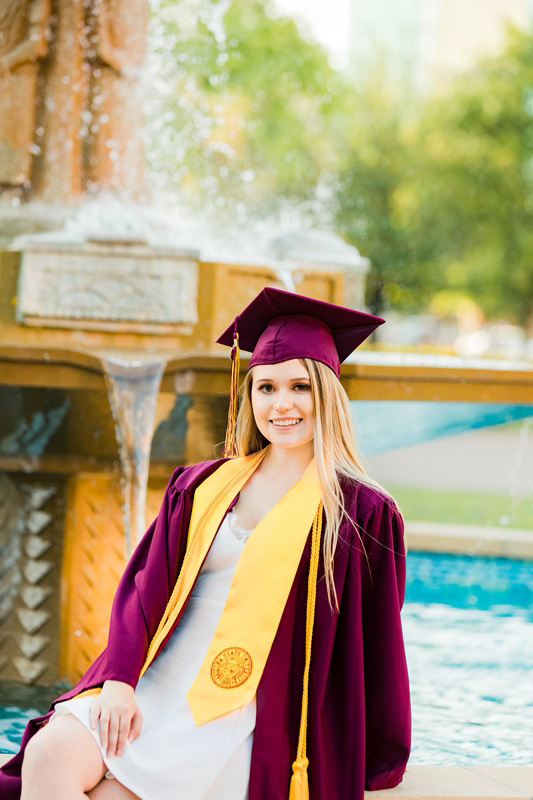 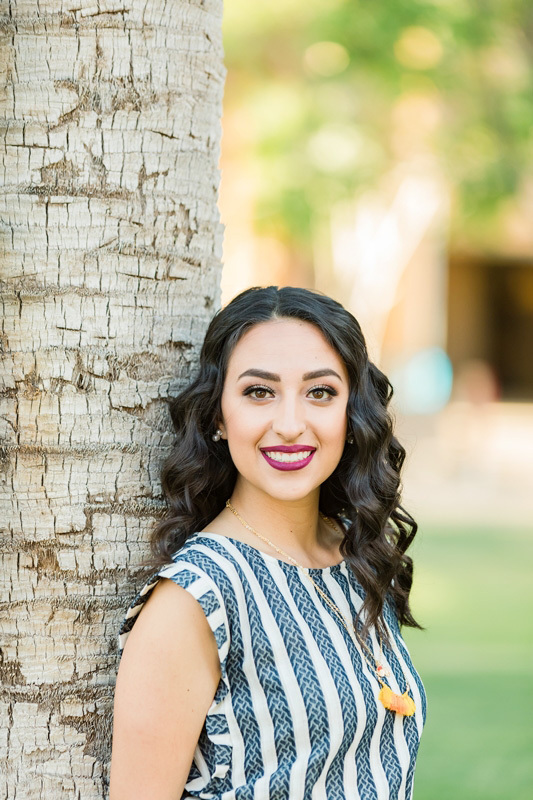 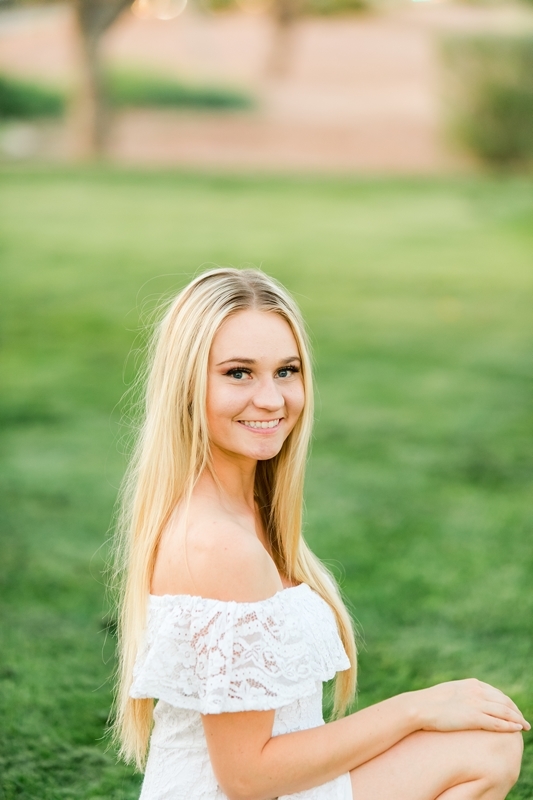 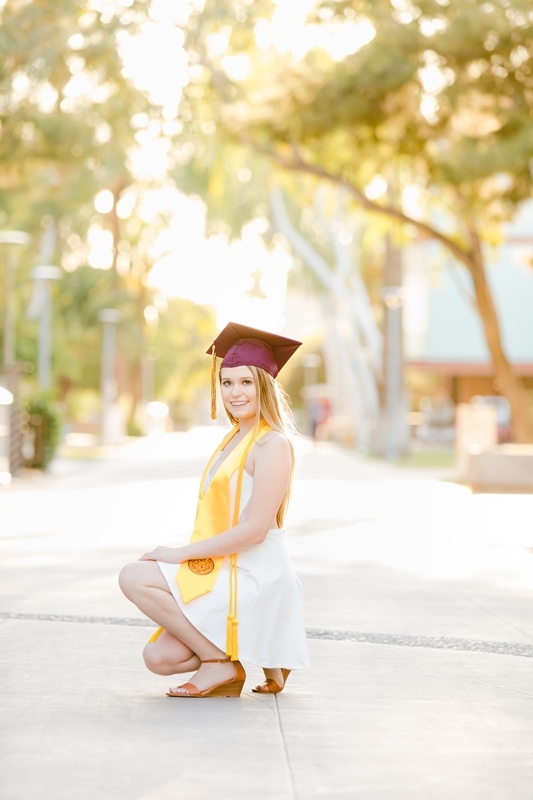 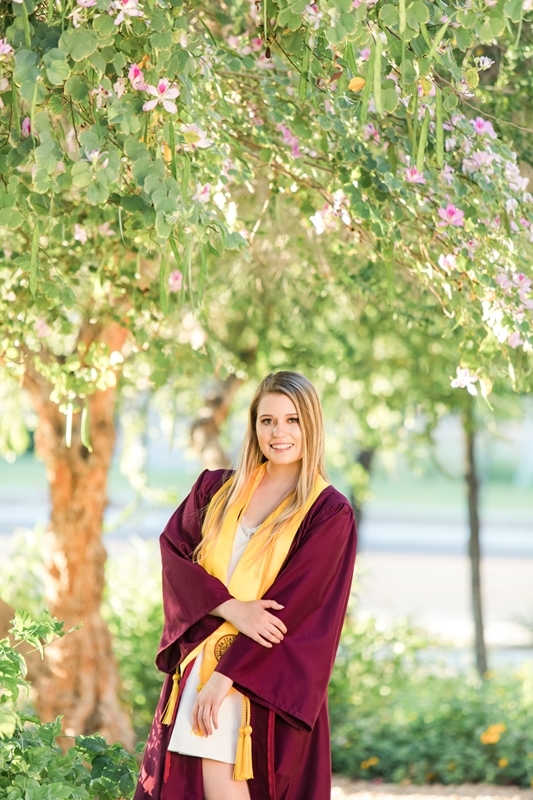 I’m so happy I got to meet her and be her ASU Senior Portrait Photographer! 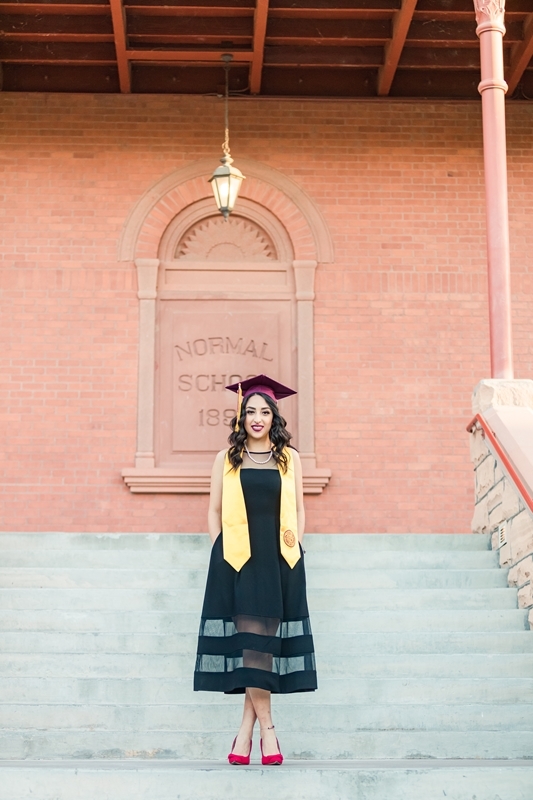 I wish her the best in her bright future. 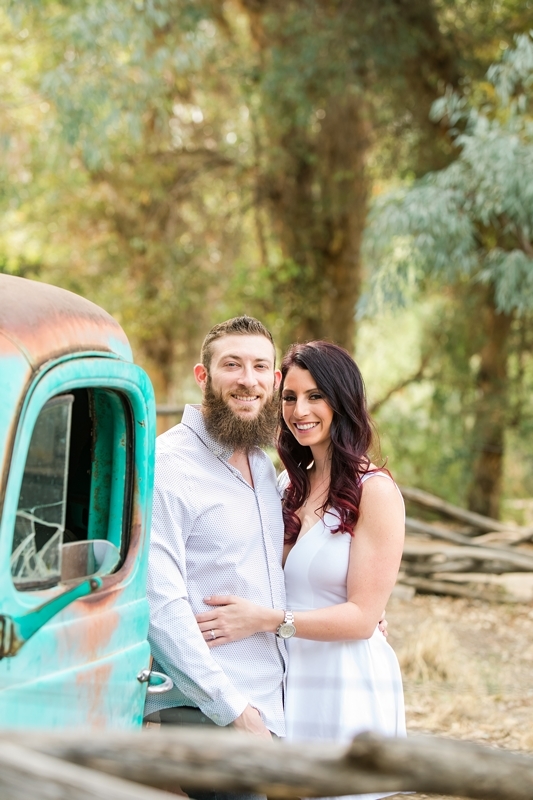 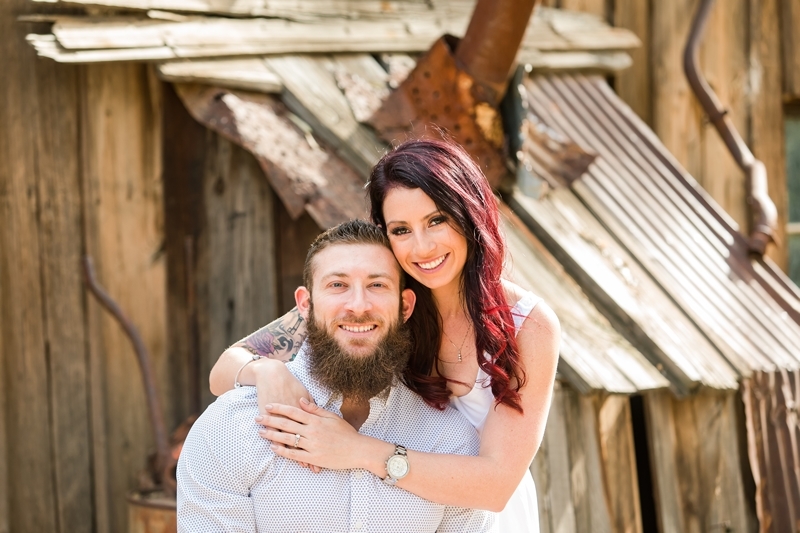 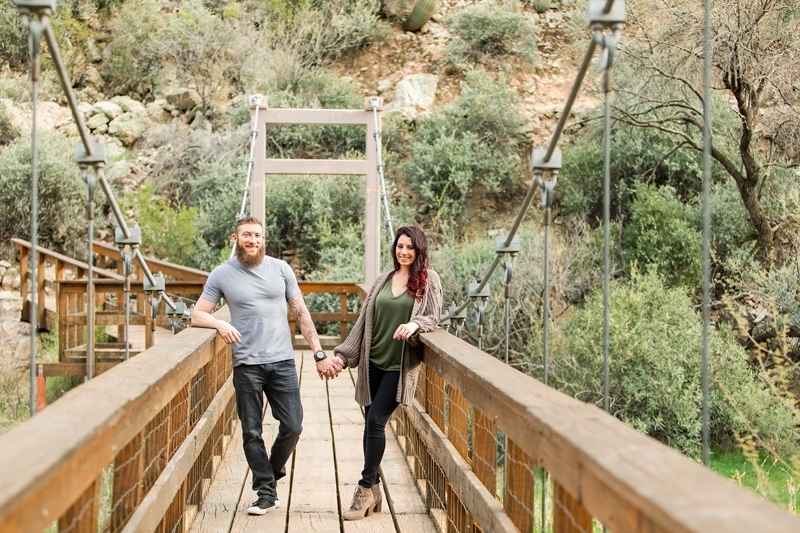 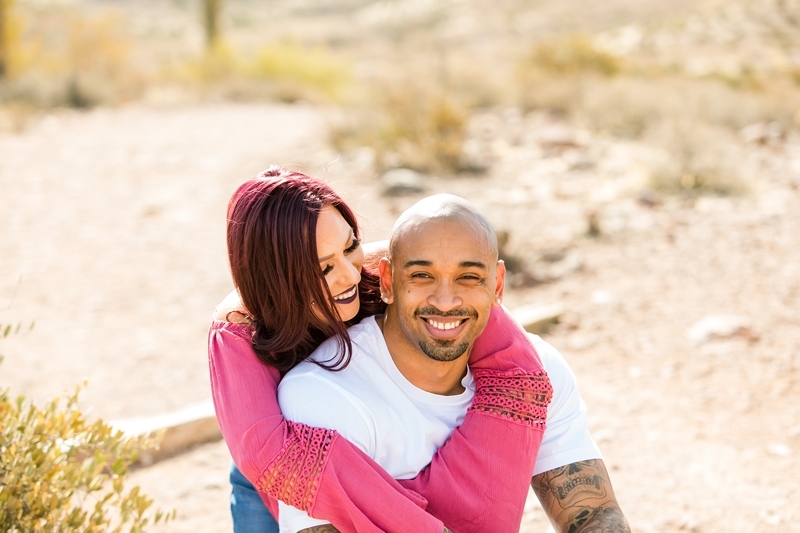 Jordan & Hailey’s Phoenix Engagement Photography Session was a blast! 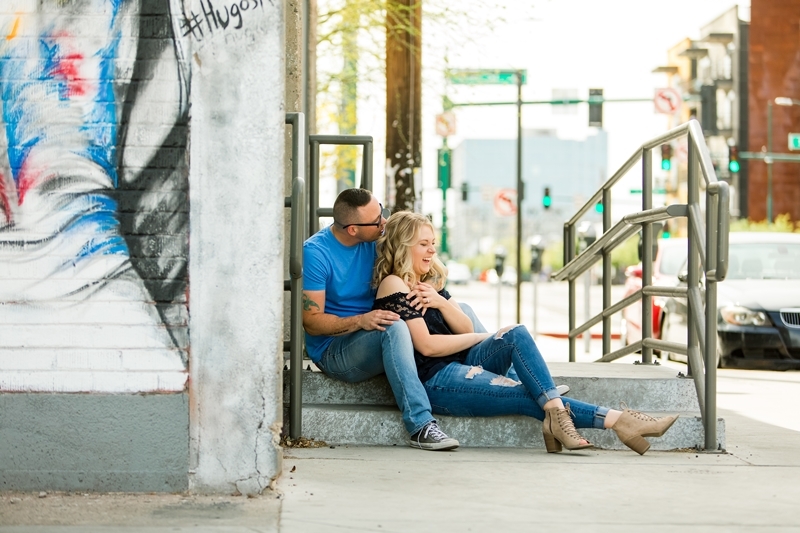 We started off in Downtown Phoenix and explored some alleys and different buildings over there. 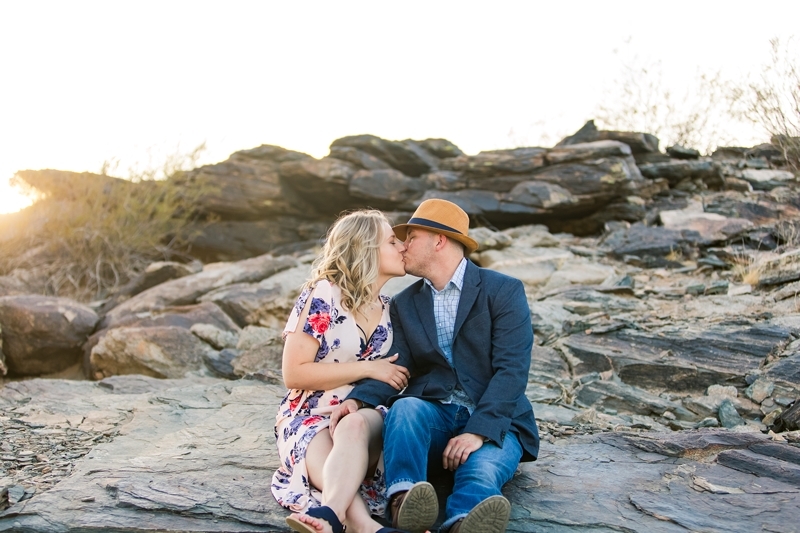 Then the couple changed into baseball clothes and we went to a park in Phoenix. 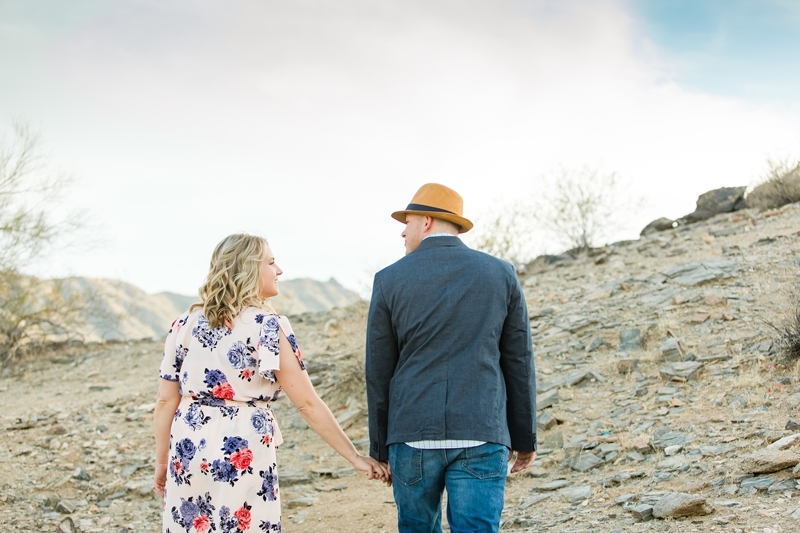 We were melting after that so we stopped for a cold drink at Circle K. We cooled off while we drove to their final location at the base of a mountain. 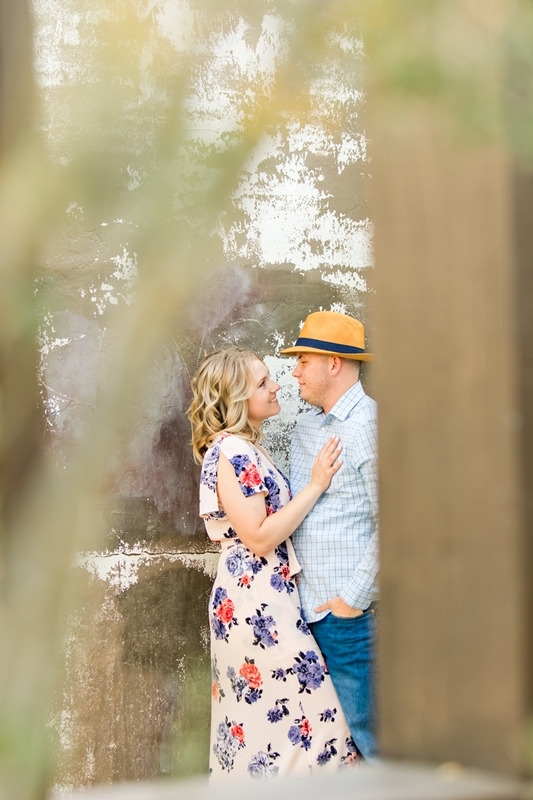 After 3 hours with this couple, we were all feeling very comfortable together and I think it really shows in the pictures we got at the end of their session. 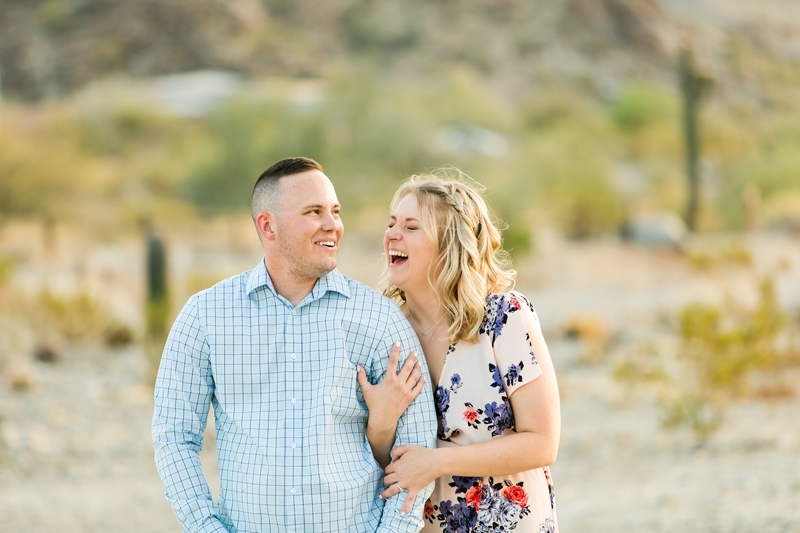 These two love to laugh and have fun together. 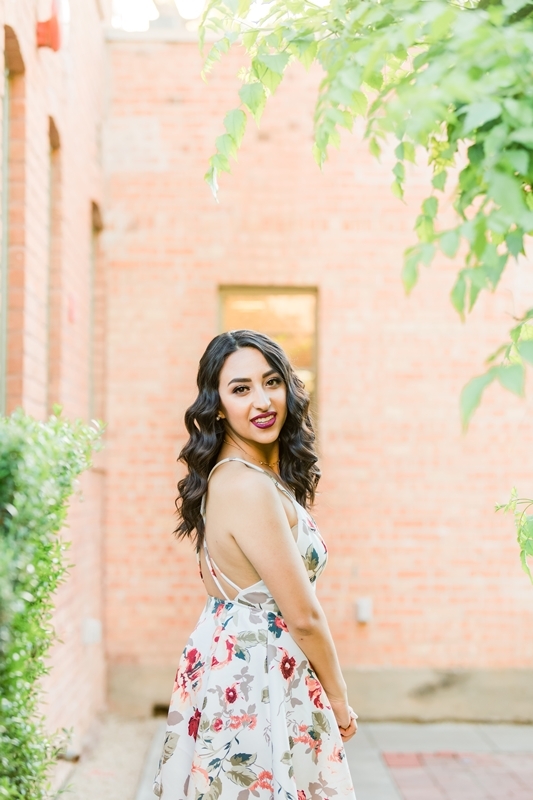 It was so much fun to explore the city and it gave the pictures so much variety with the outfit and location changes. 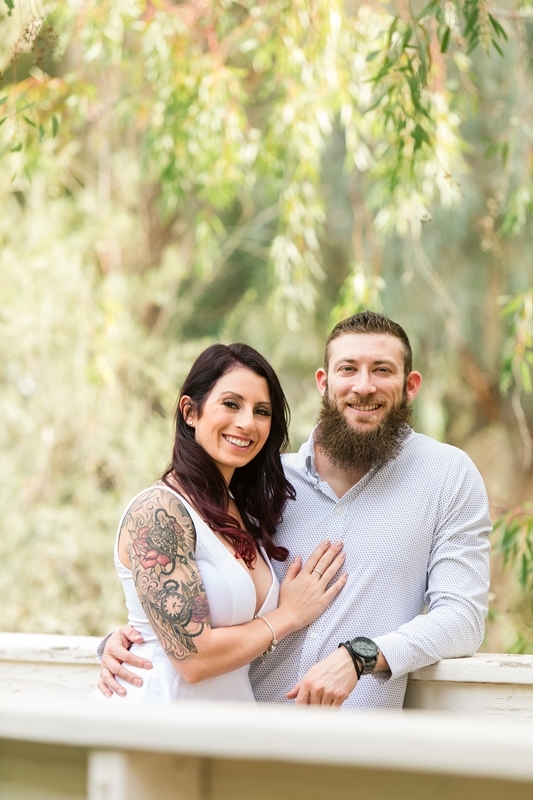 Jordan and Hailey are huge baseball fans. 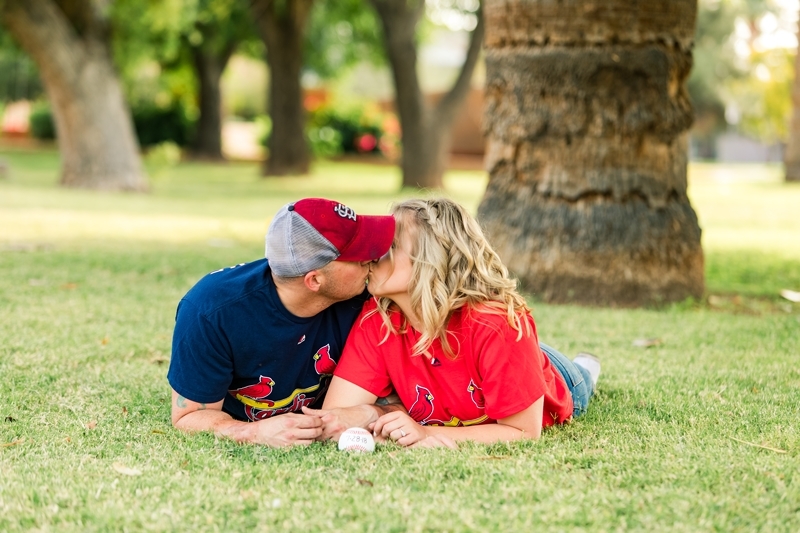 St. Louis Cardinals are their team. 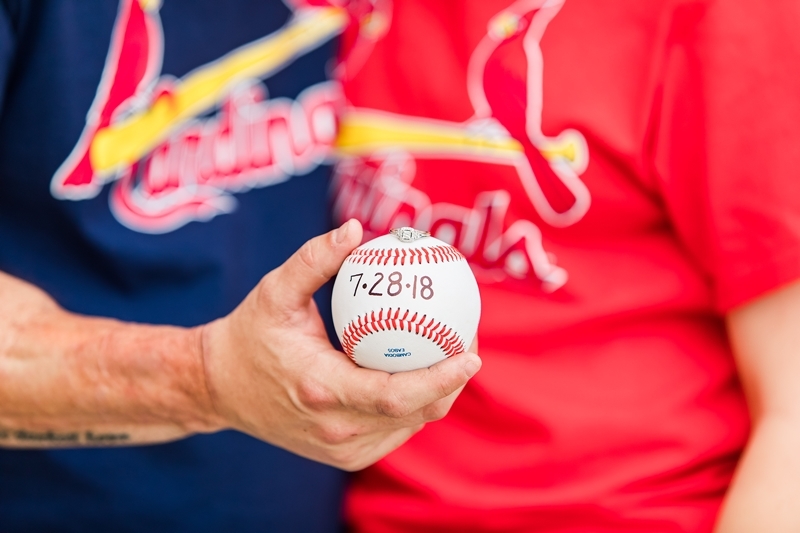 In fact, their wedding reception is at a Cubs vs. Cardinals game! 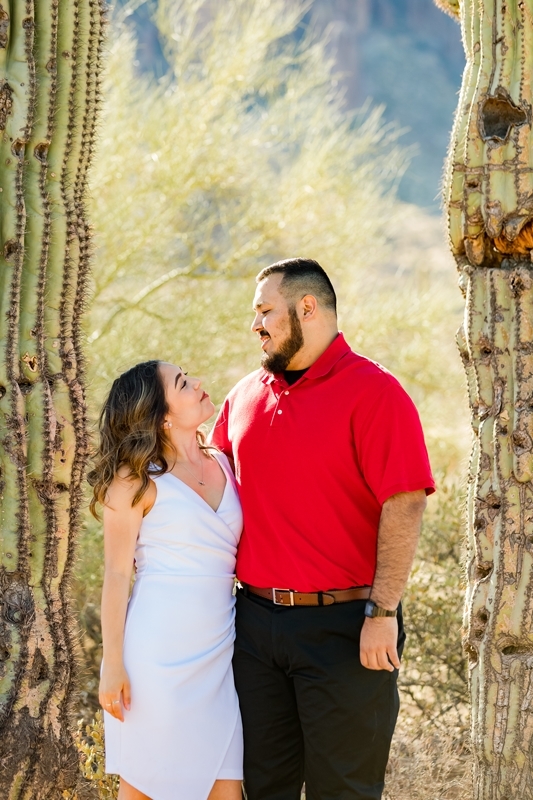 I loved finding a red bridge to match the cardinal red in Hailey’s shirt and the red flowers on a tree. 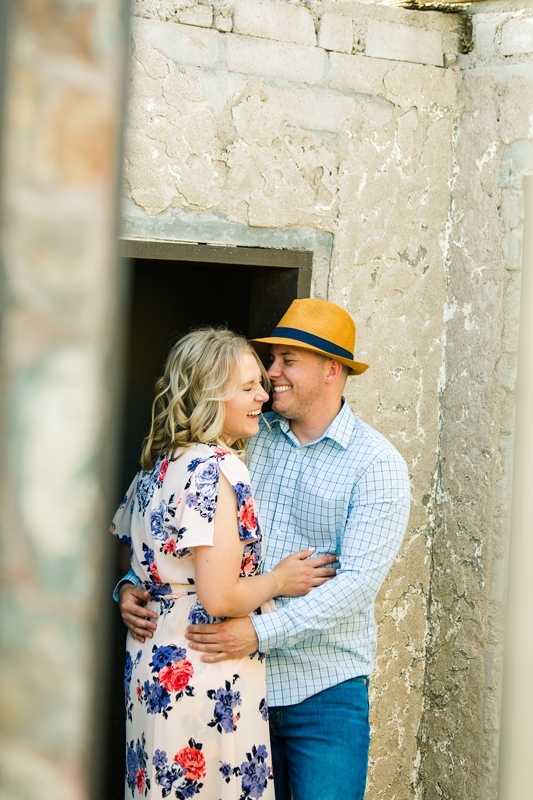 Jordan’s hat was so neat! 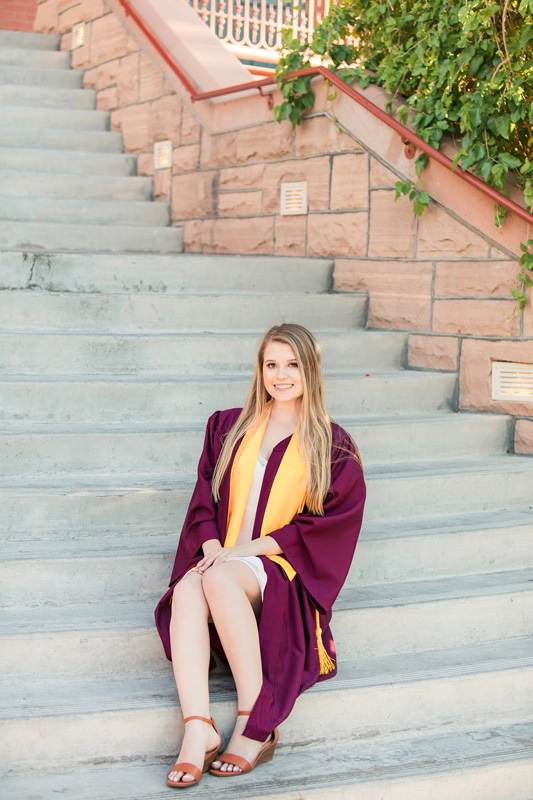 Hailey’s dress matched perfectly with Jordan’s coat. 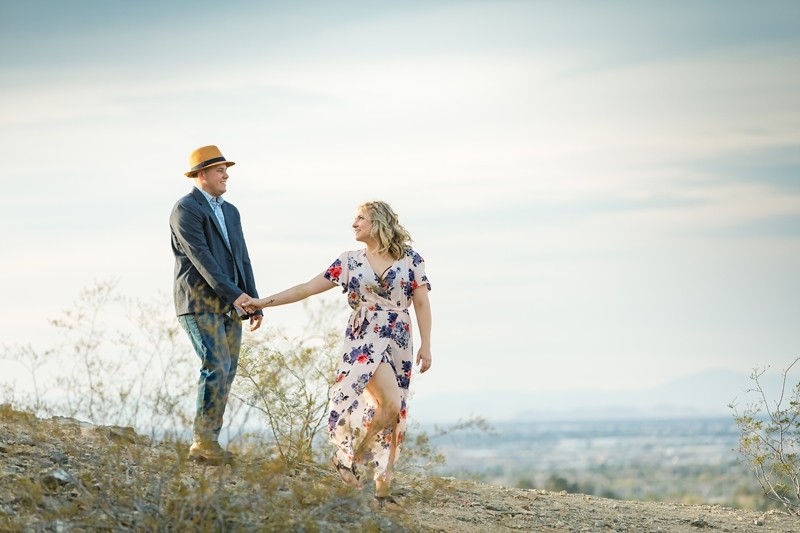 I love these pictures on top of the hill overlooking Phoenix. 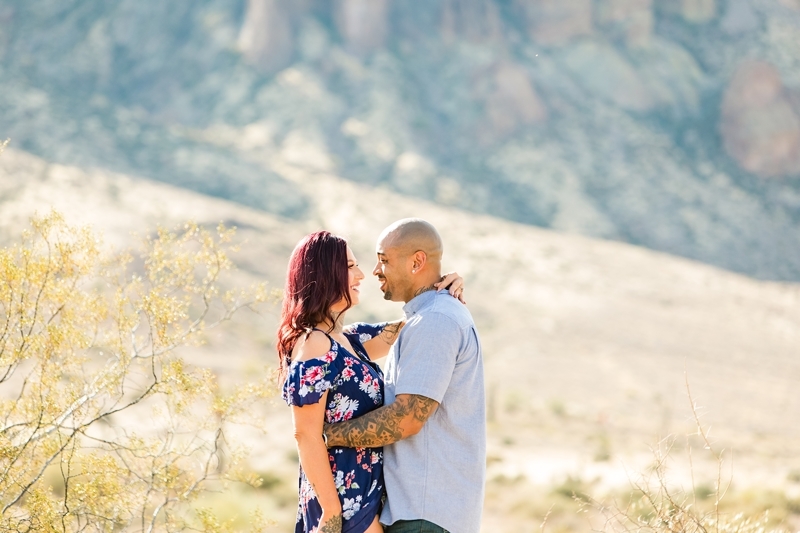 They were having so much fun together at this point and they were so relaxed and natural. 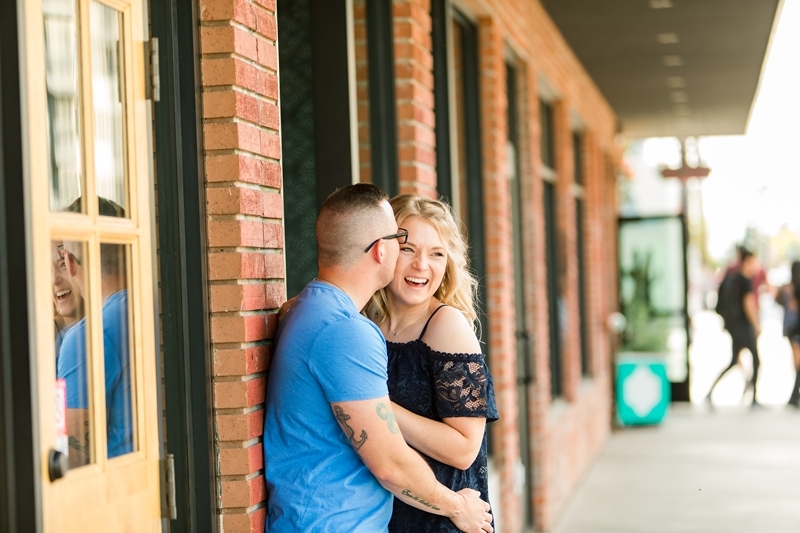 I always strive to make engagement sessions fun for the couple. 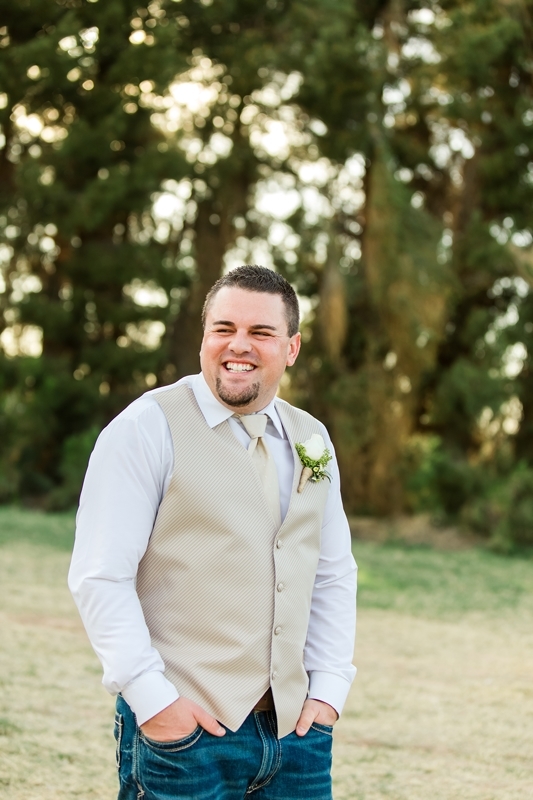 I know that a lot of guys don’t love having their picture taken so I make sure it’s a fun experience for them. 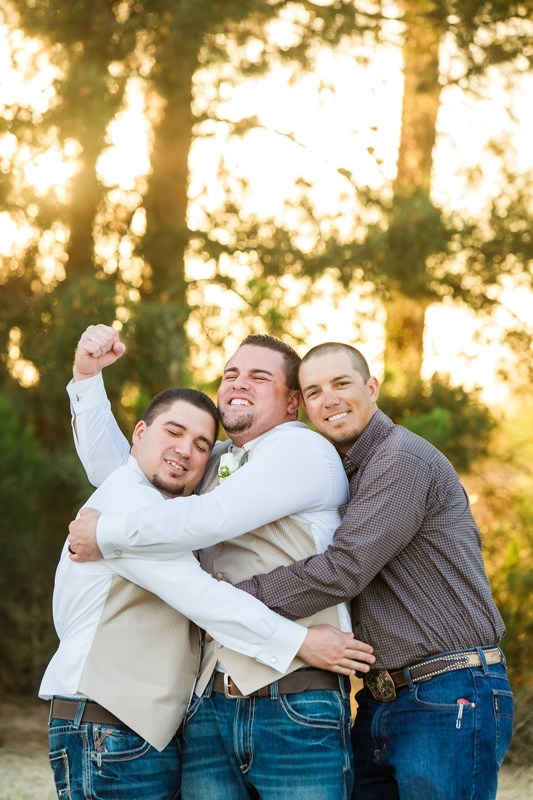 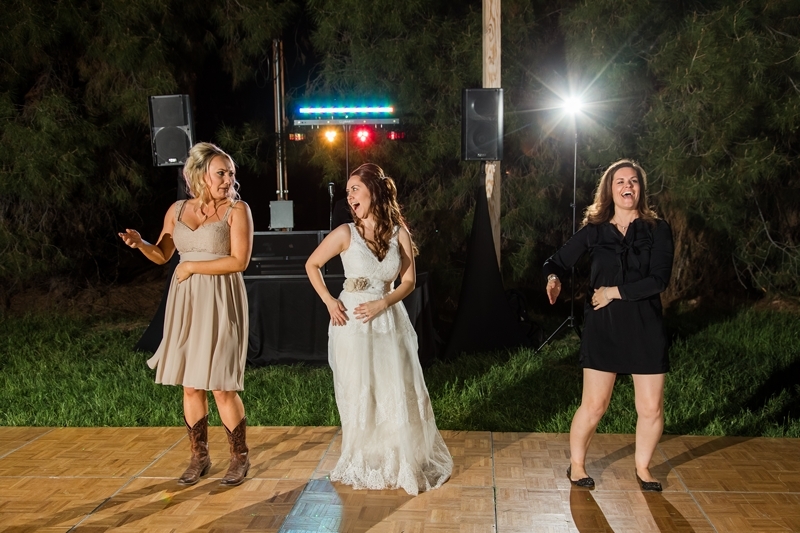 Then at the wedding, they know exactly what to expect with me. 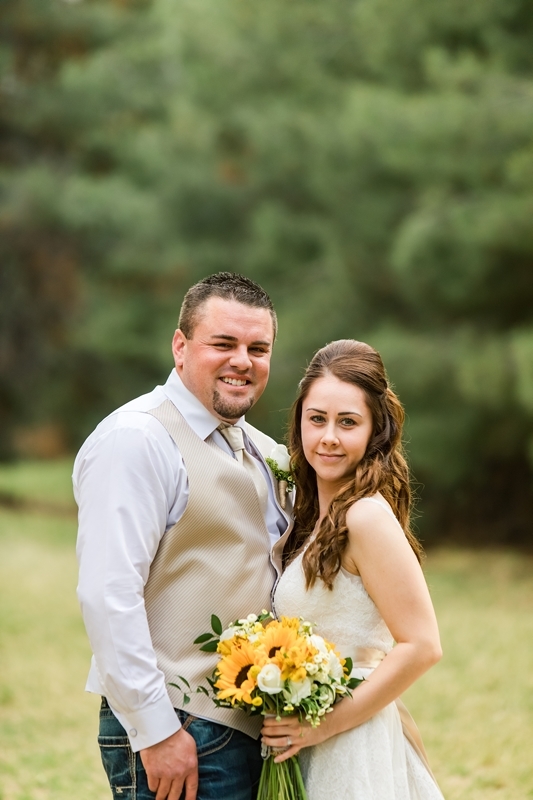 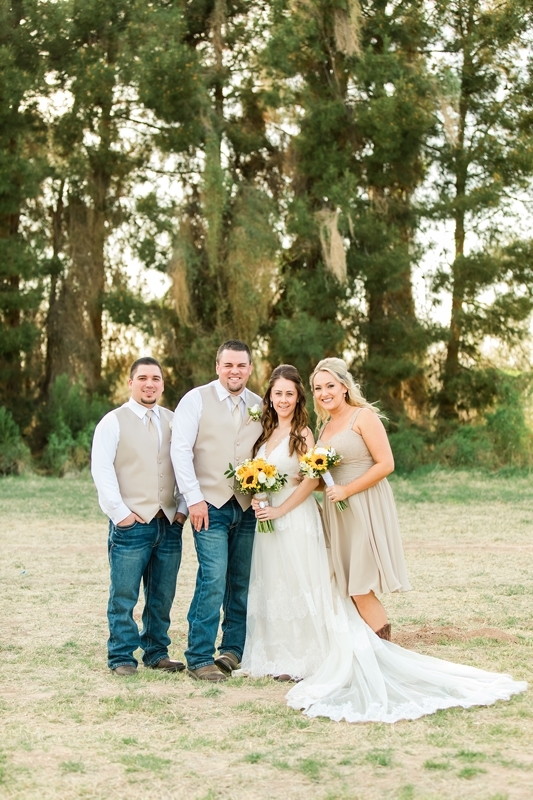 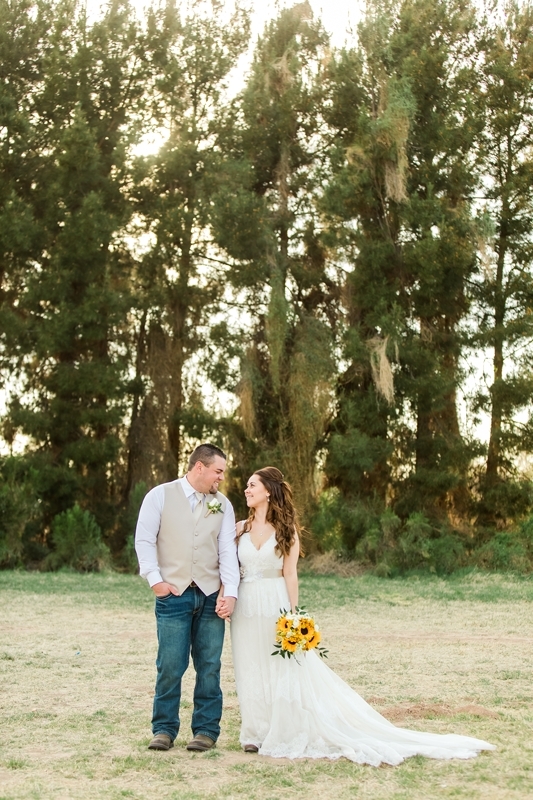 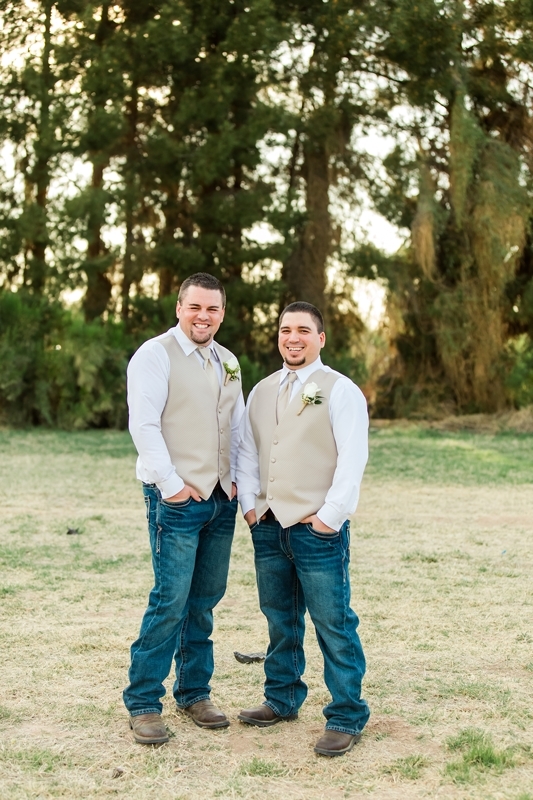 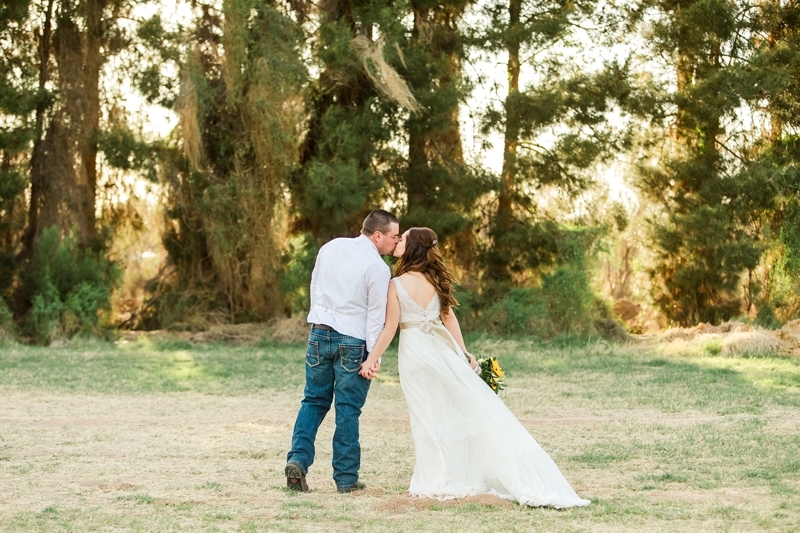 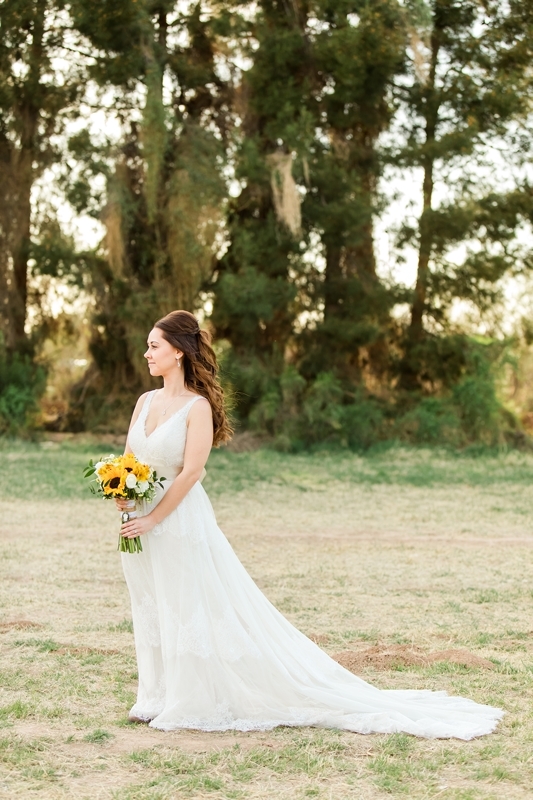 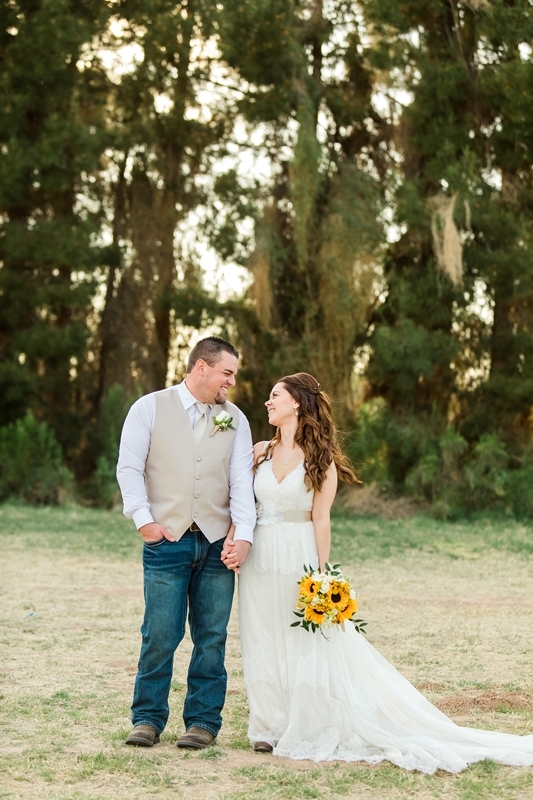 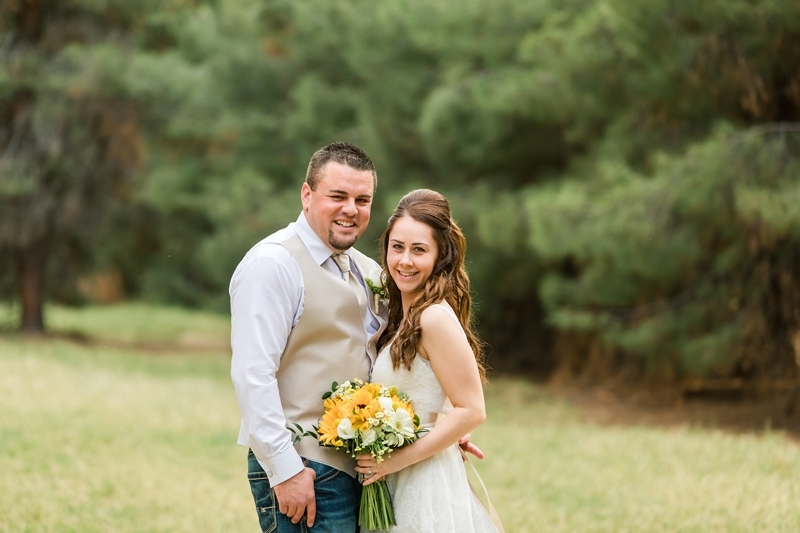 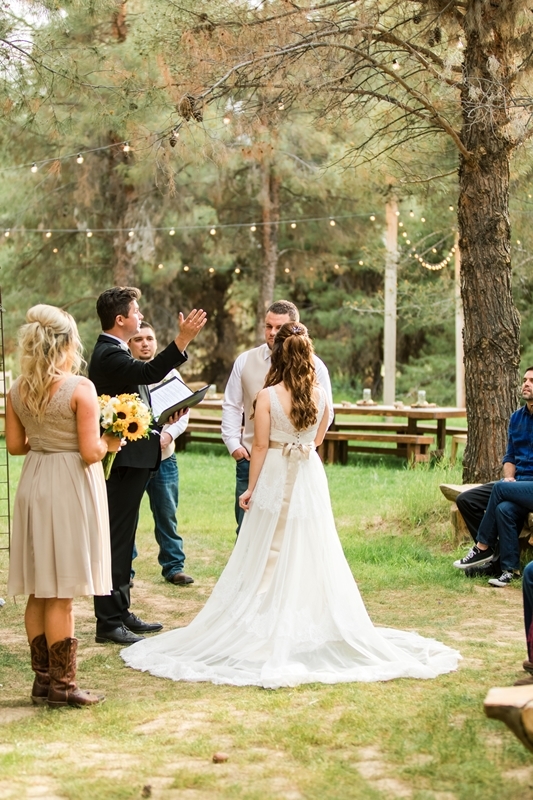 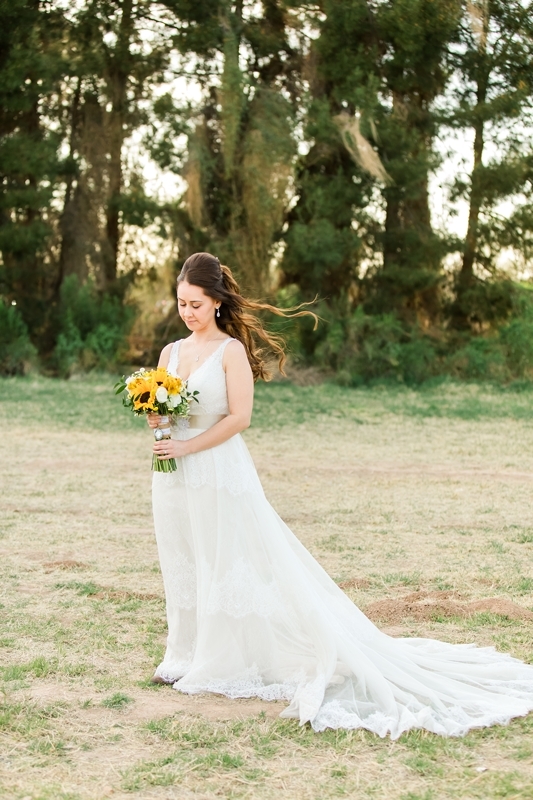 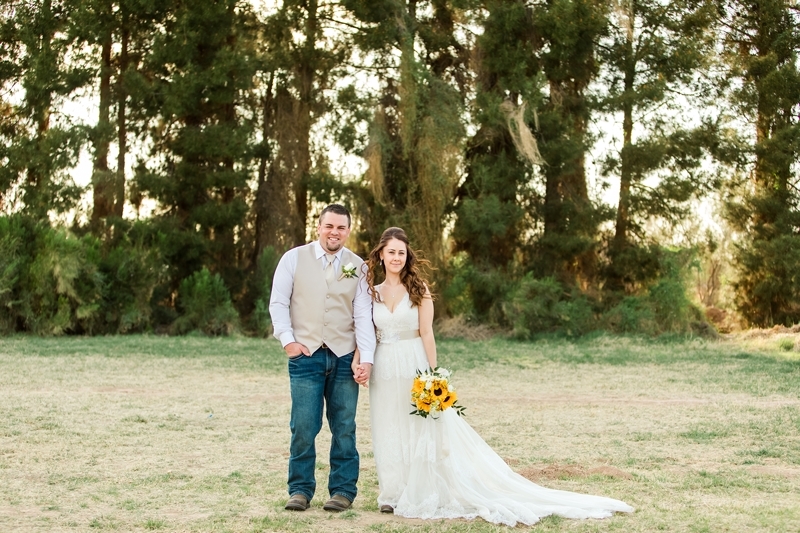 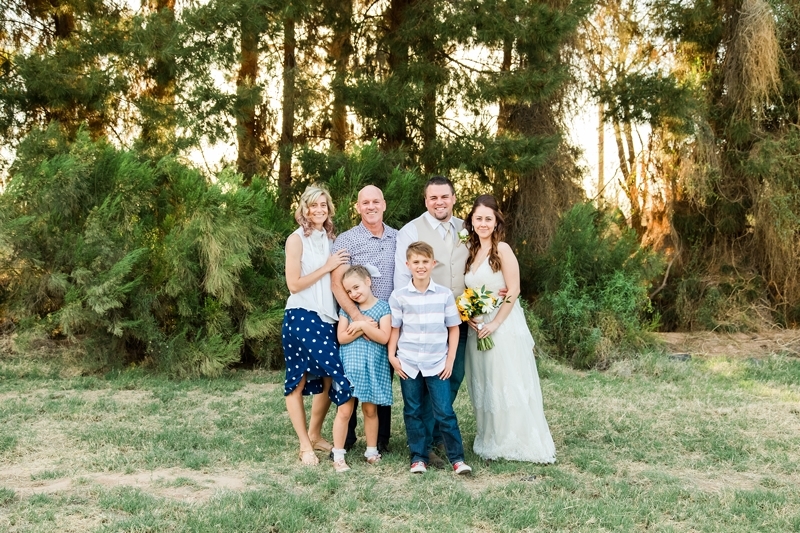 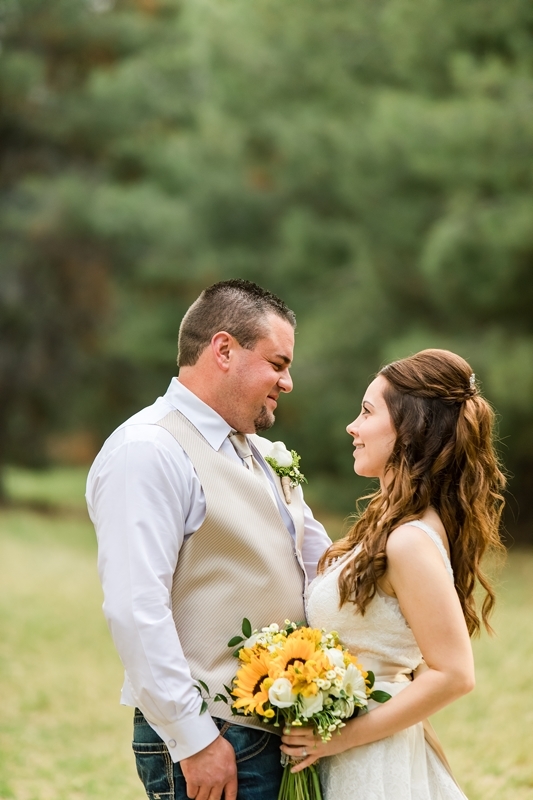 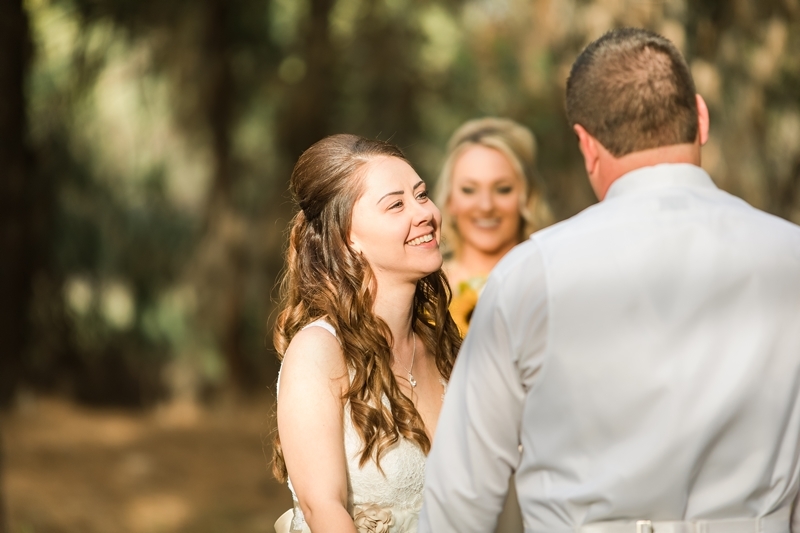 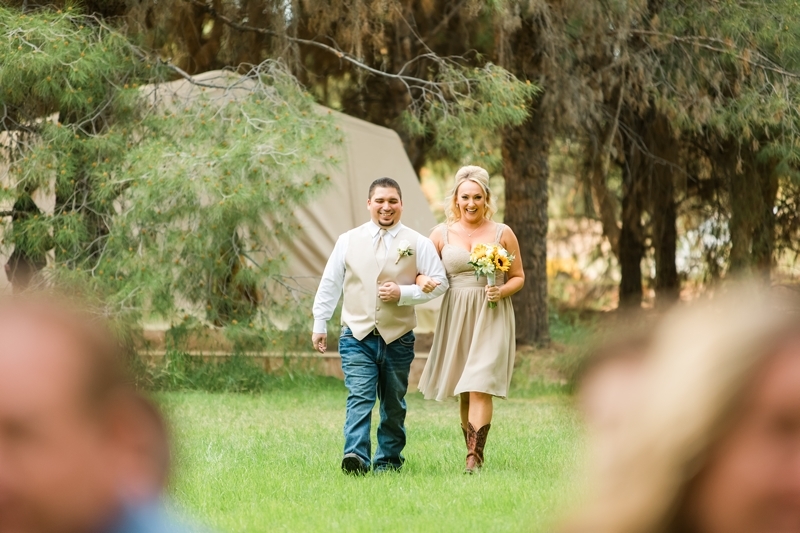 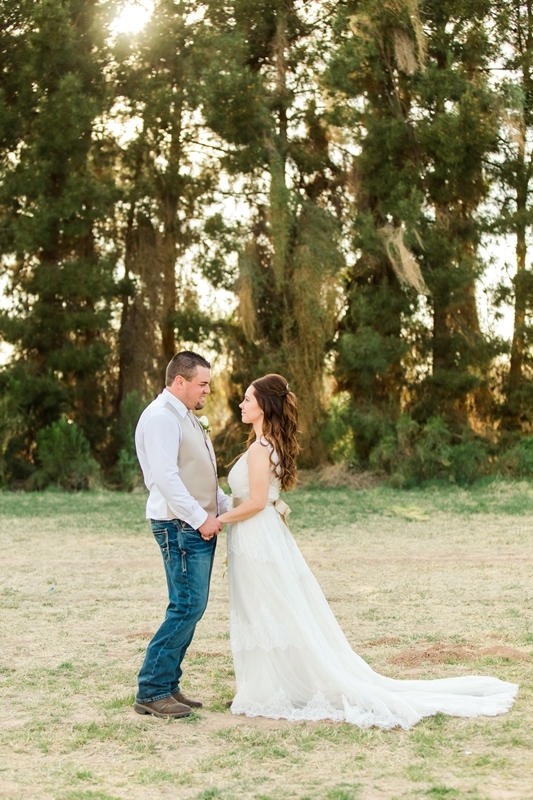 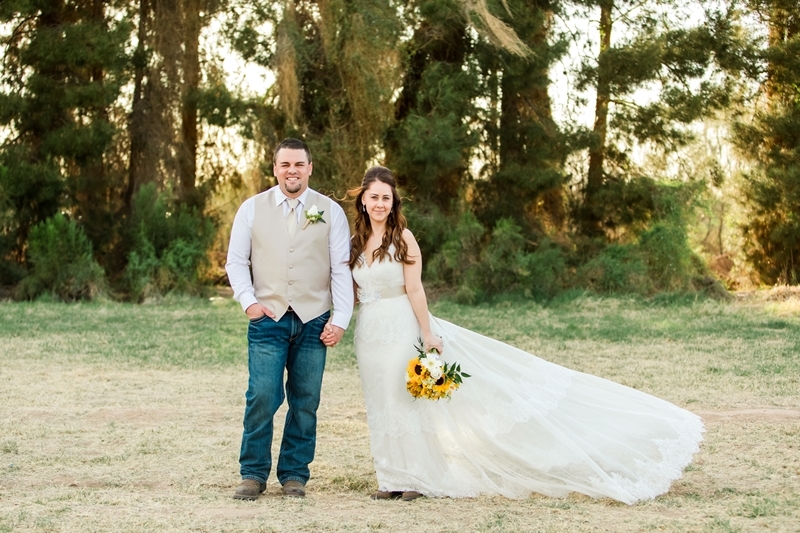 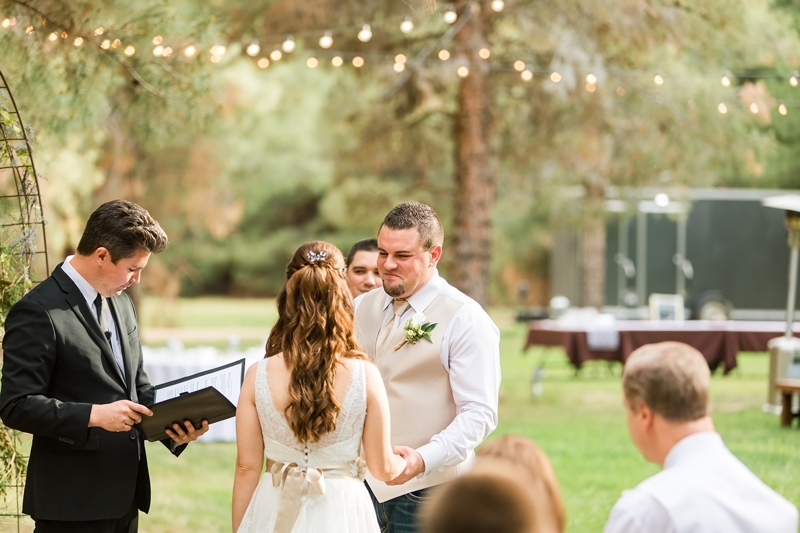 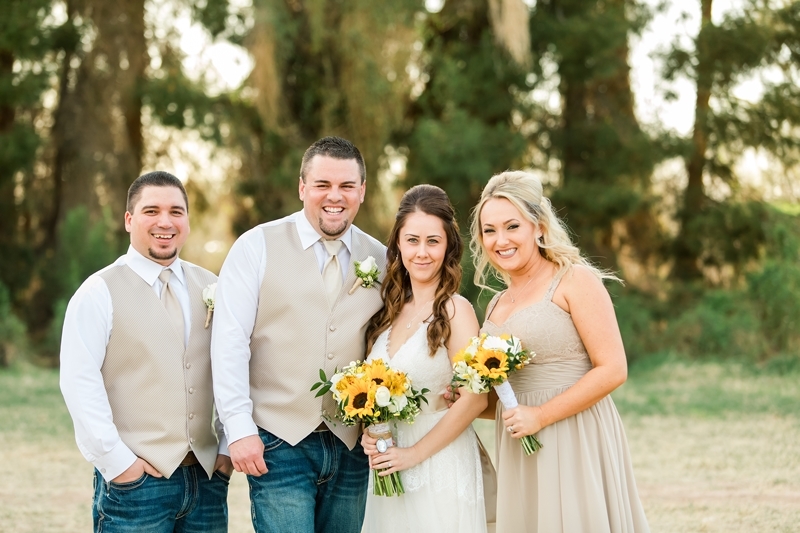 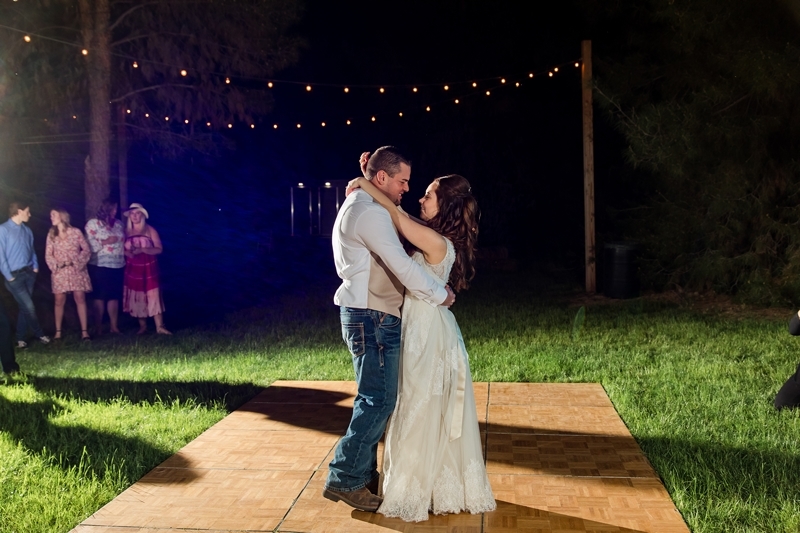 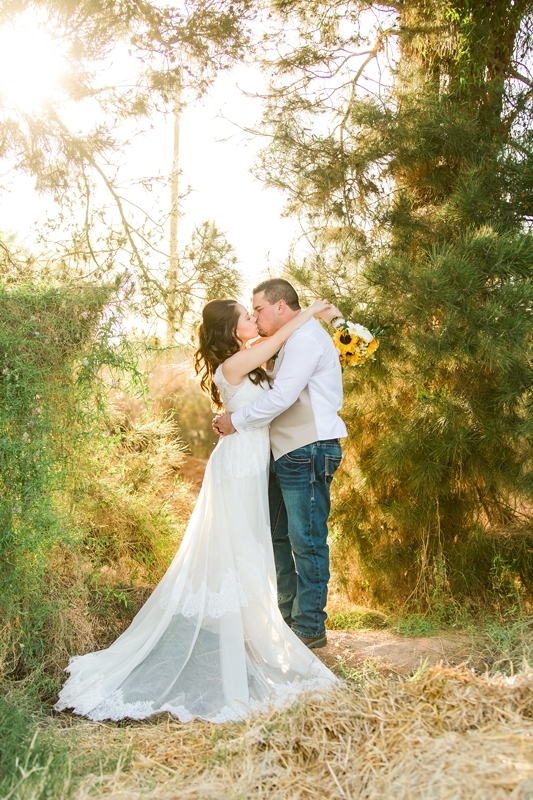 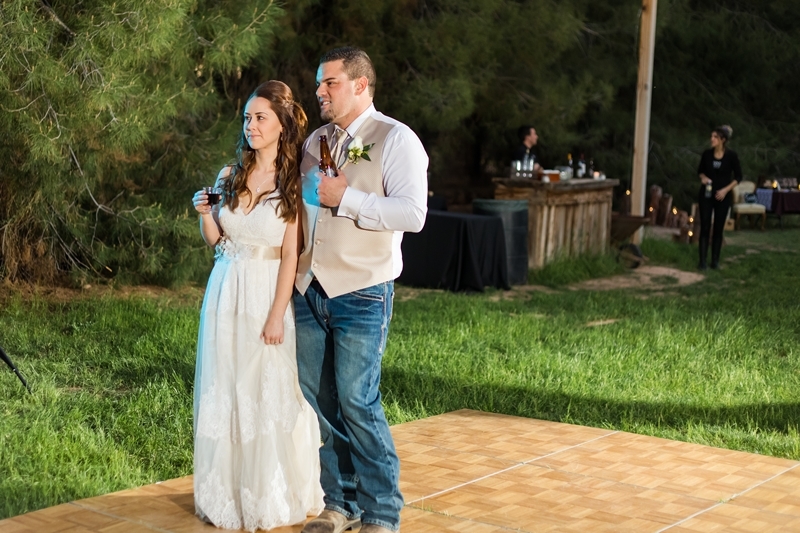 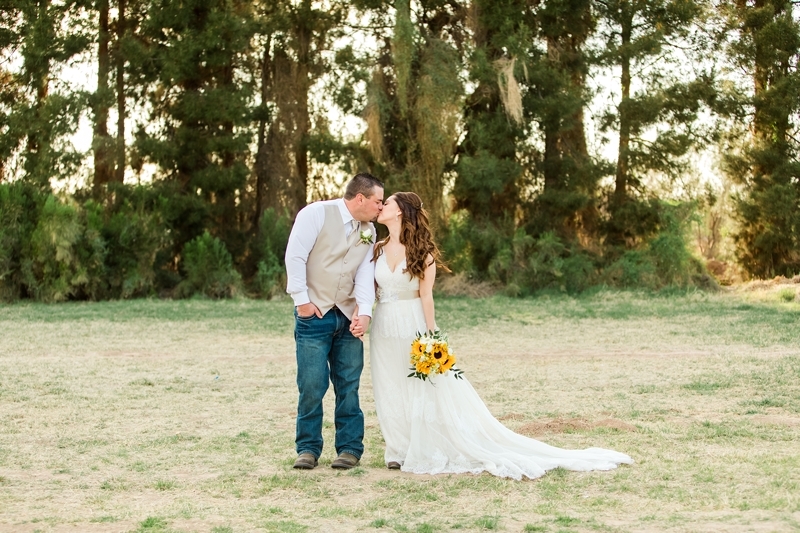 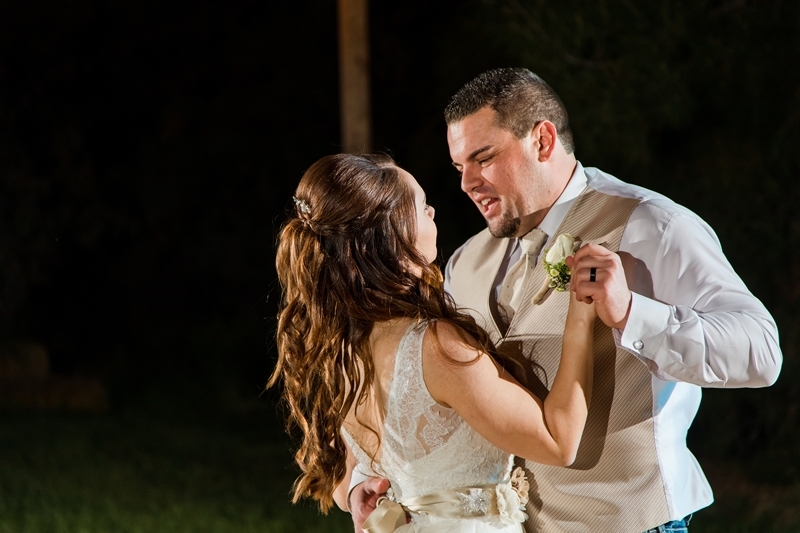 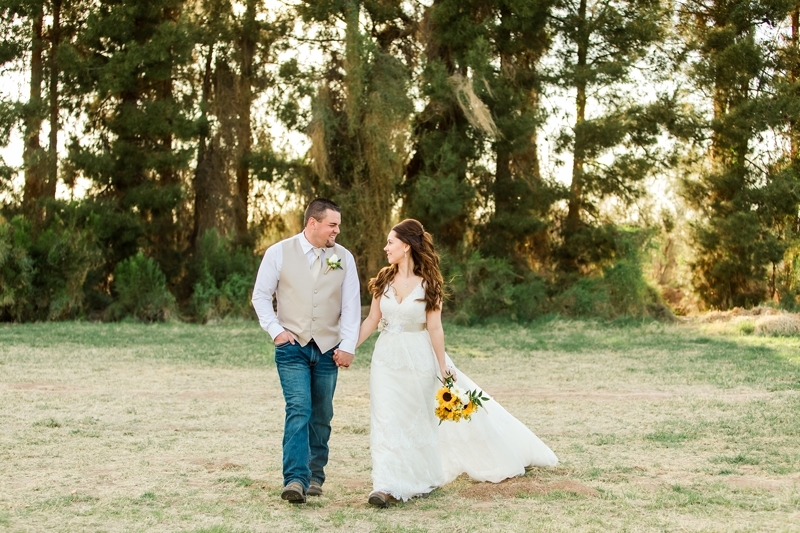 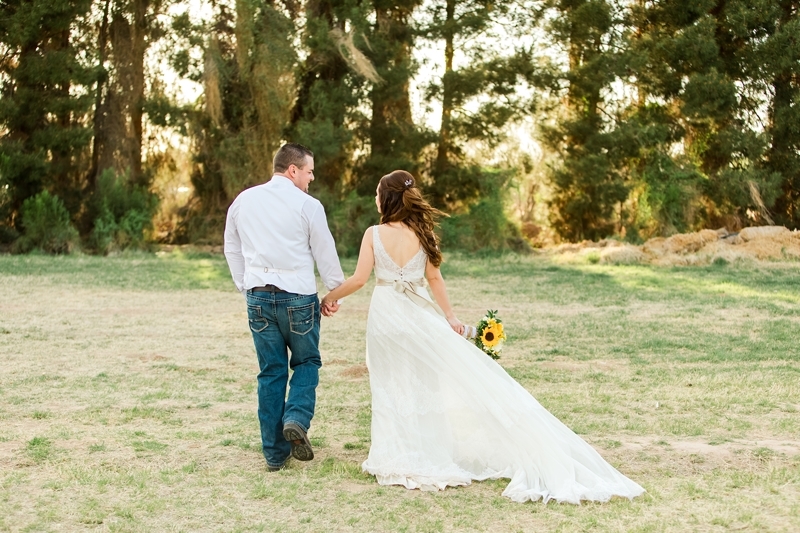 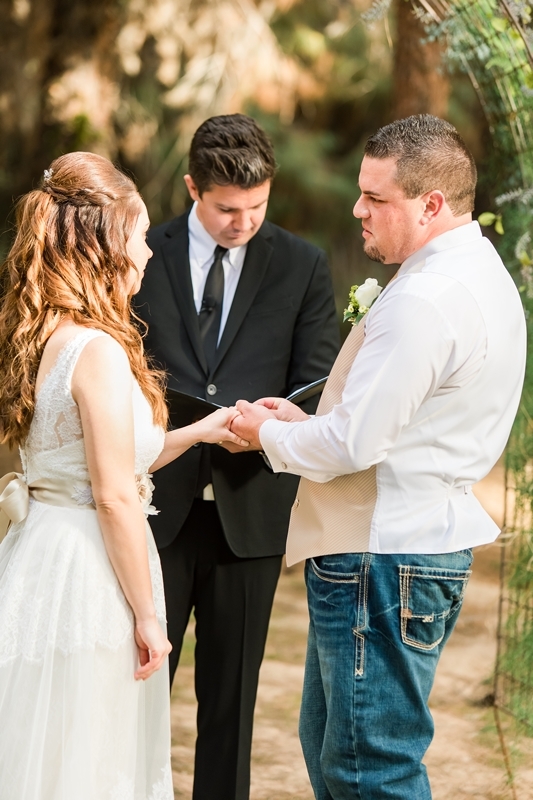 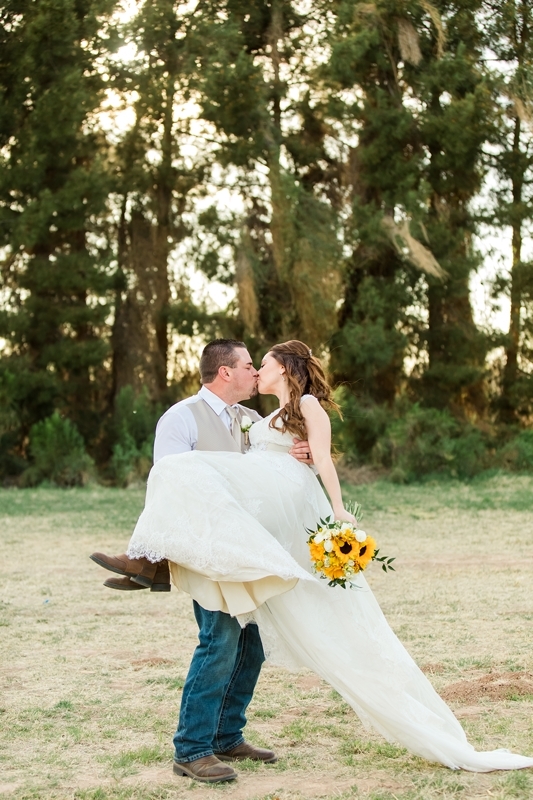 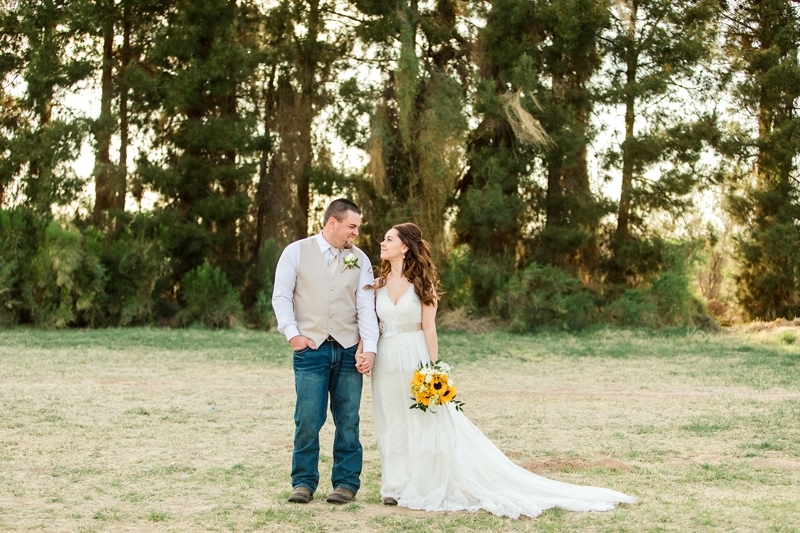 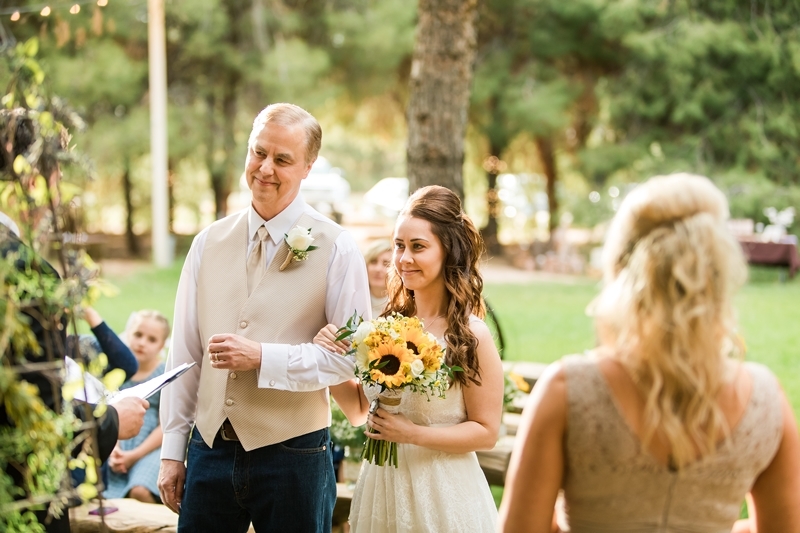 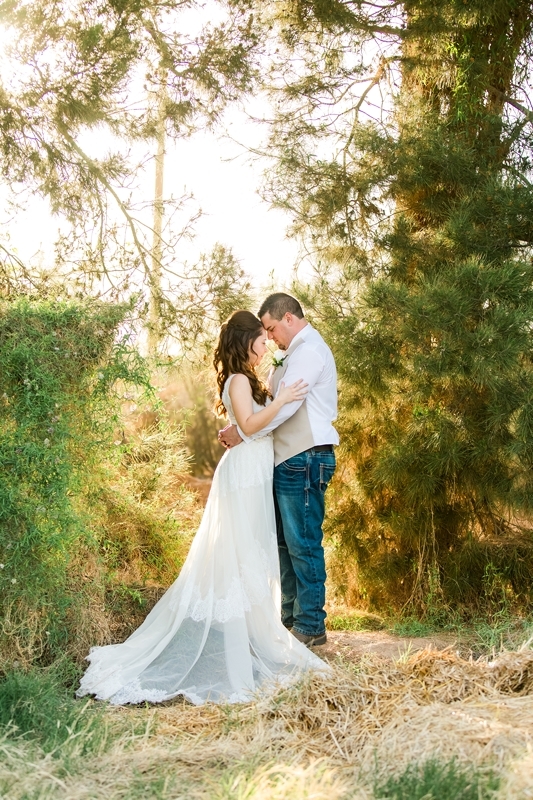 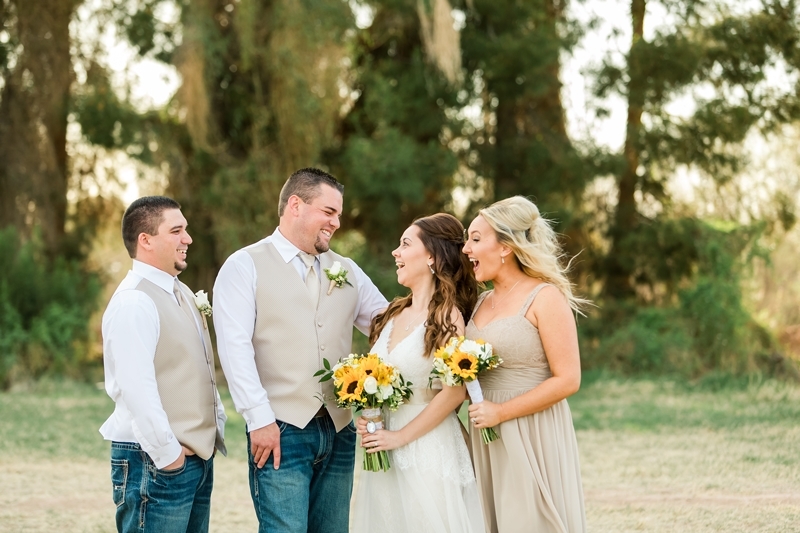 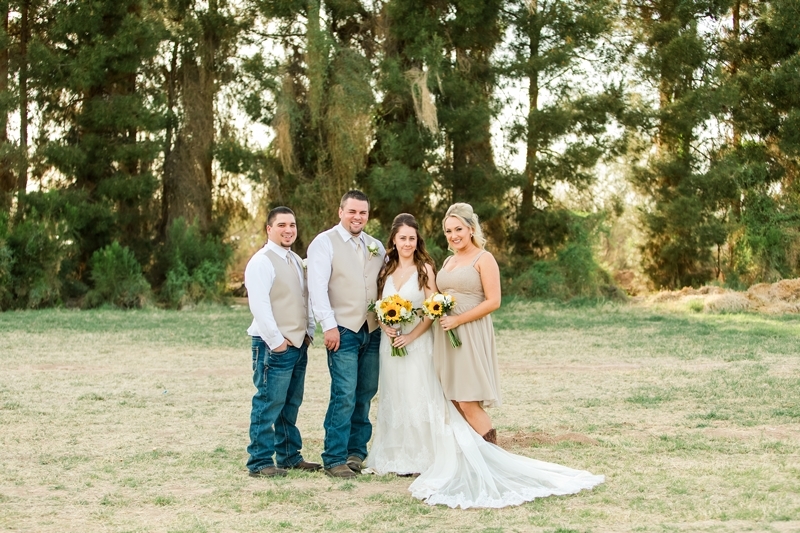 I had never met Alex and Christine before their Queen Creek Wedding. 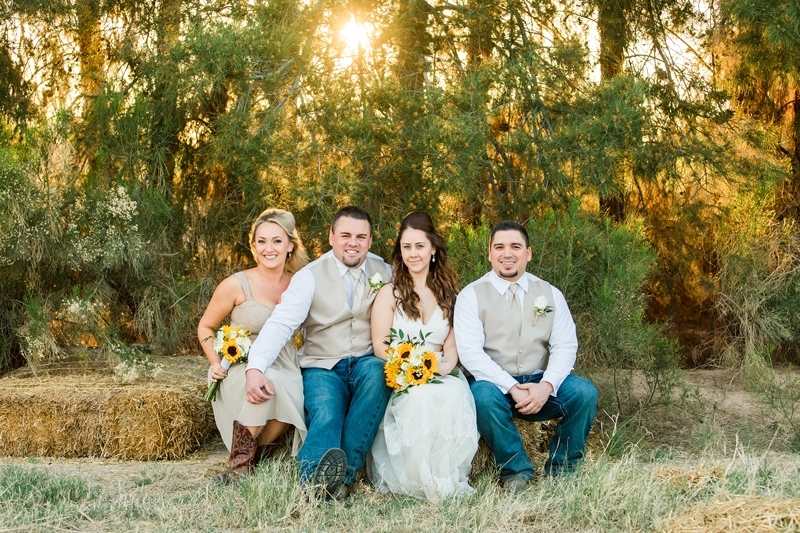 When I met these wonderful people, I was immediately at ease. 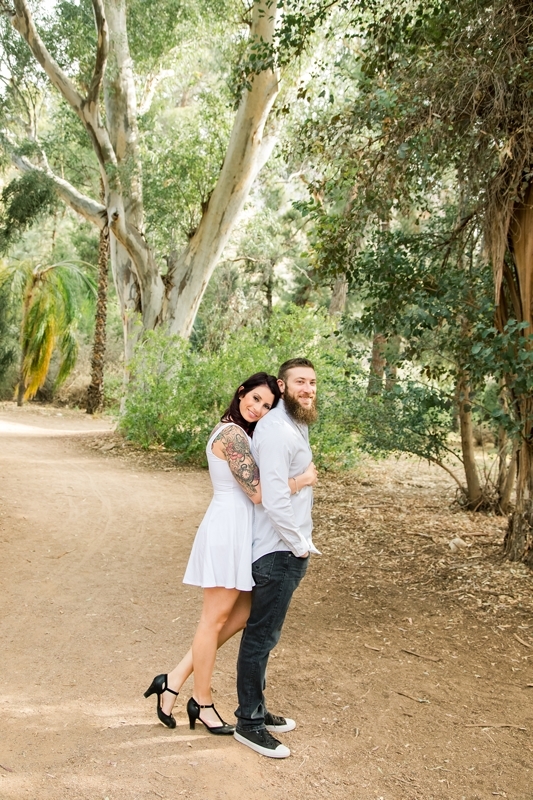 They are the nicest and sweetest couple ever. 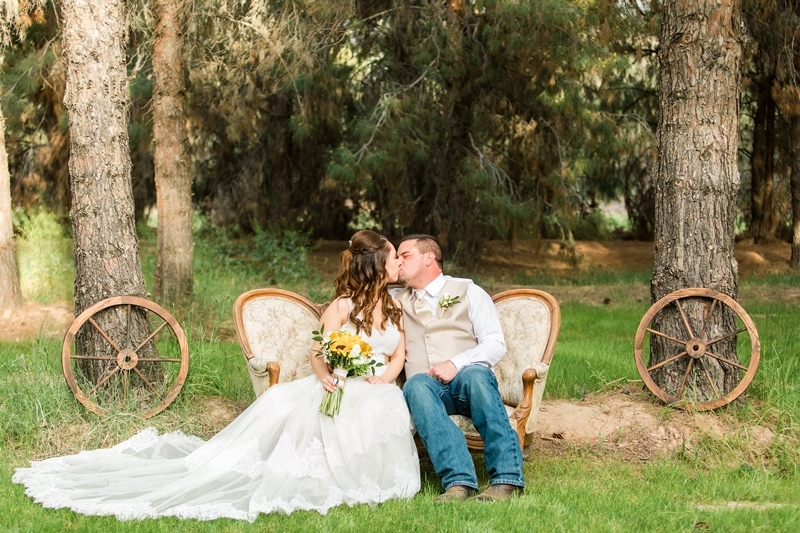 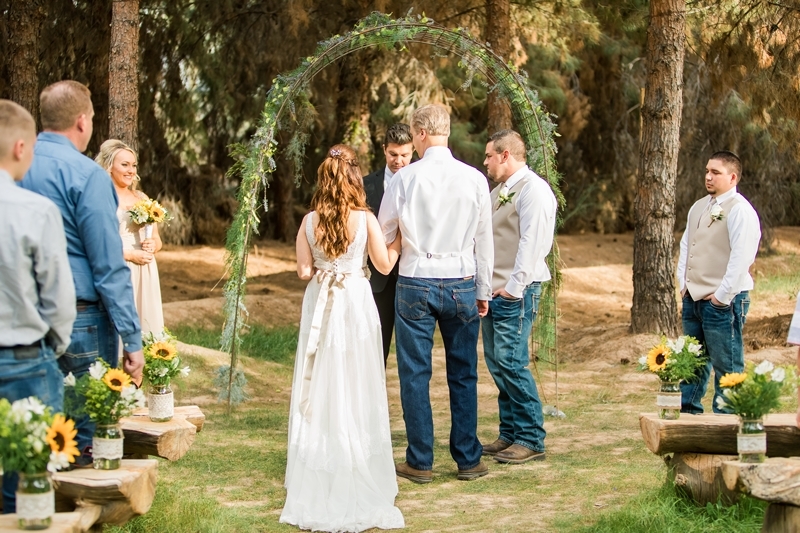 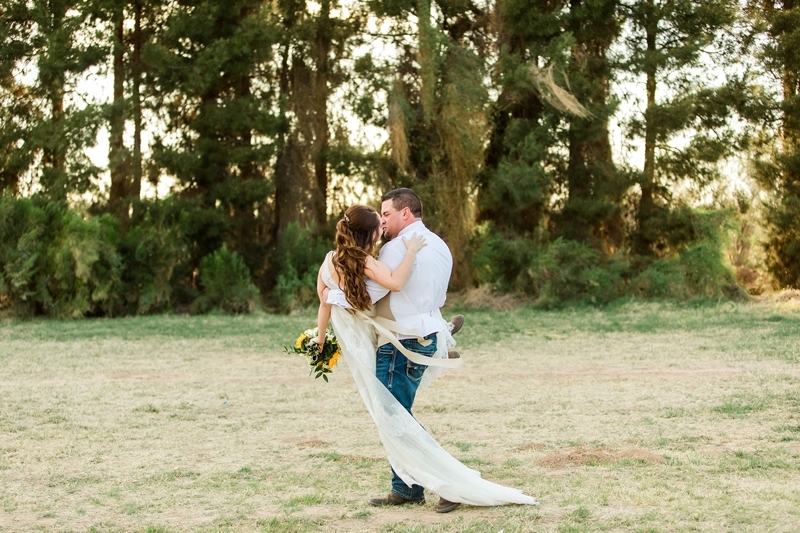 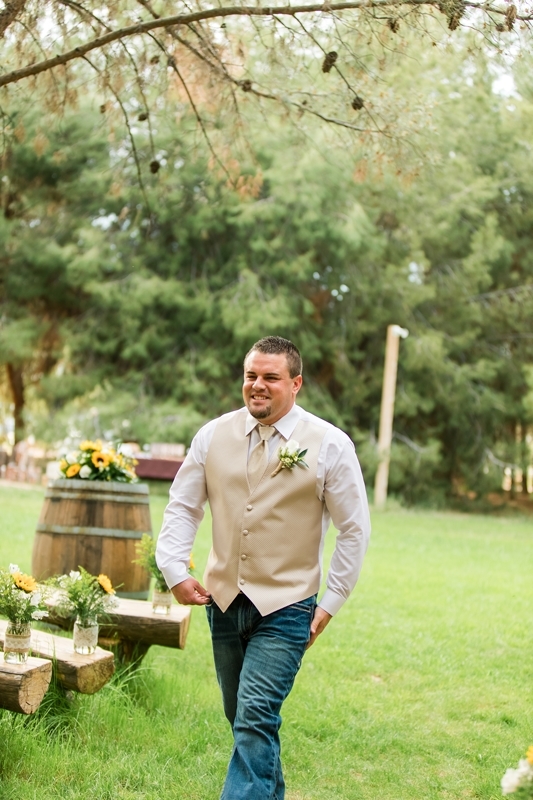 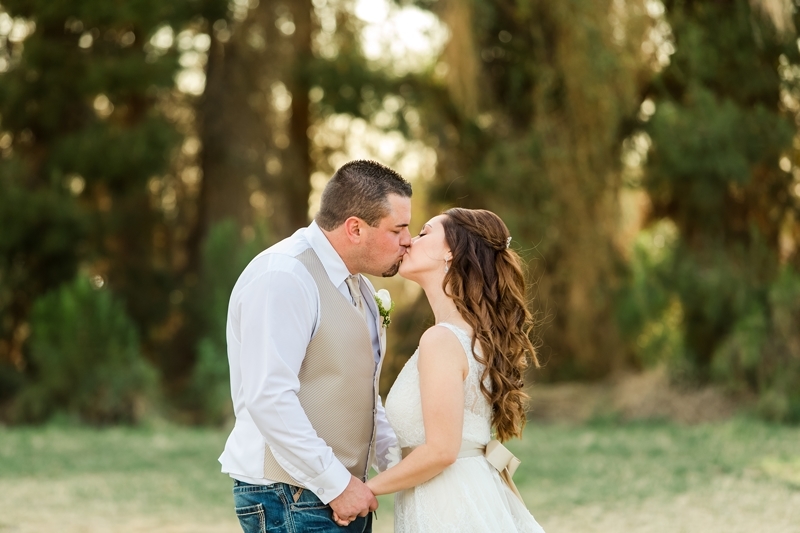 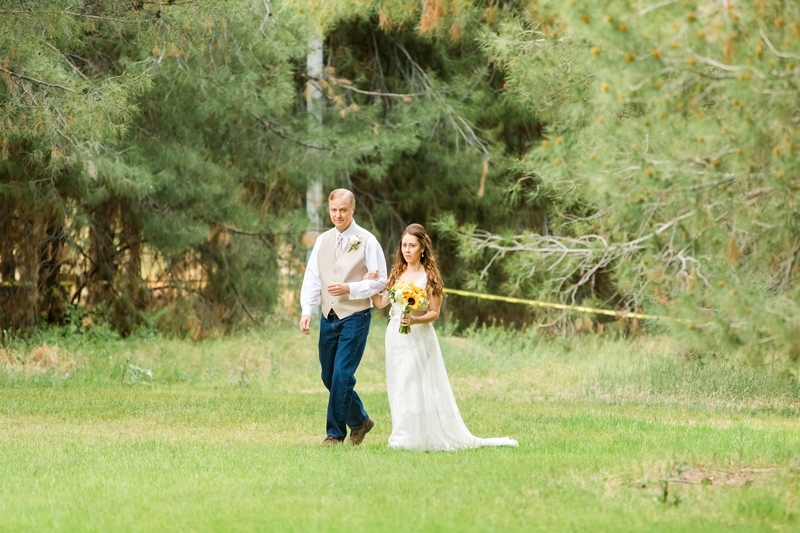 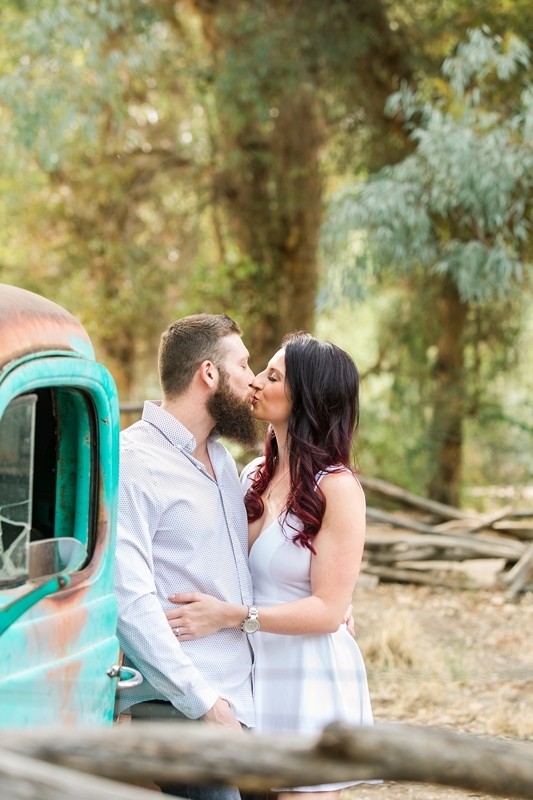 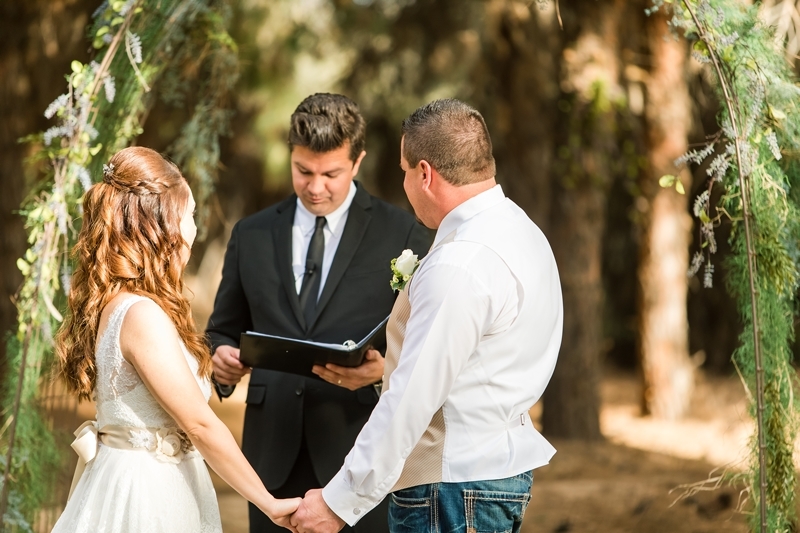 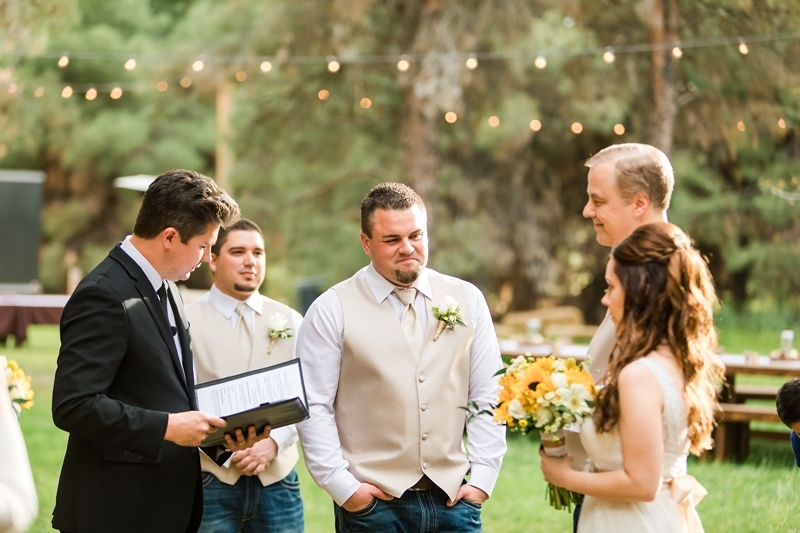 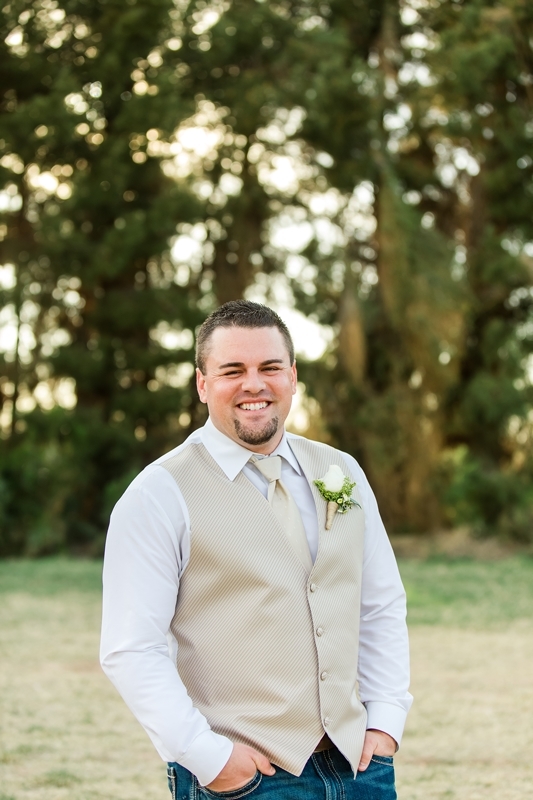 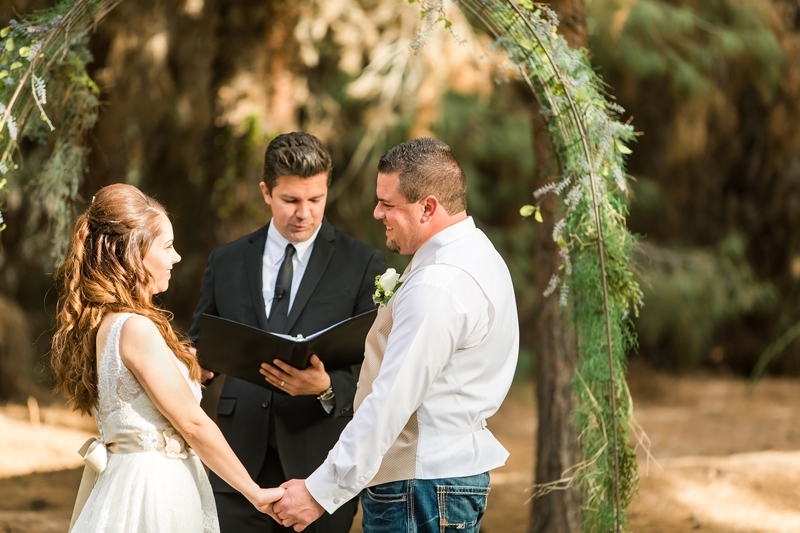 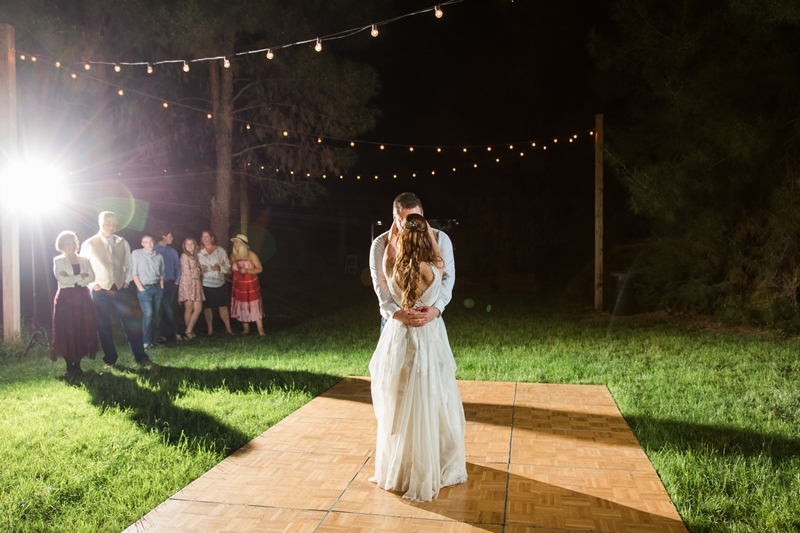 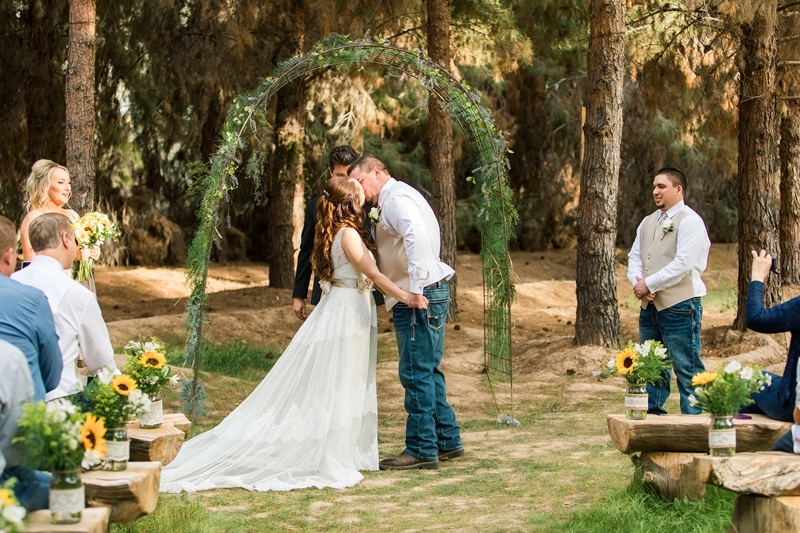 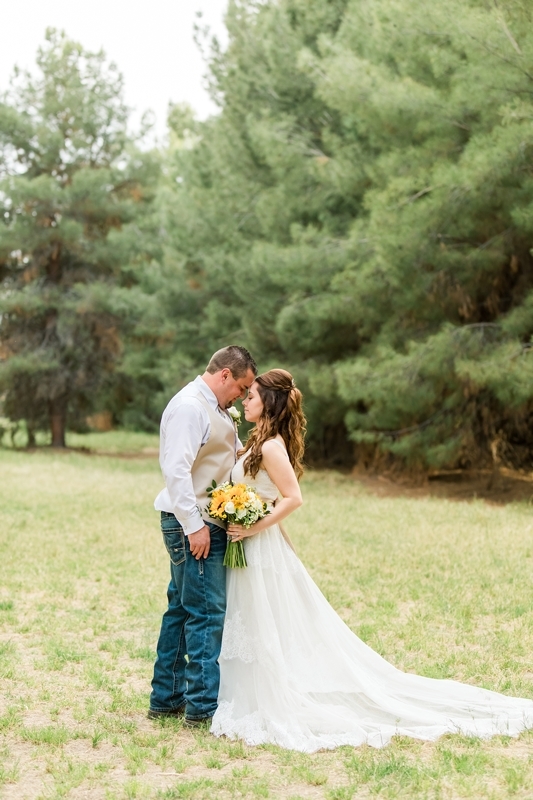 Their wedding was nestled in a grove of trees unlike anything in the area. 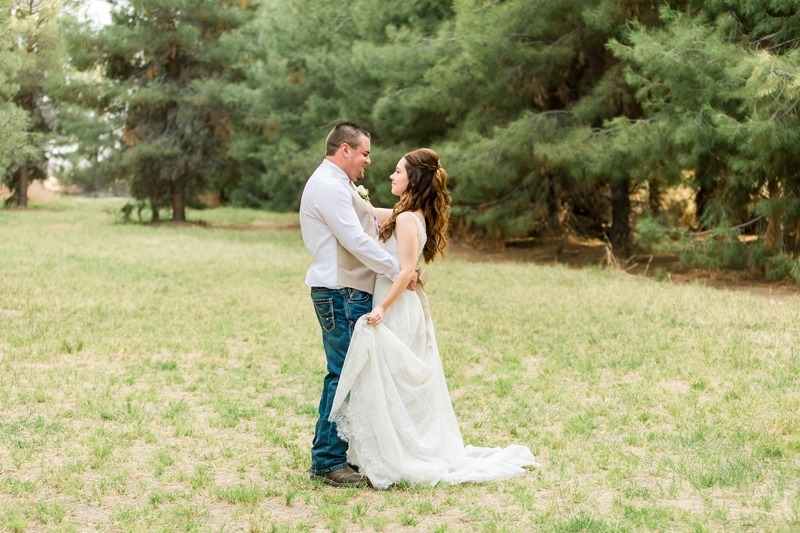 It felt like we were in a forest even though I was 5 minutes away from home. 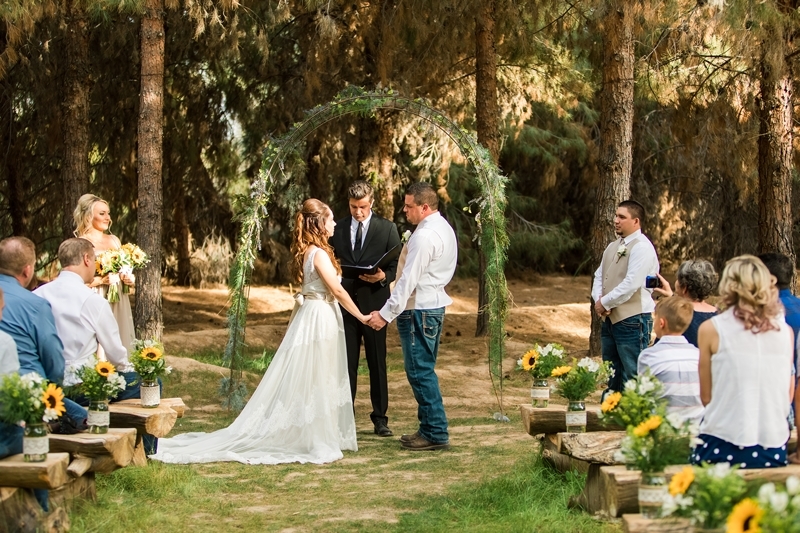 I had never been to a wedding at this venue and I absolutely fell in love with its charm. 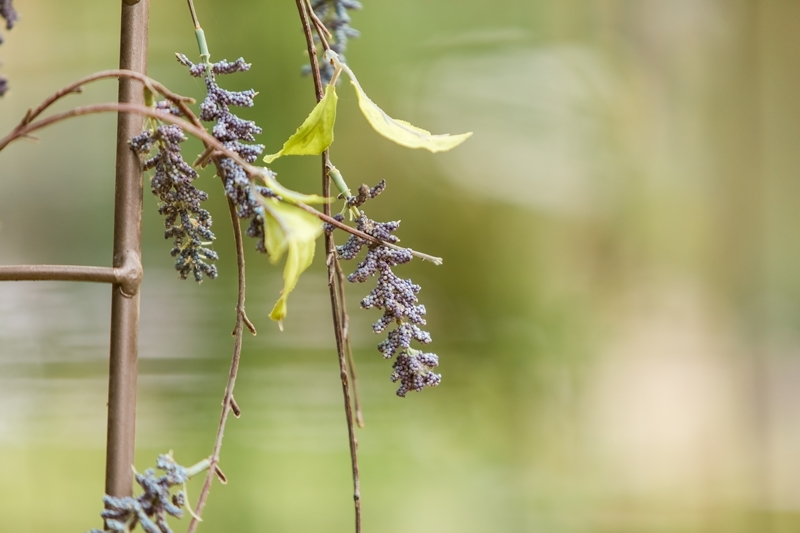 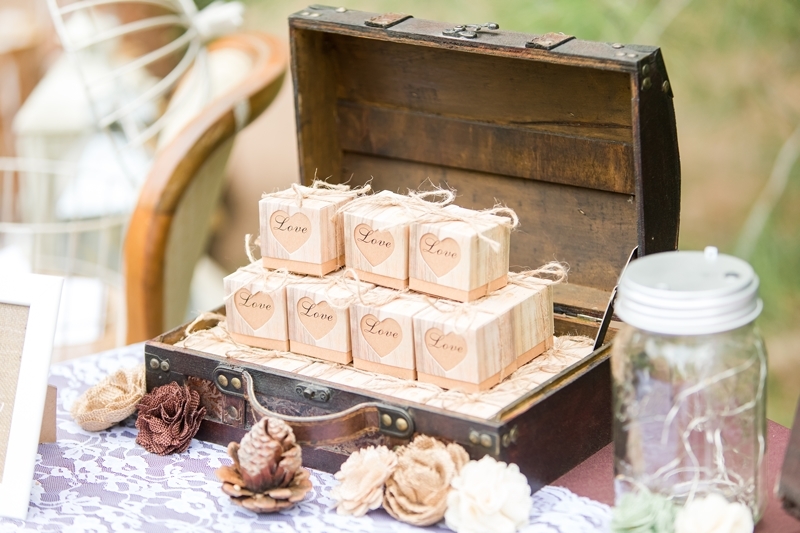 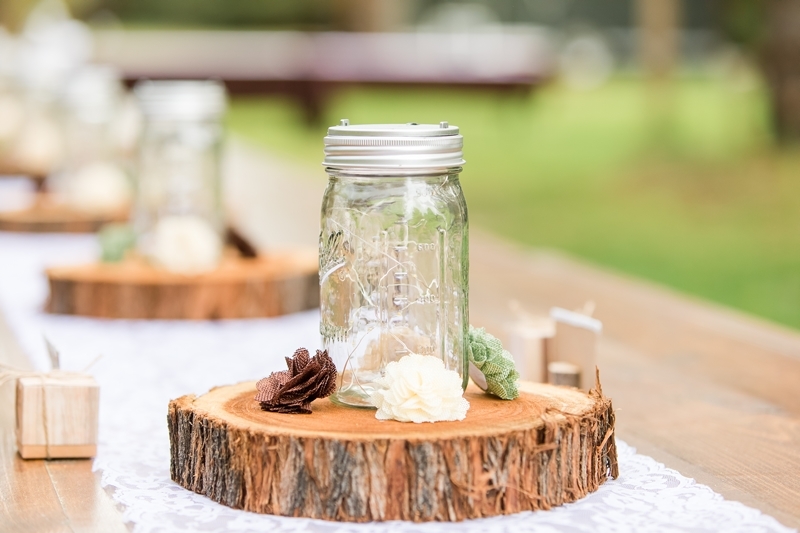 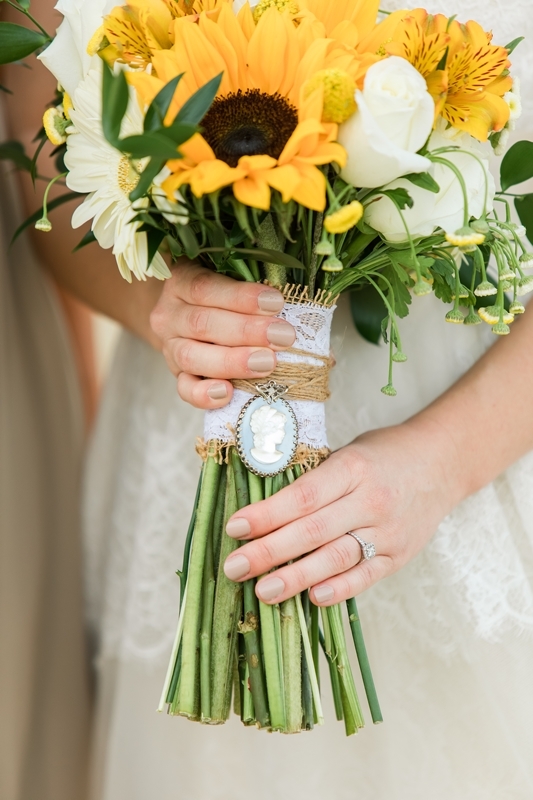 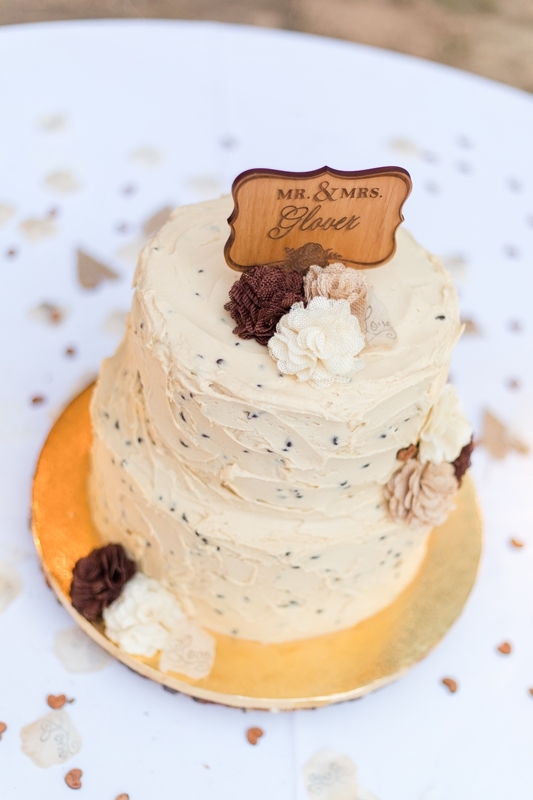 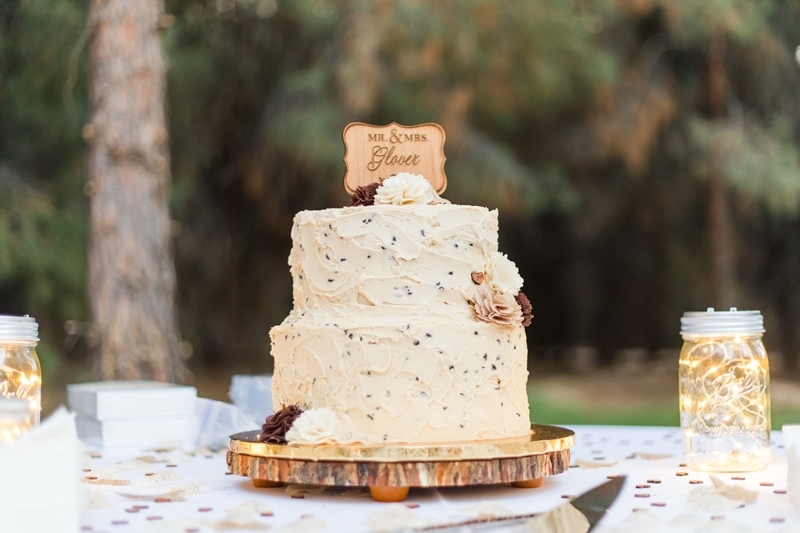 The little details at this wedding were beautifully planned and thought out. 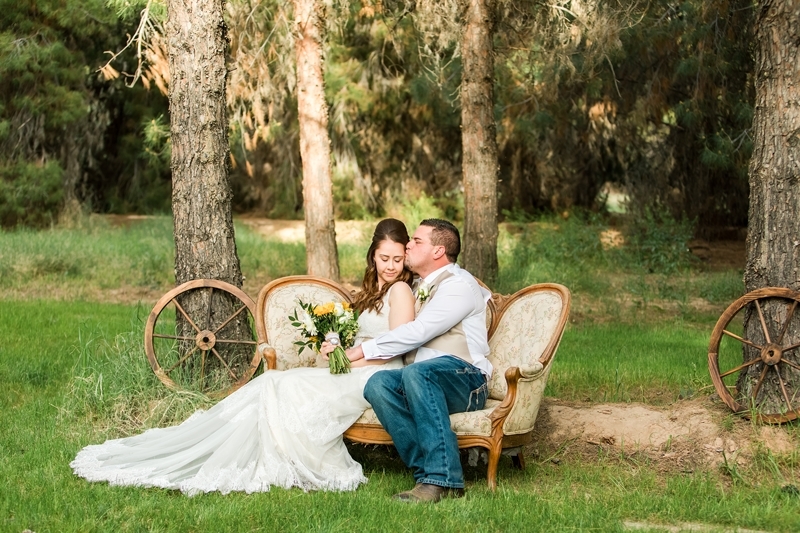 Everything had so much charm and I loved the rustic vibes. 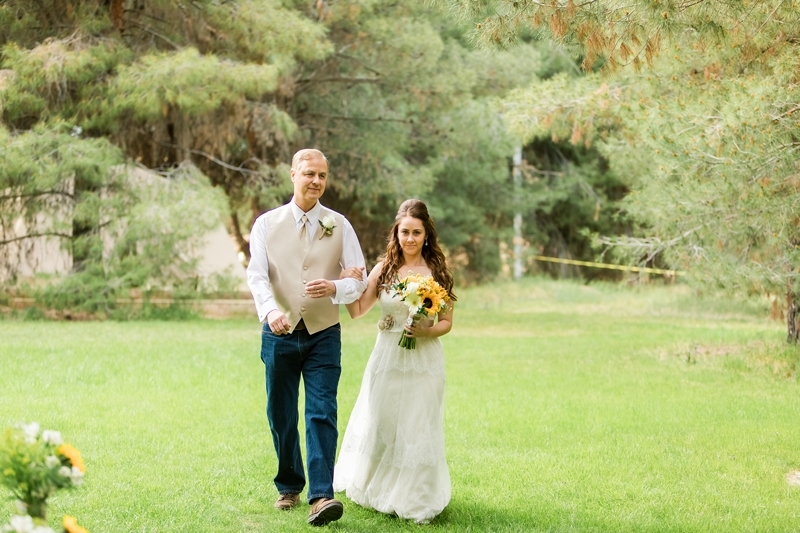 After the wedding ceremony, we walked around for a while to get some pictures of the two of them alone. 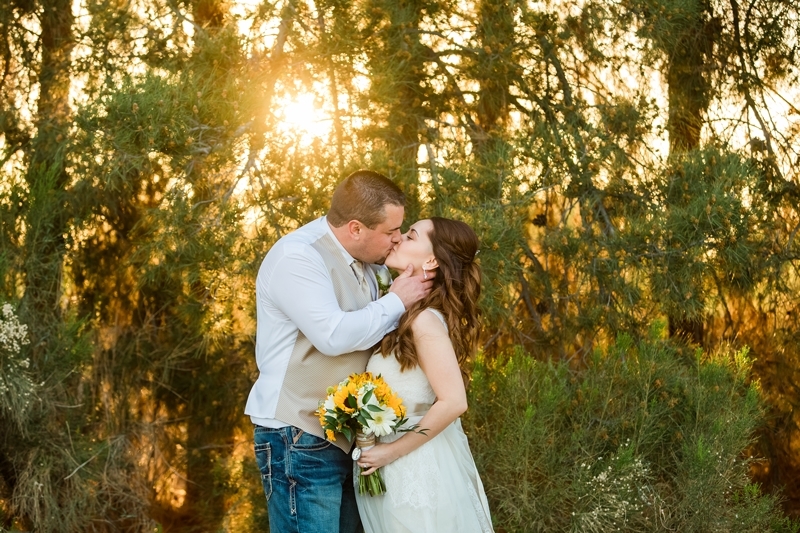 There was an amazing wall of pine trees off in the distance with specs of golden sunlight shining through. 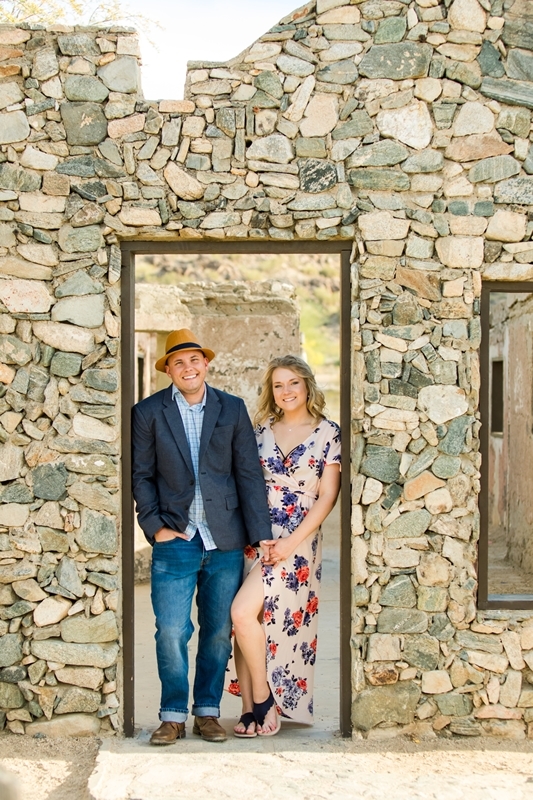 It made a fantastic backdrop for most of their photos. 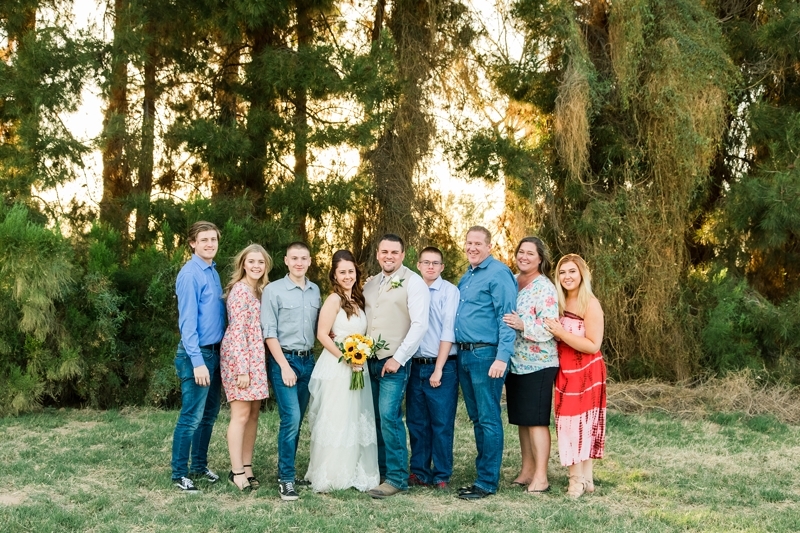 The family and bridal party joined us after a bit for some photos with the happy couple. 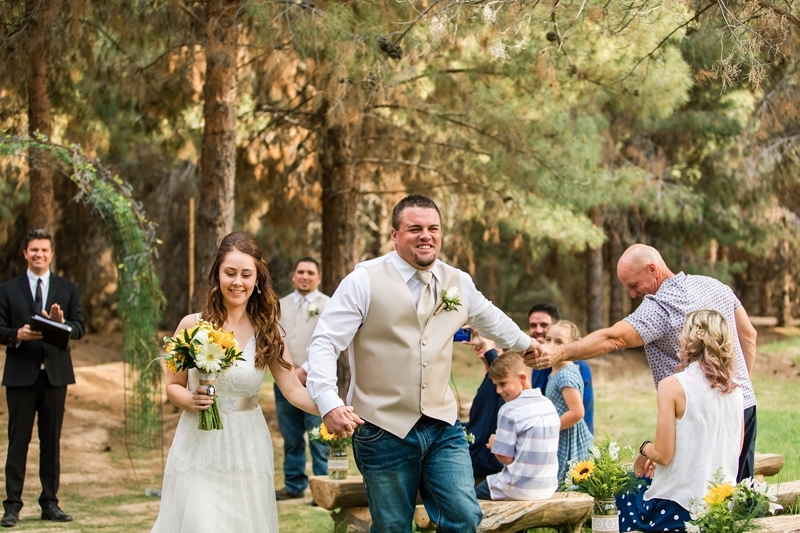 At the conclusion of pictures, the couple made a grand entrance into the reception. 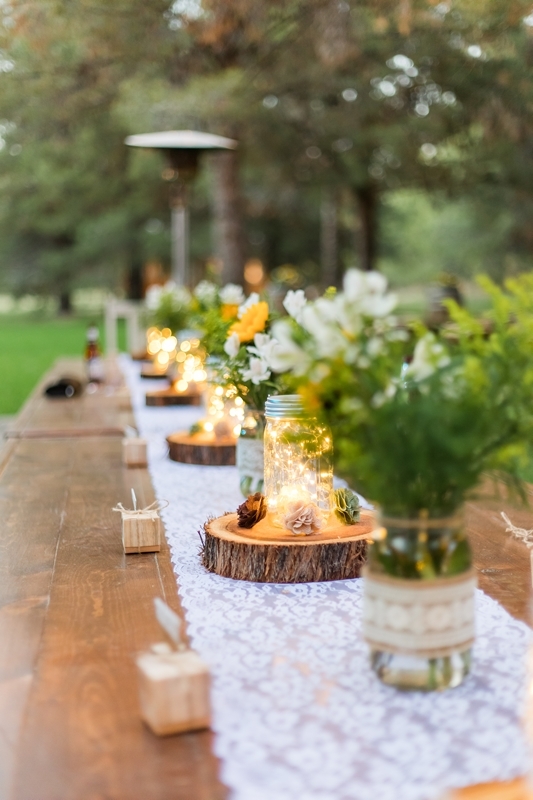 It was a quaint outdoor reception in the trees. 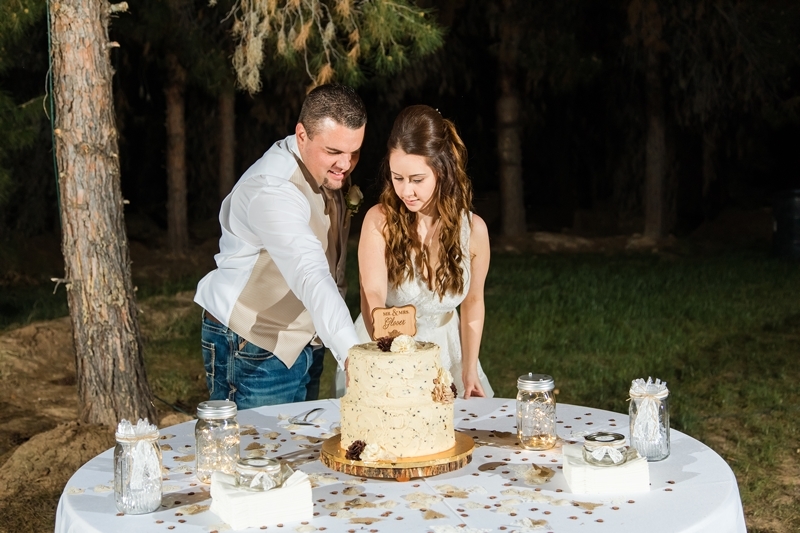 The couple danced, ate dinner, cut their cake and danced some more. 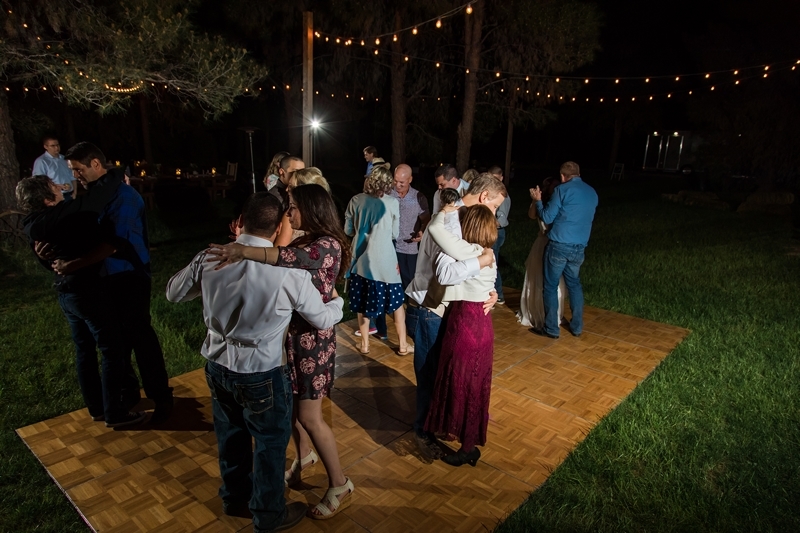 It was a great time for everyone. 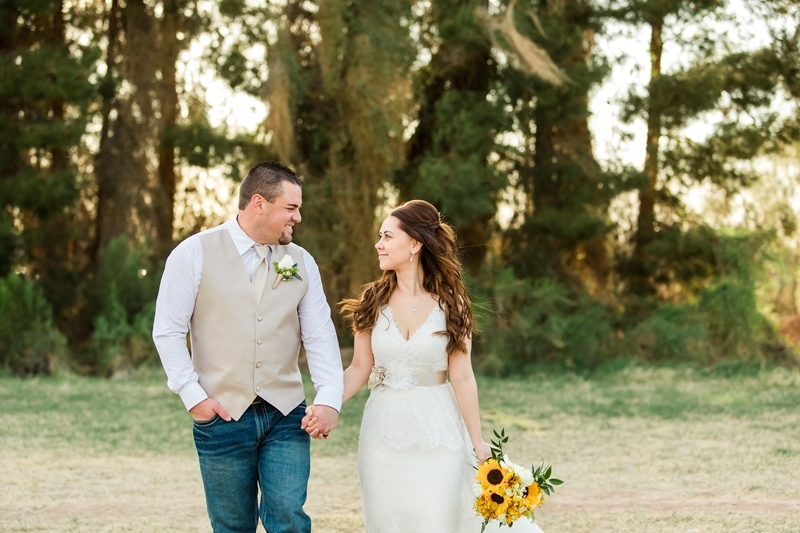 I really enjoyed getting to know this couple and I’m so happy they chose me to be their Queen Creek Wedding Photographer. 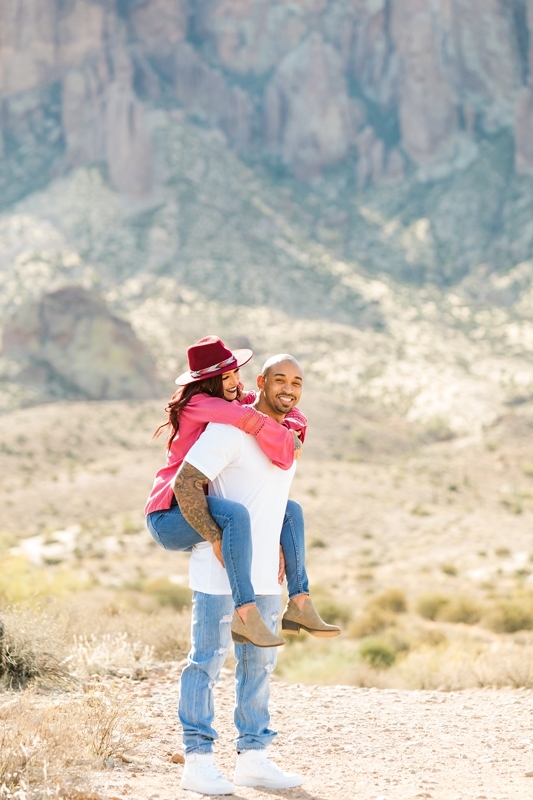 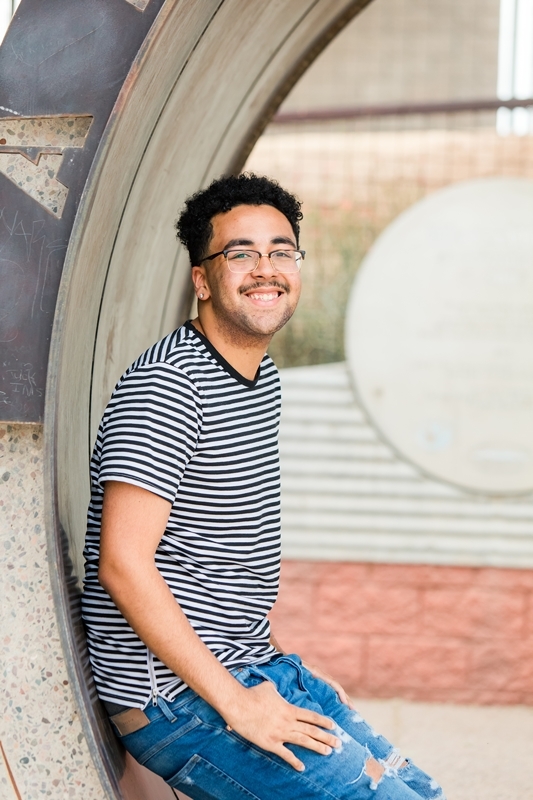 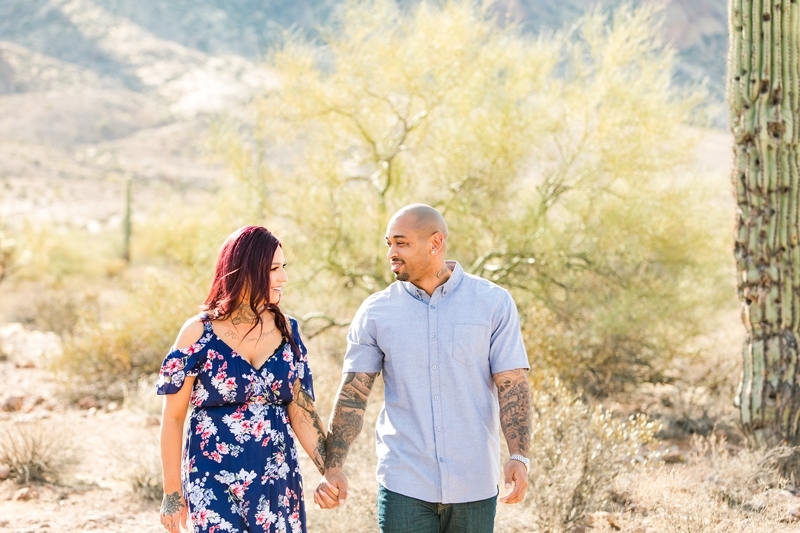 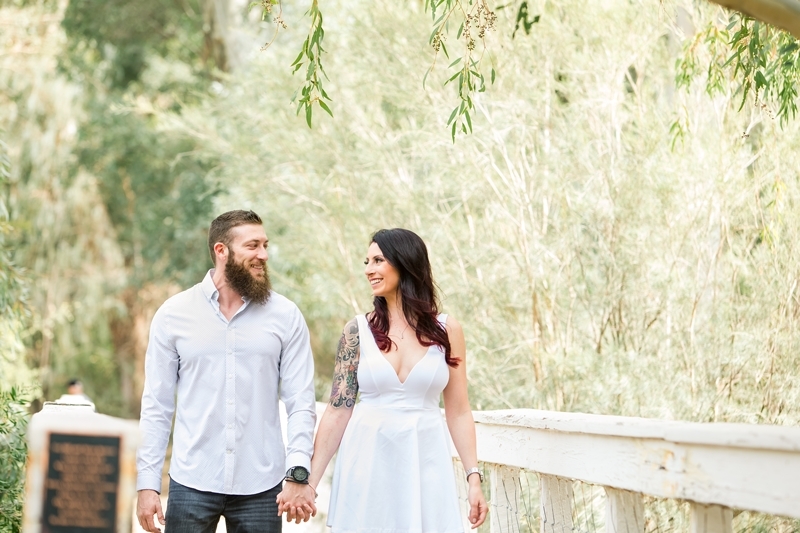 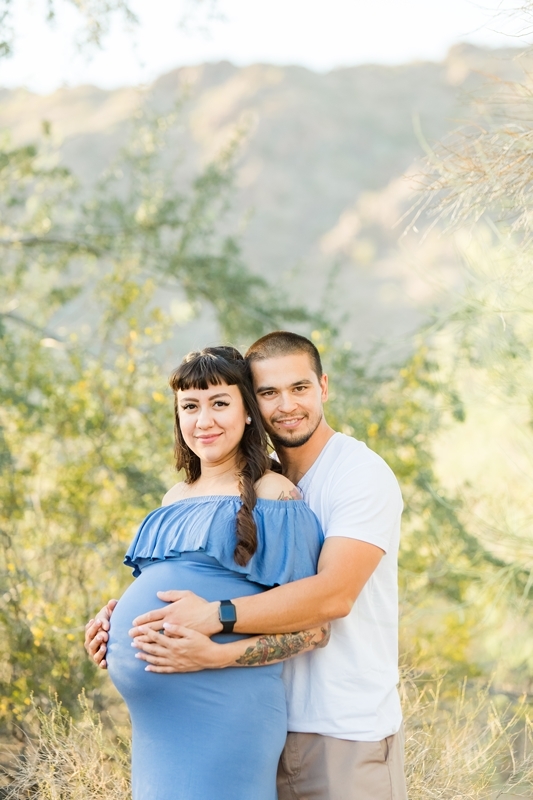 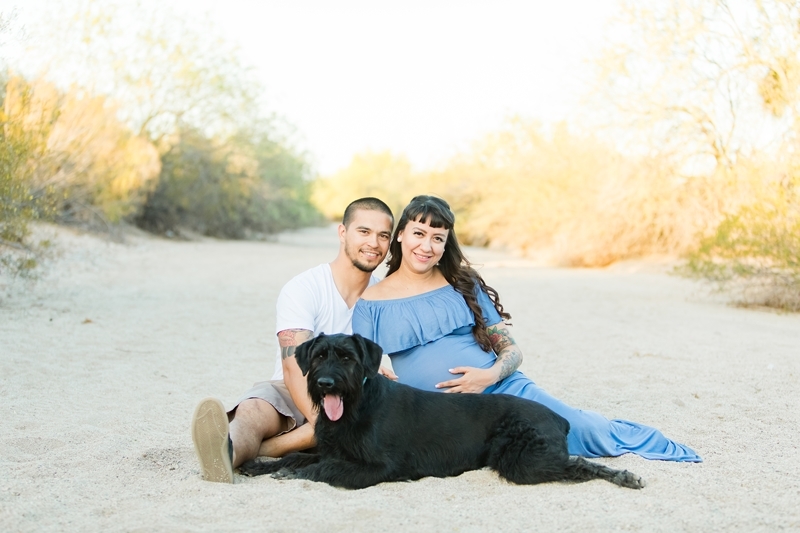 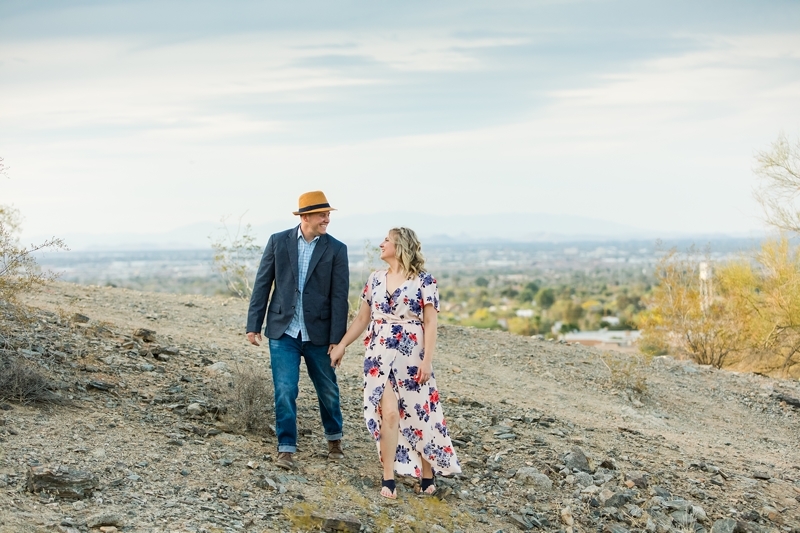 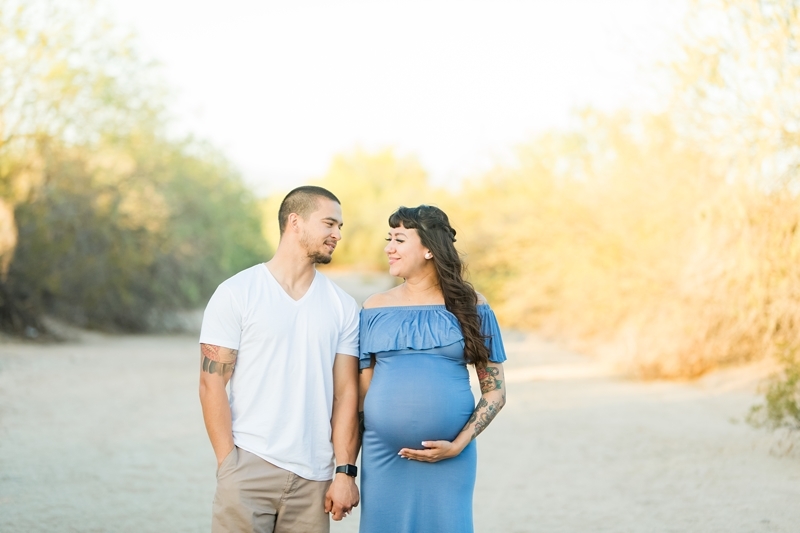 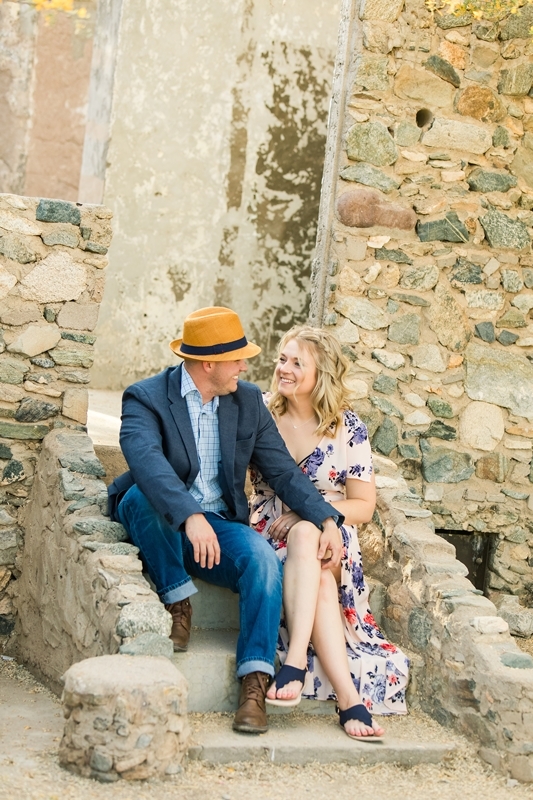 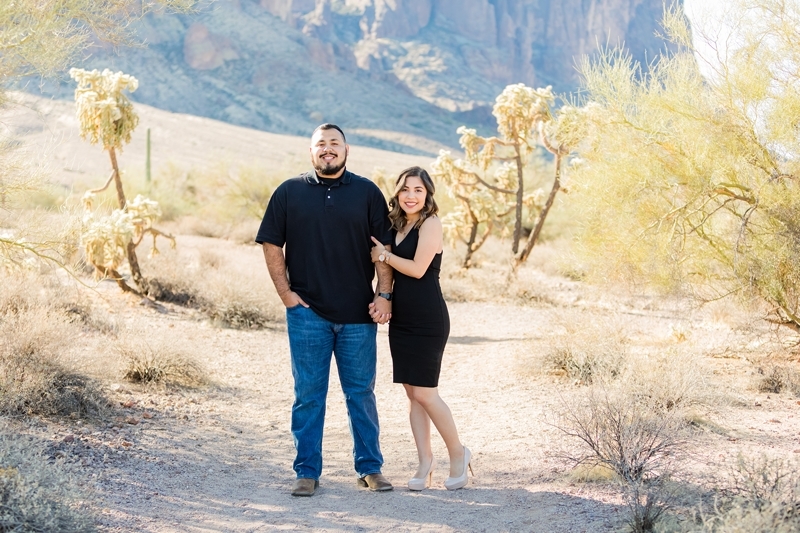 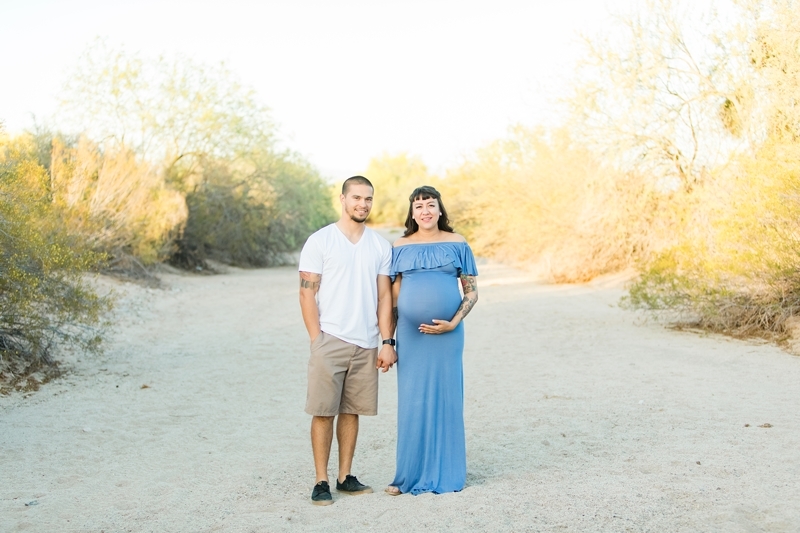 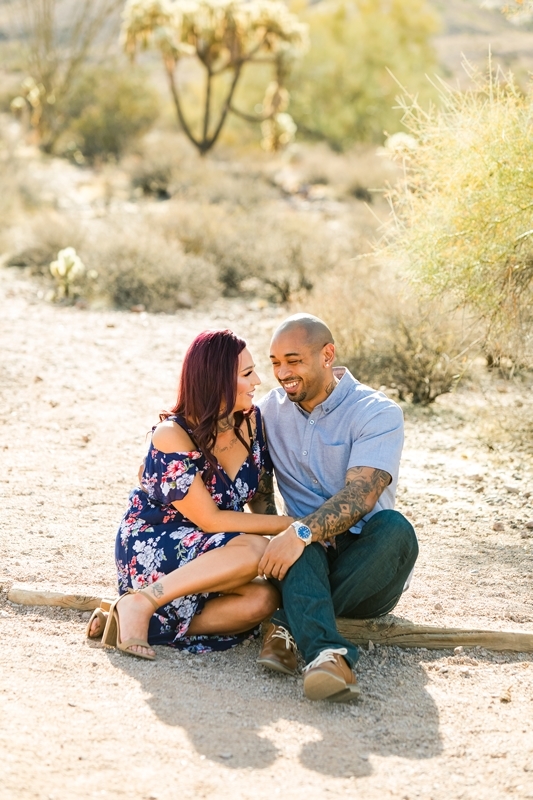 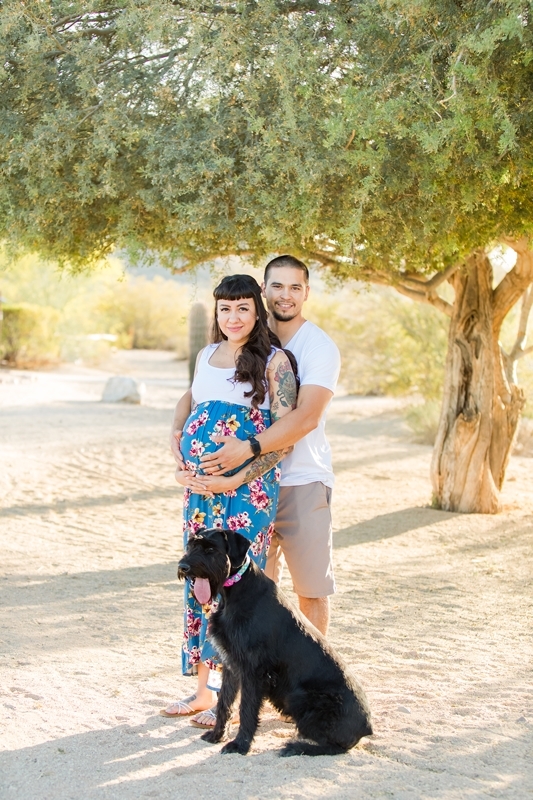 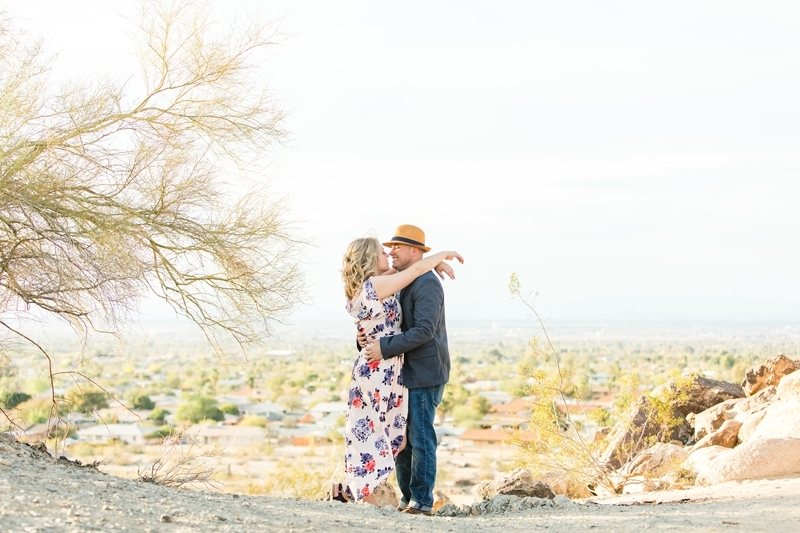 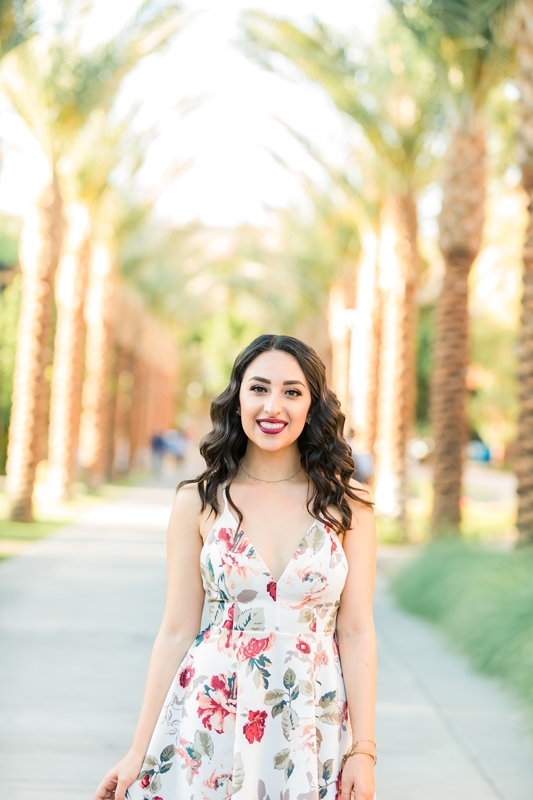 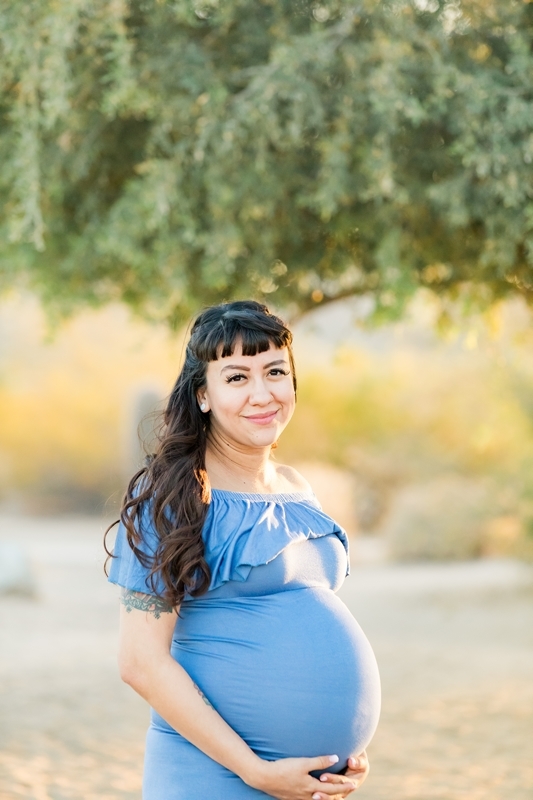 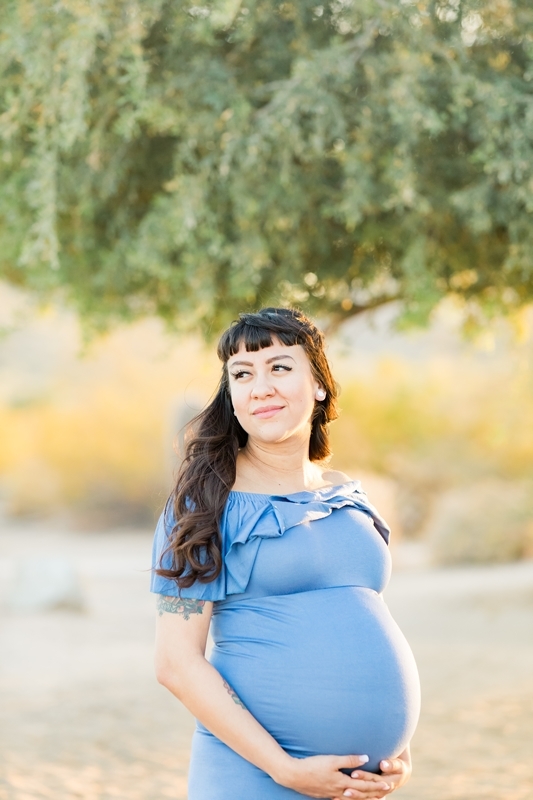 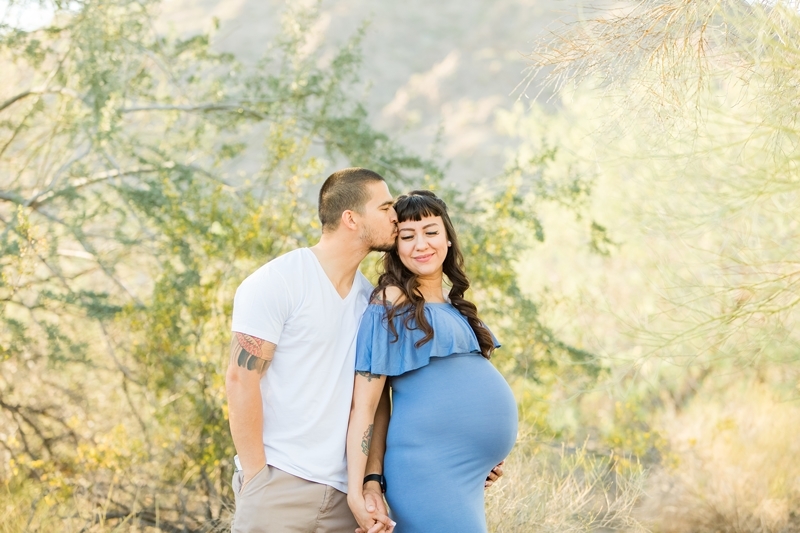 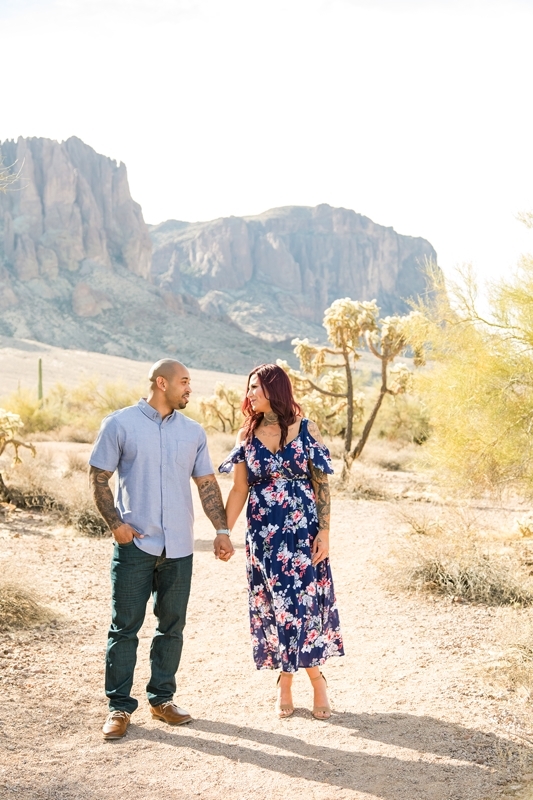 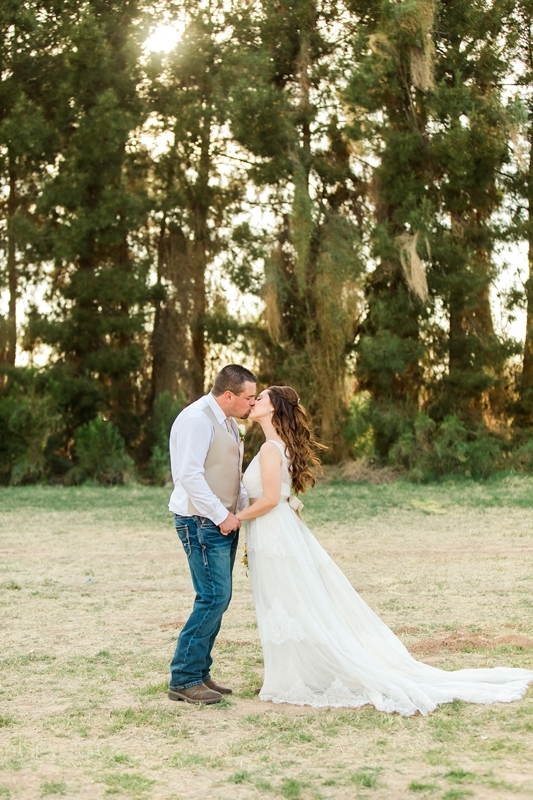 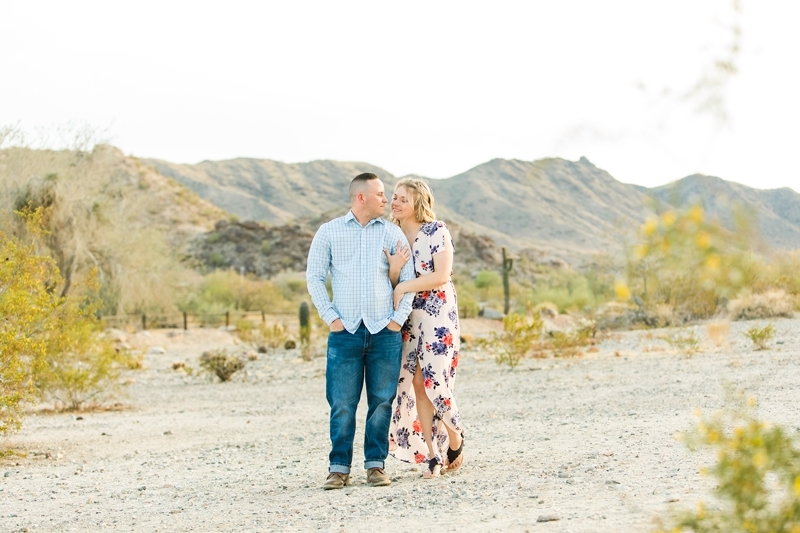 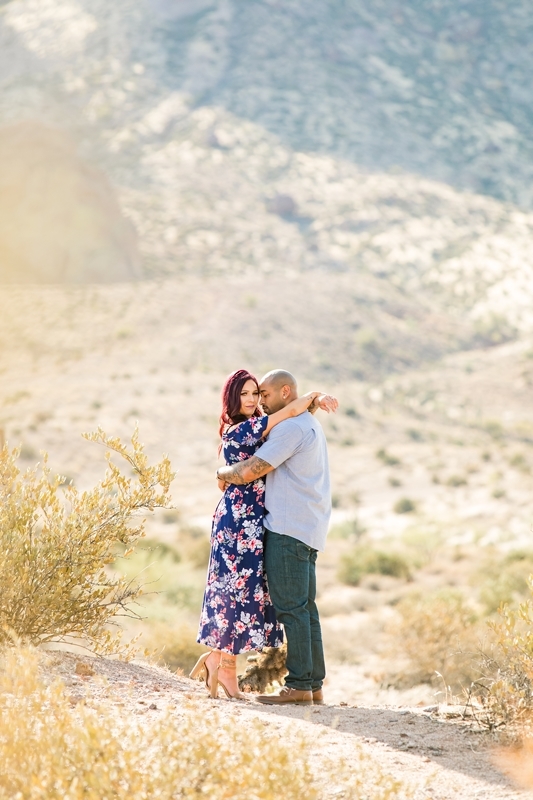 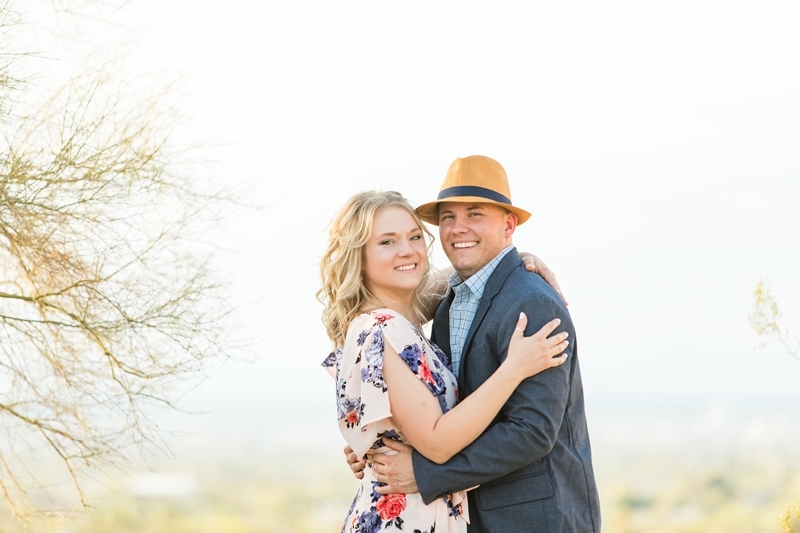 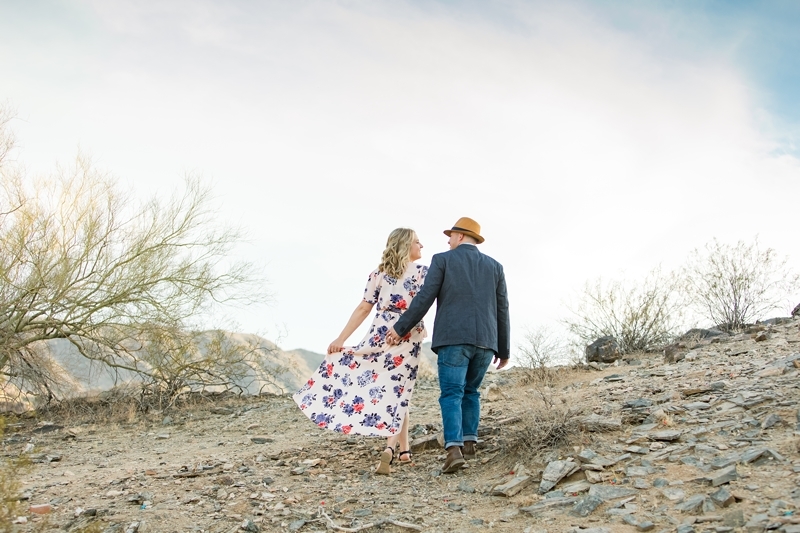 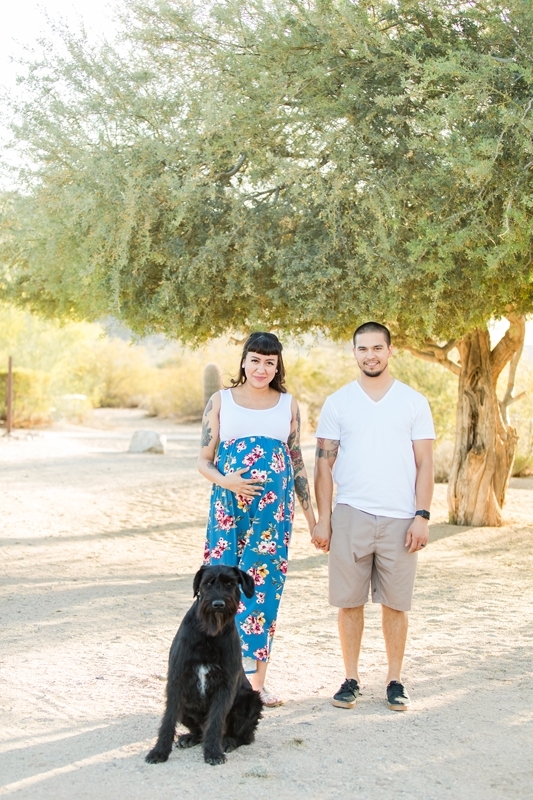 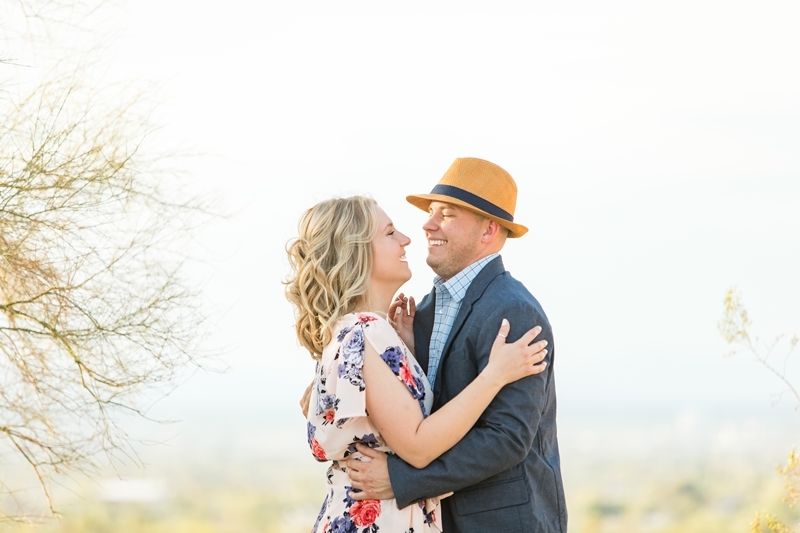 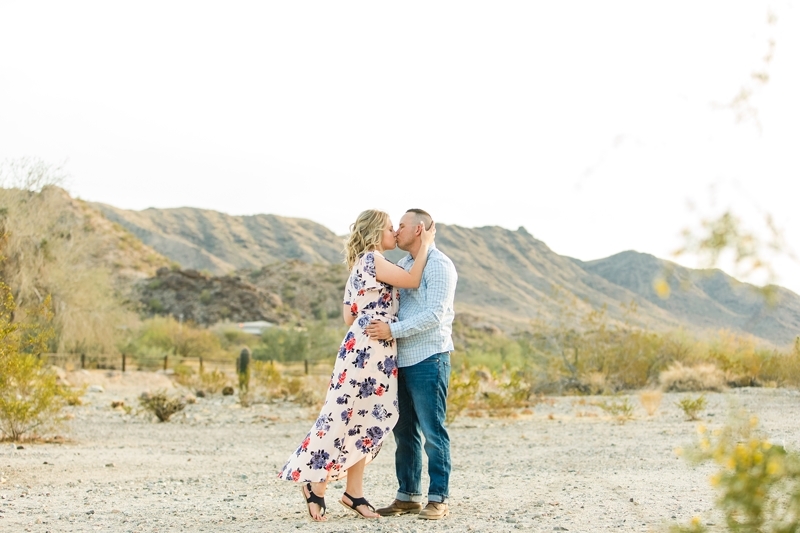 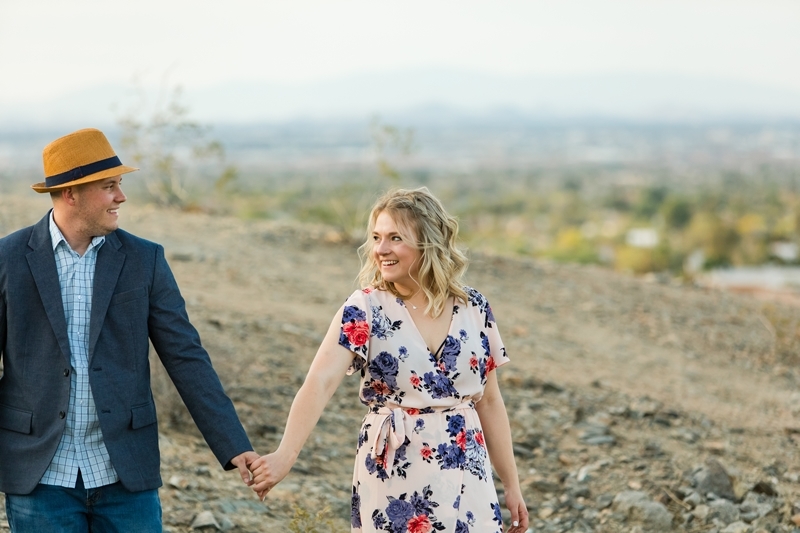 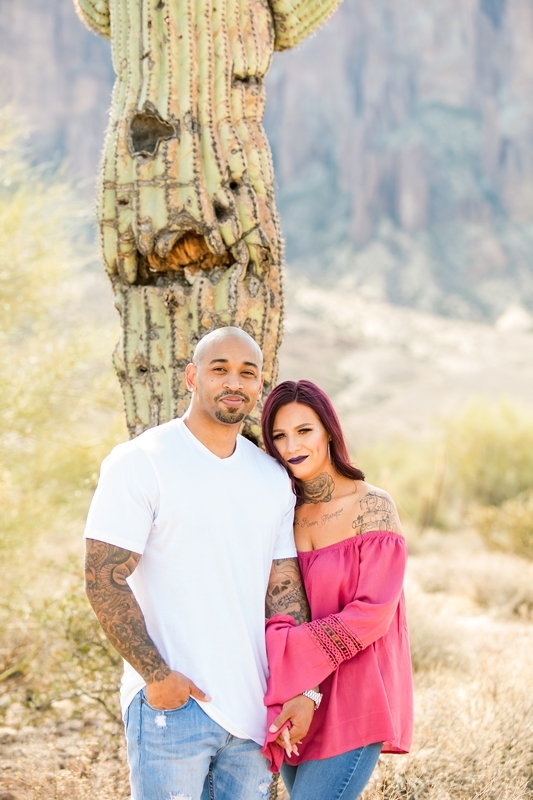 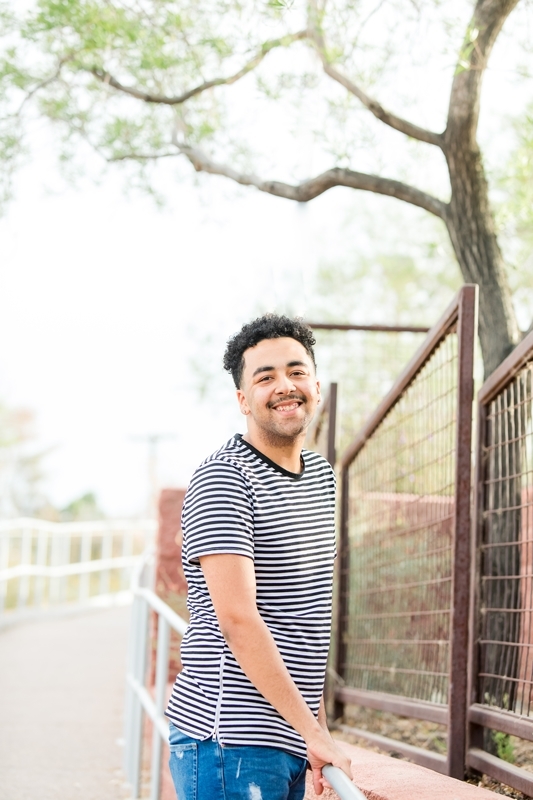 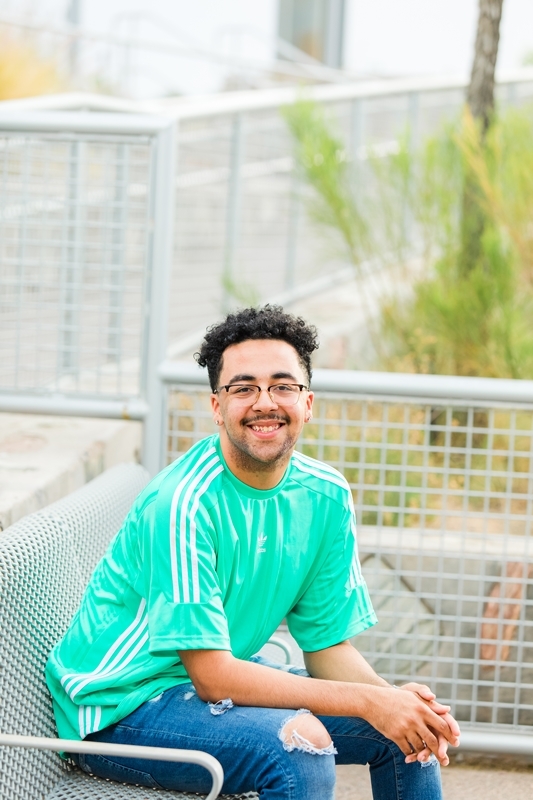 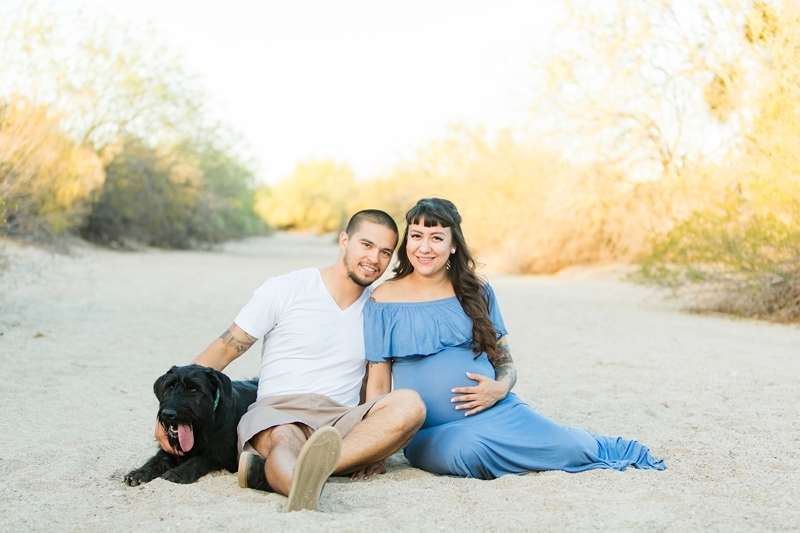 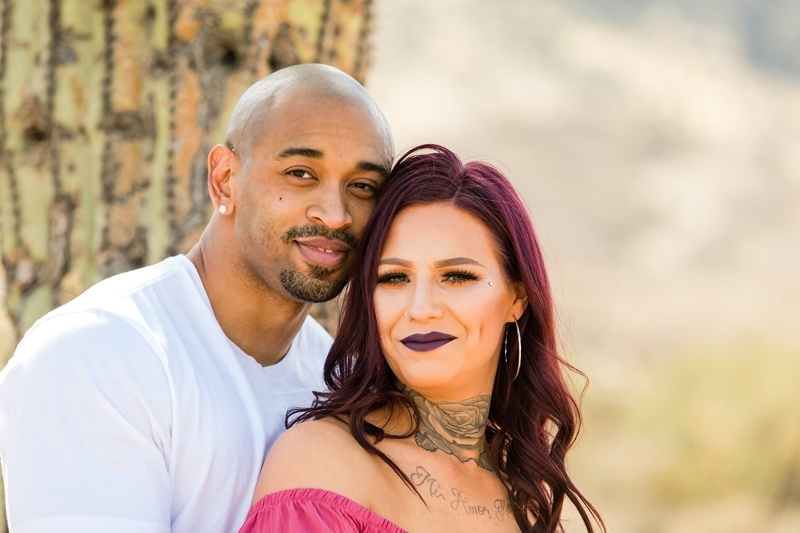 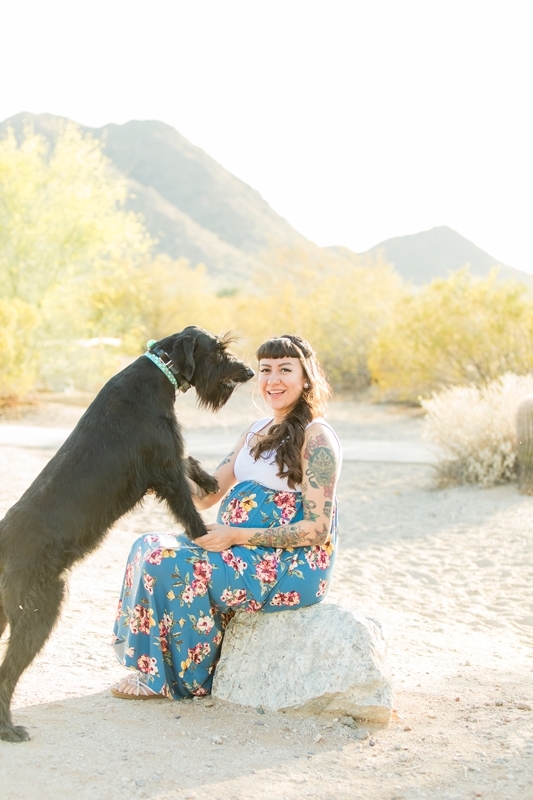 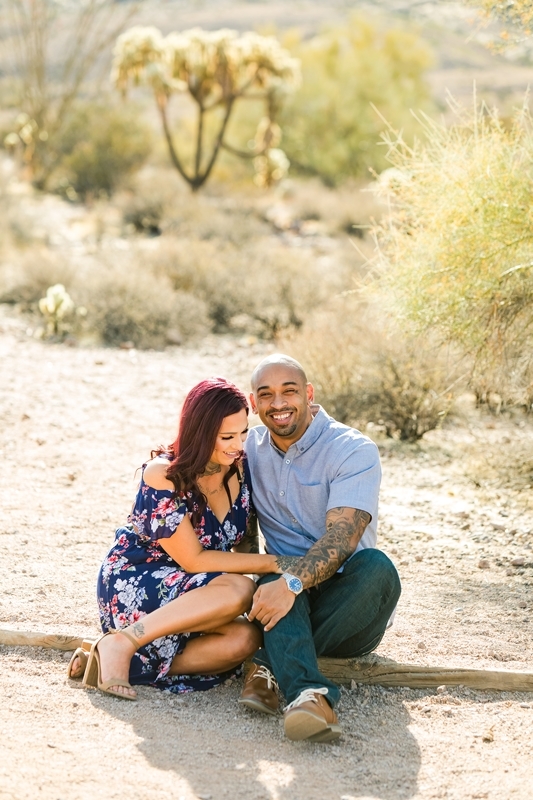 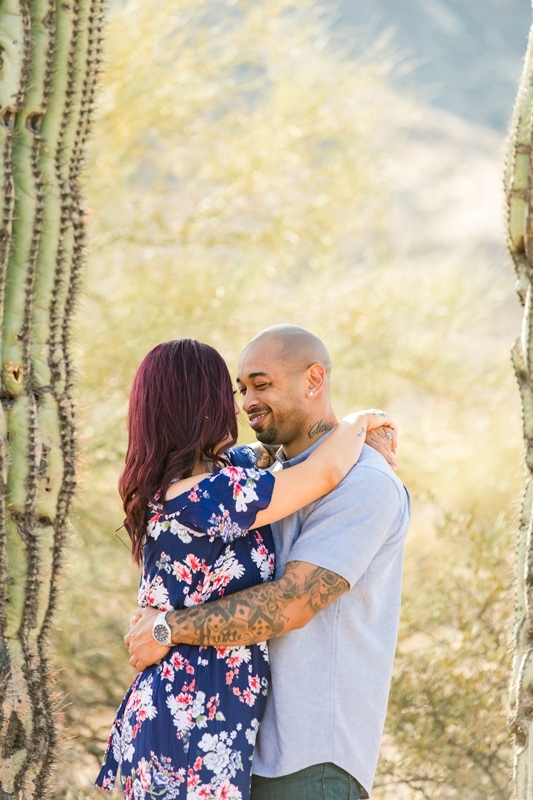 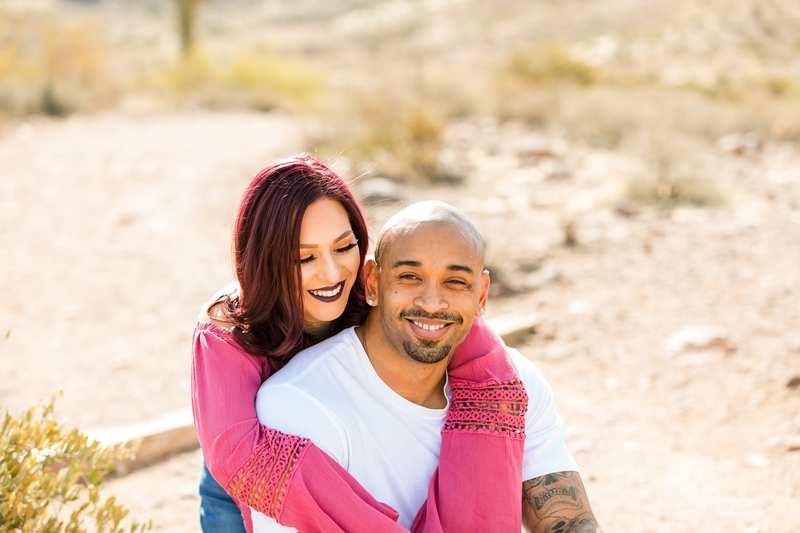 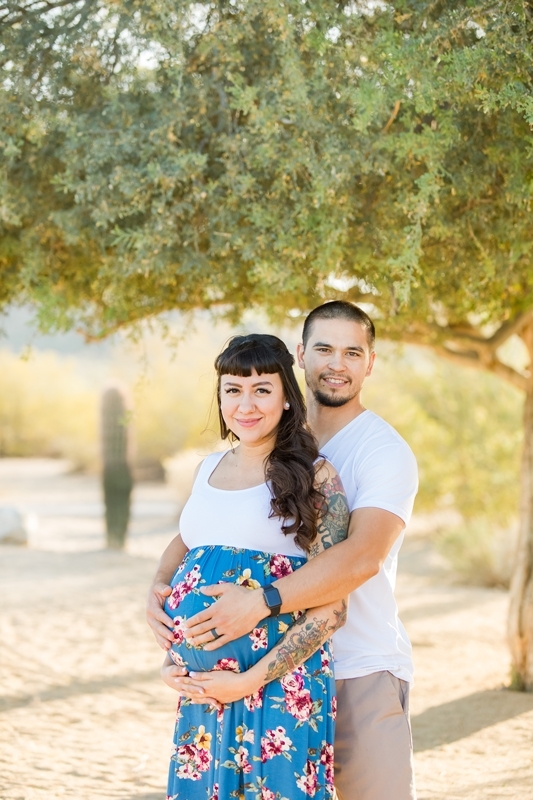 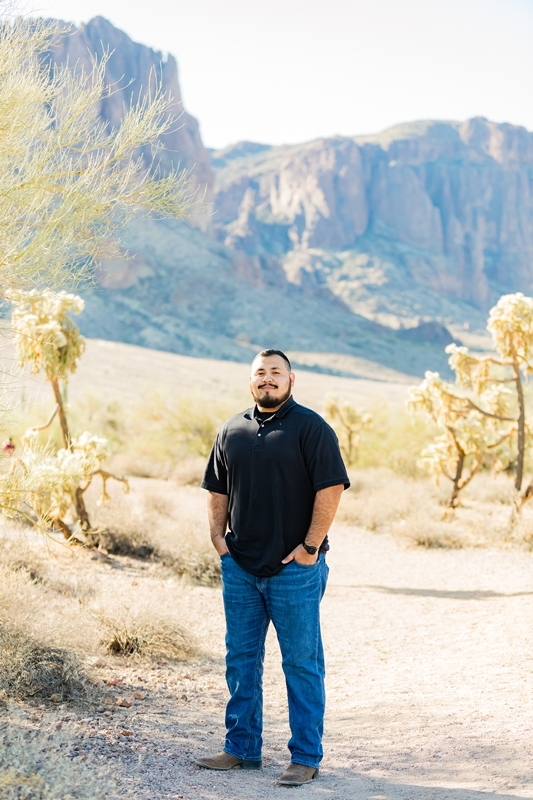 This Phoenix Engagement Photography session was so beautiful. 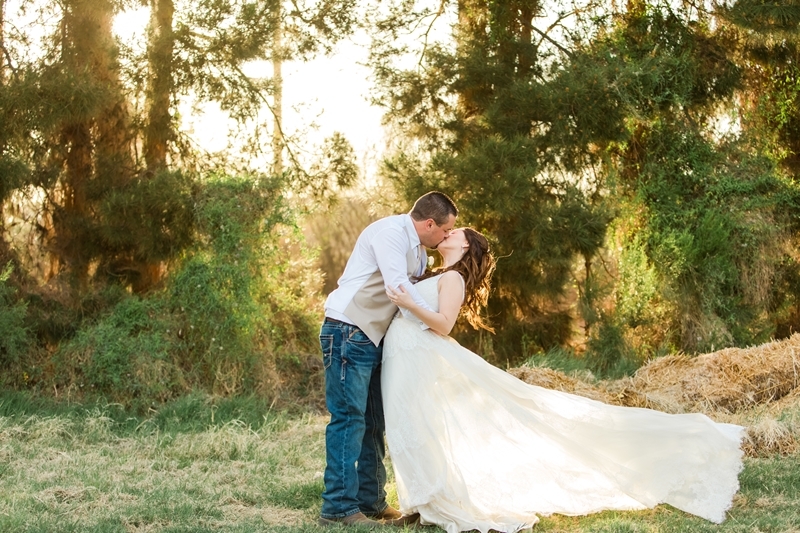 The morning light was soft and perfect. 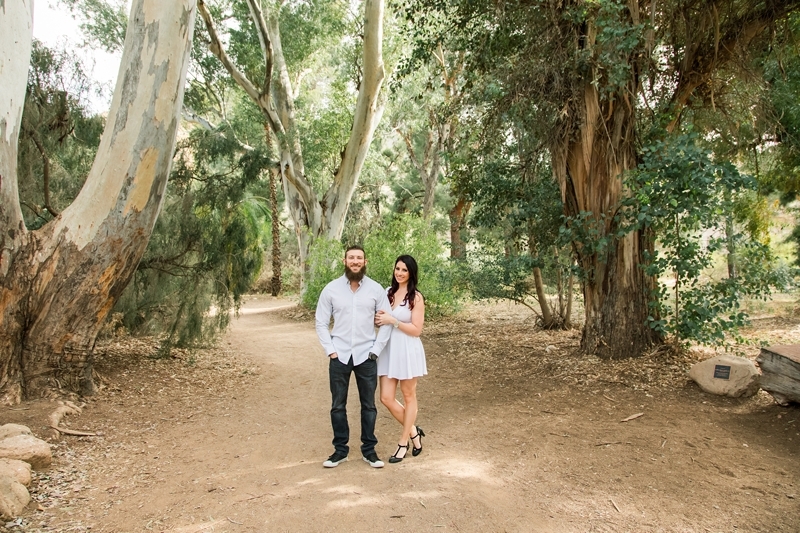 Robert and Clarise chose this amazing location for their engagement session. 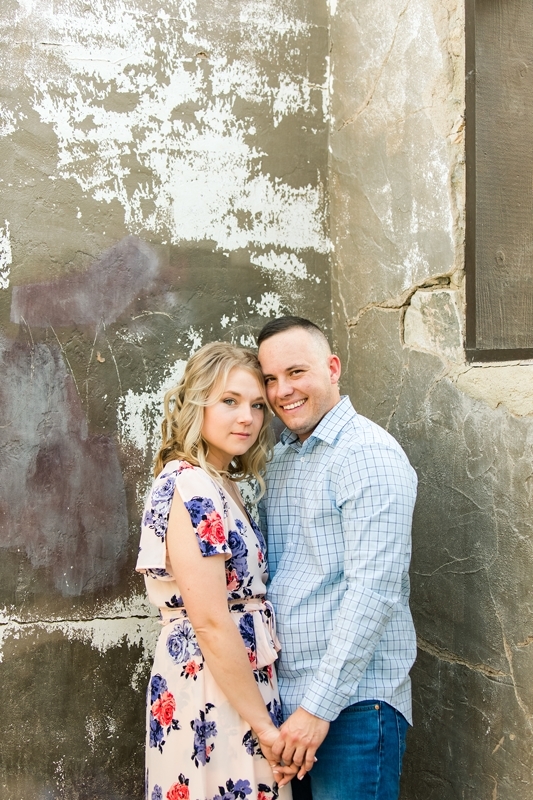 They both expressed their concerns to me that they considered themselves to not be photogenic. 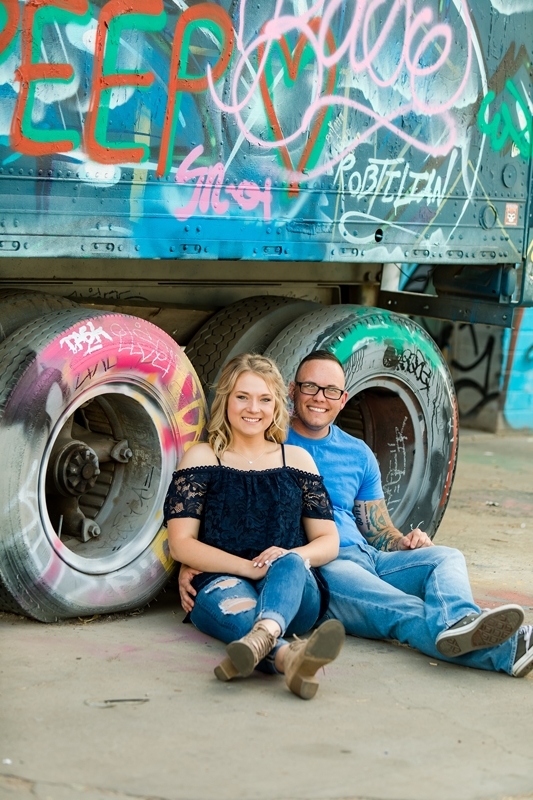 I was completely shocked to hear this from them because they are stunning! 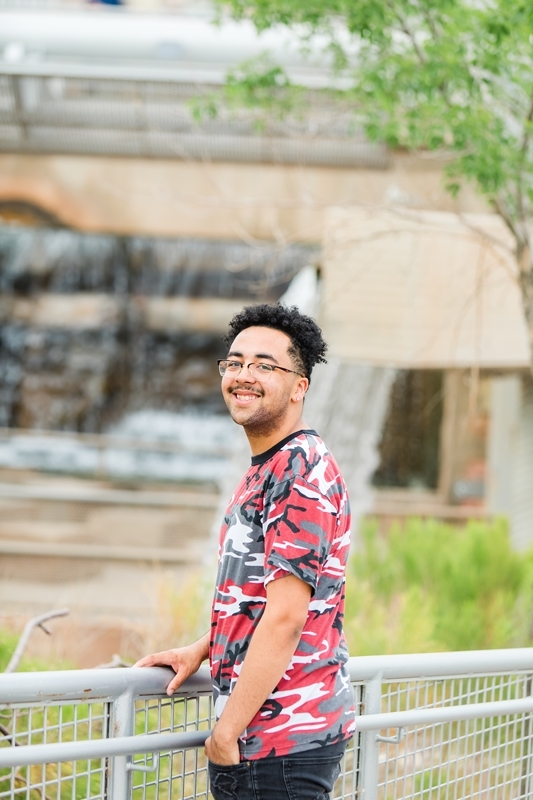 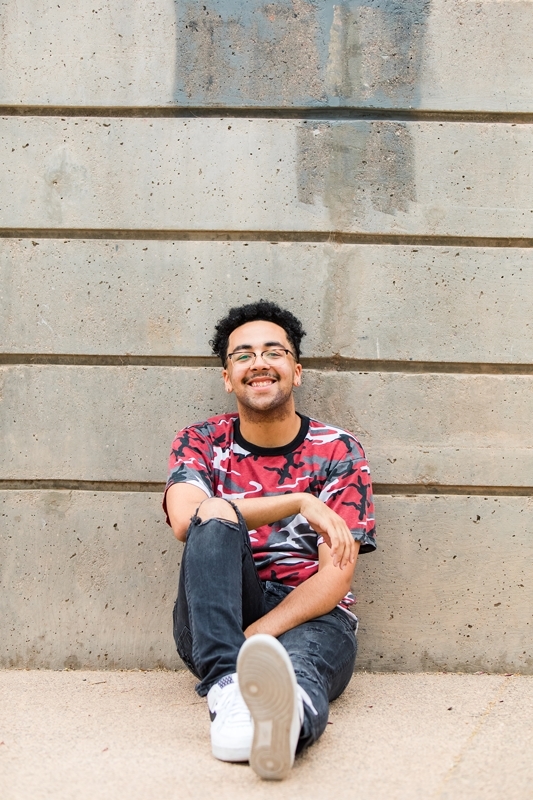 However, at the session it did take a bit before I could see them gaining confidence and I could see them start to relax and enjoy themselves. 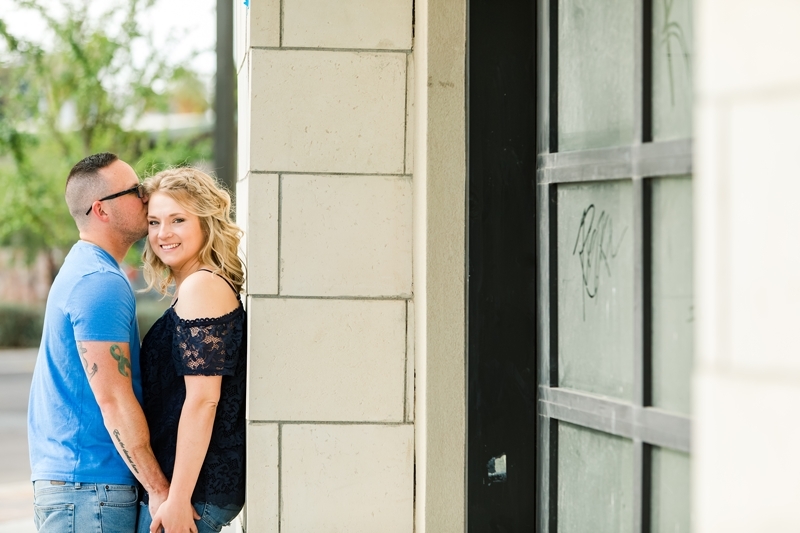 I can definitely say that they are very photogenic people. 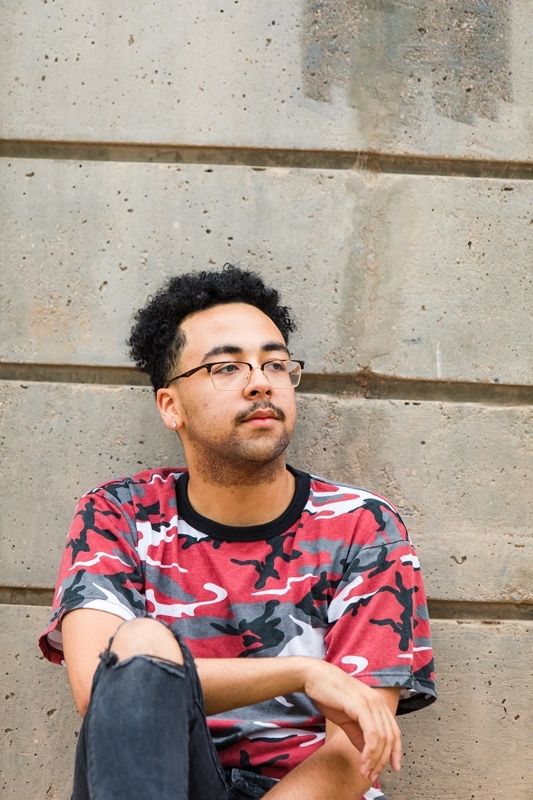 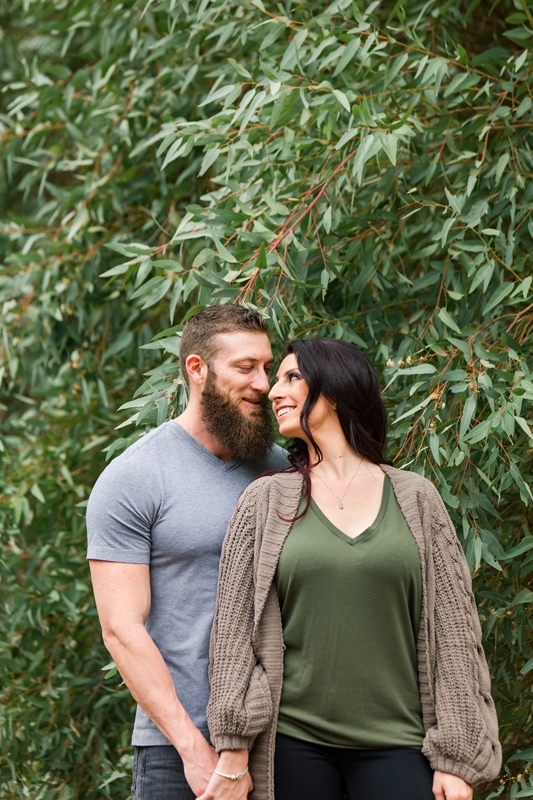 Not too many people I’ve met are naturals in front of the camera. 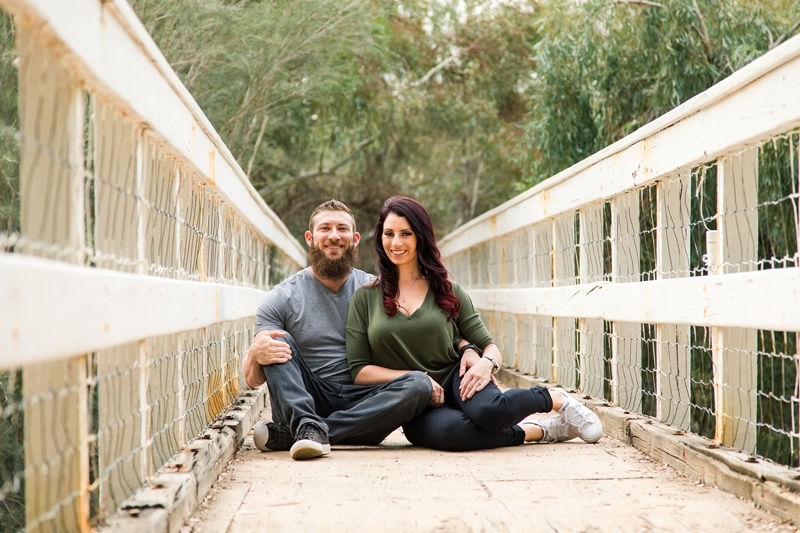 It feels a little awkward at first but I really try to make things light and fun. 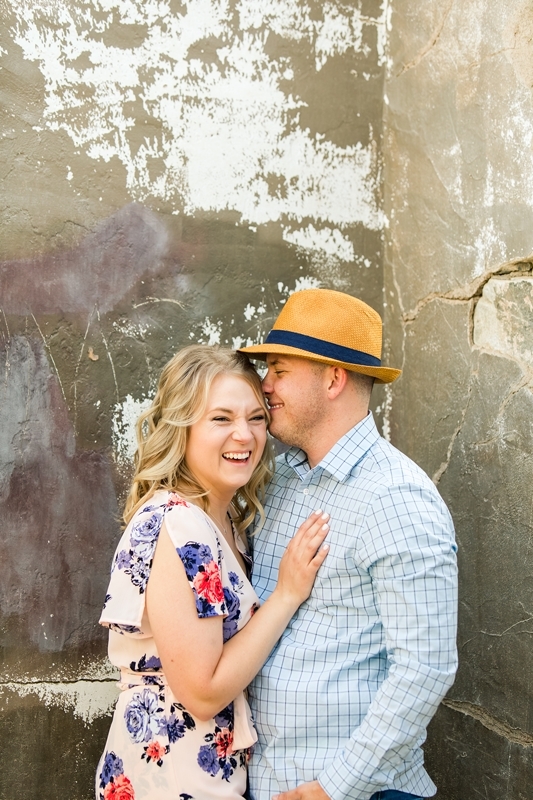 I love the pictures towards the end of their session where they are laughing and being playful. 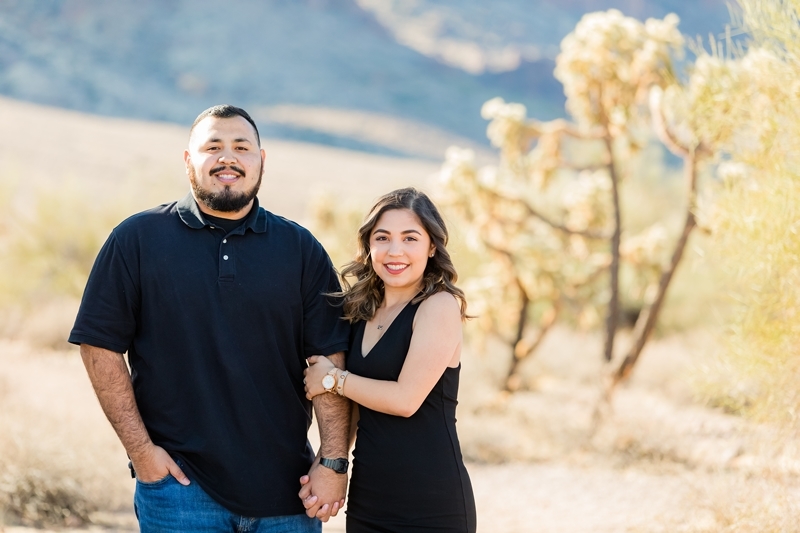 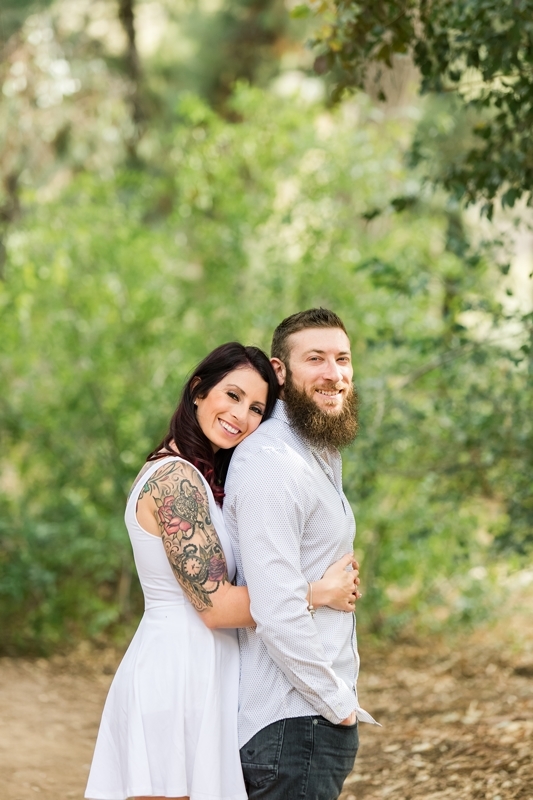 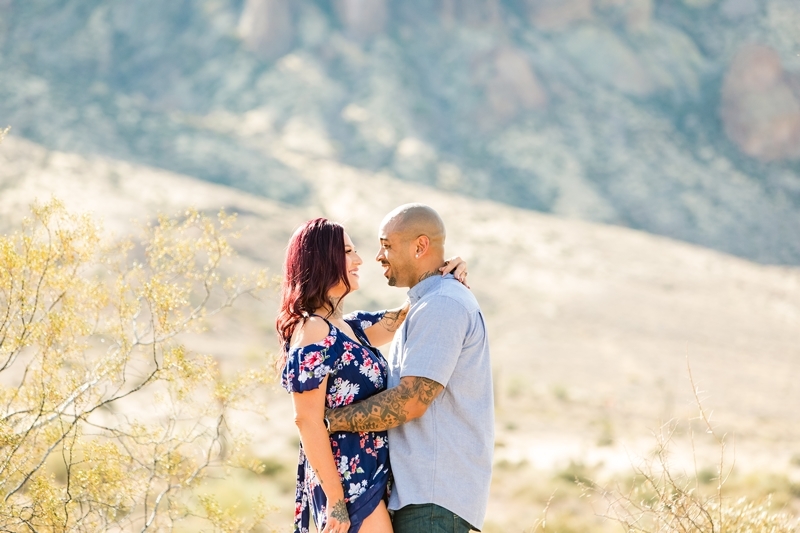 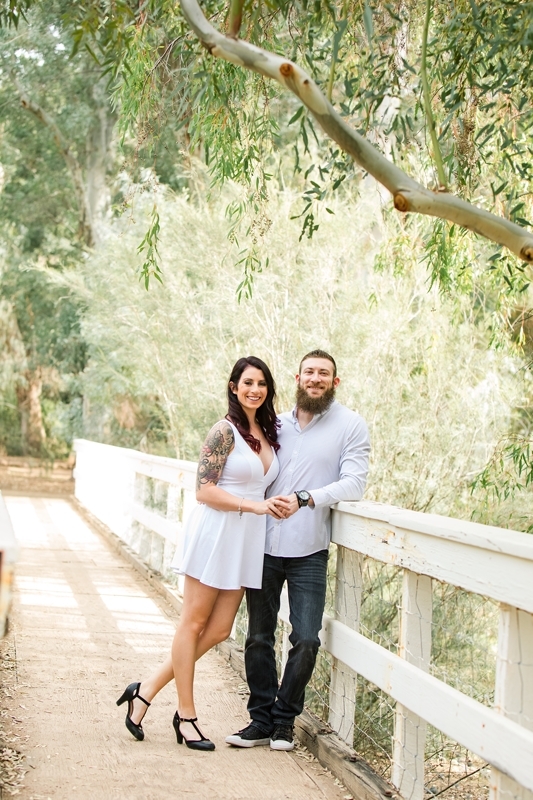 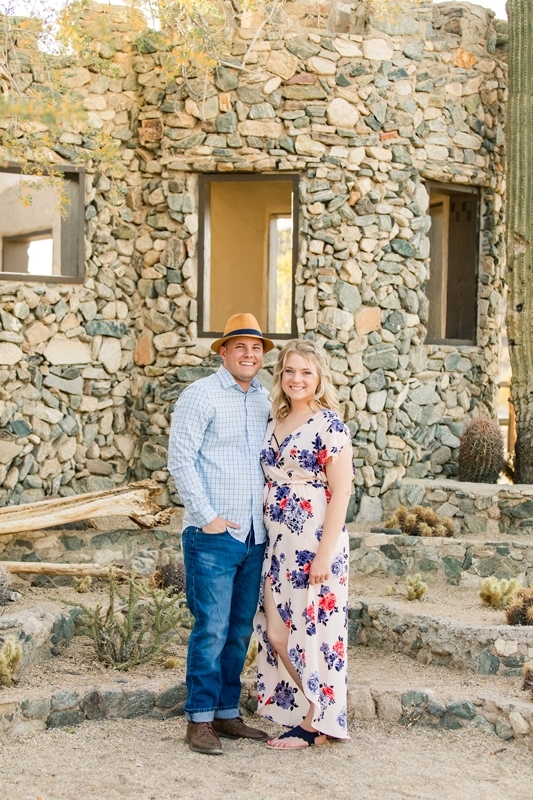 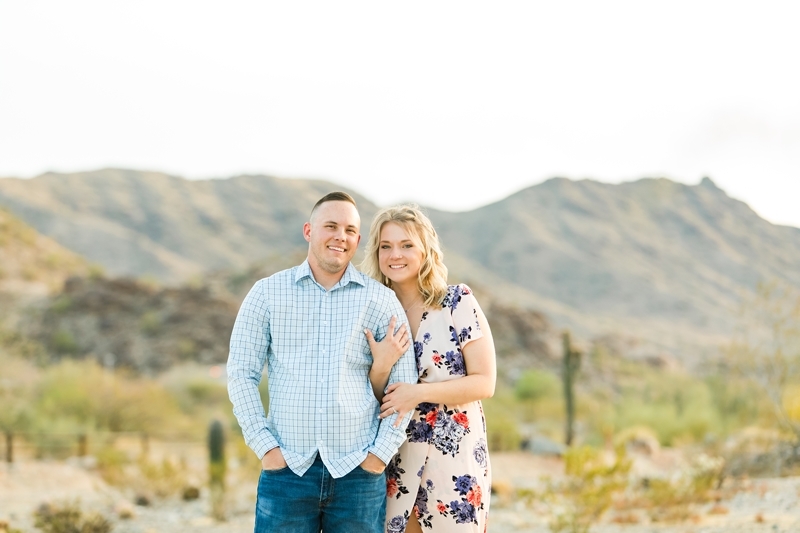 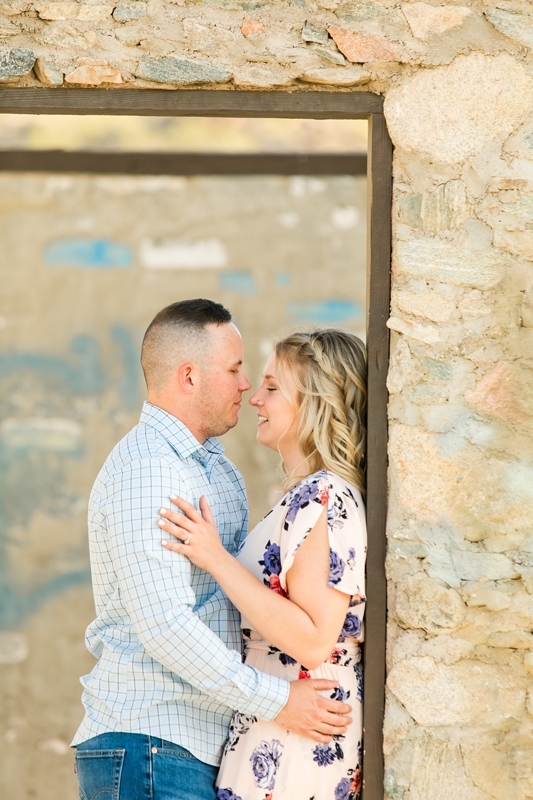 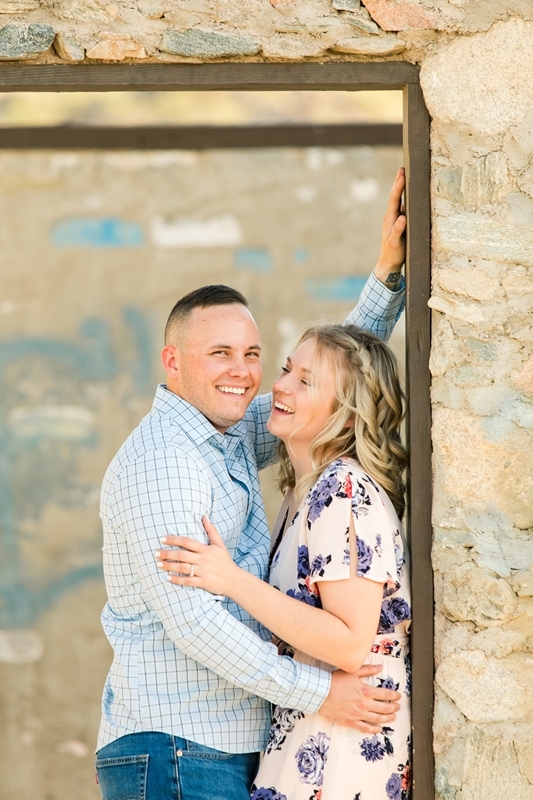 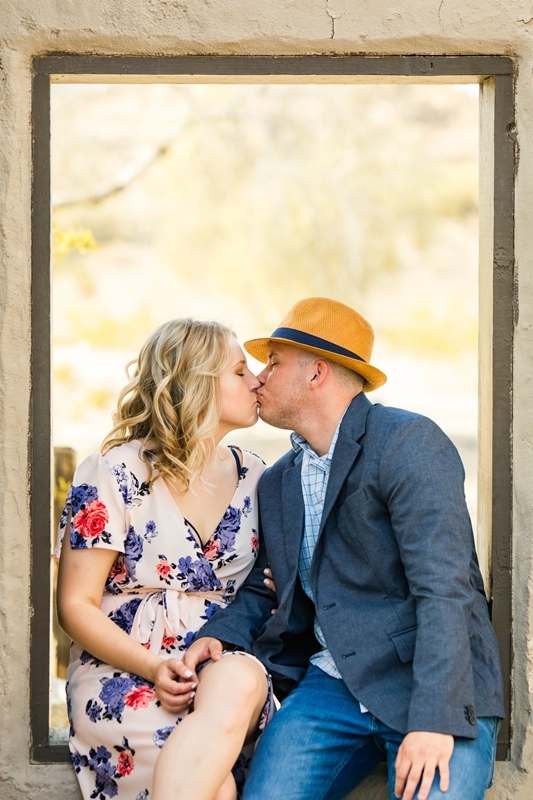 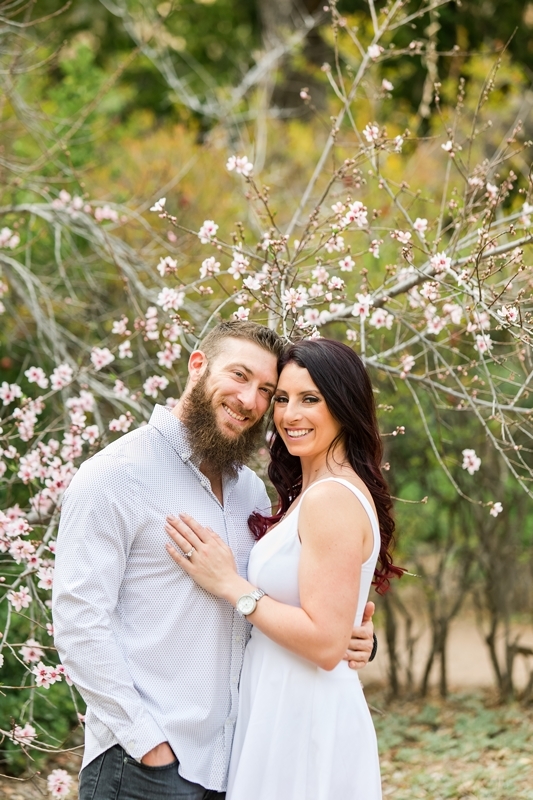 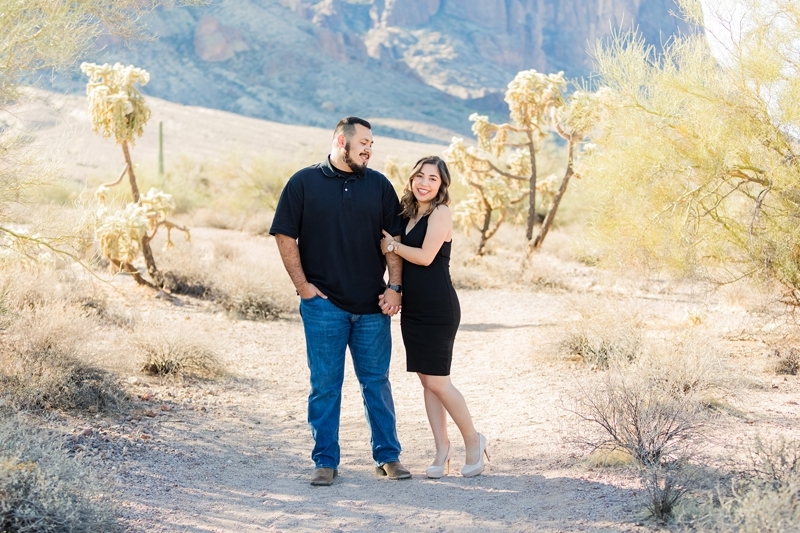 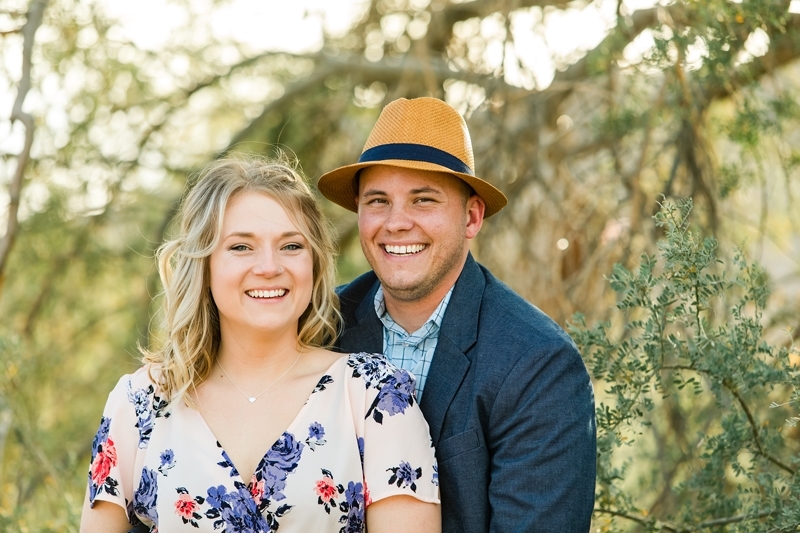 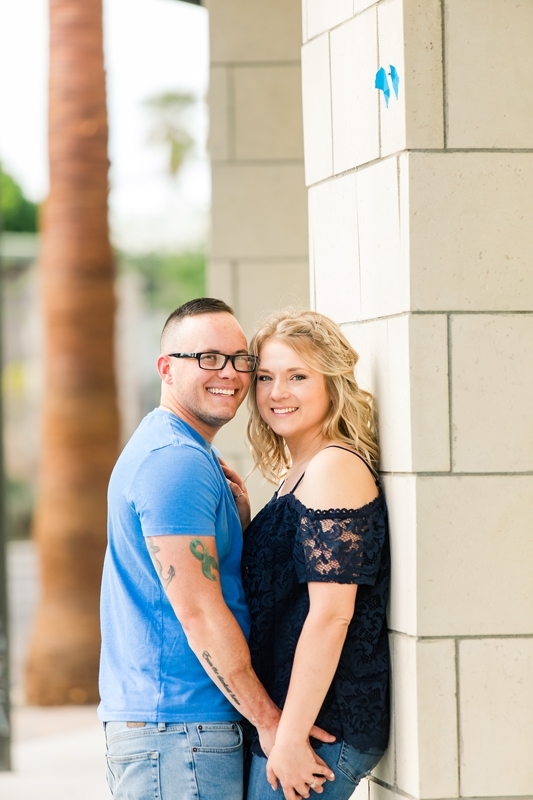 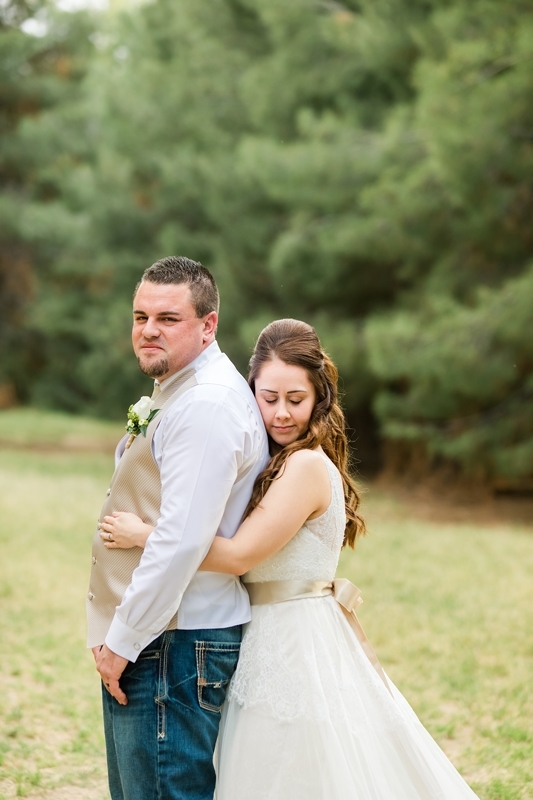 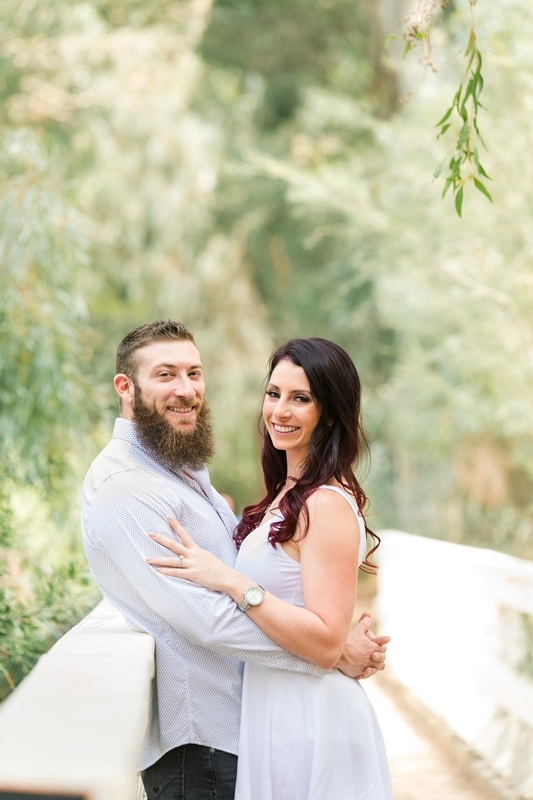 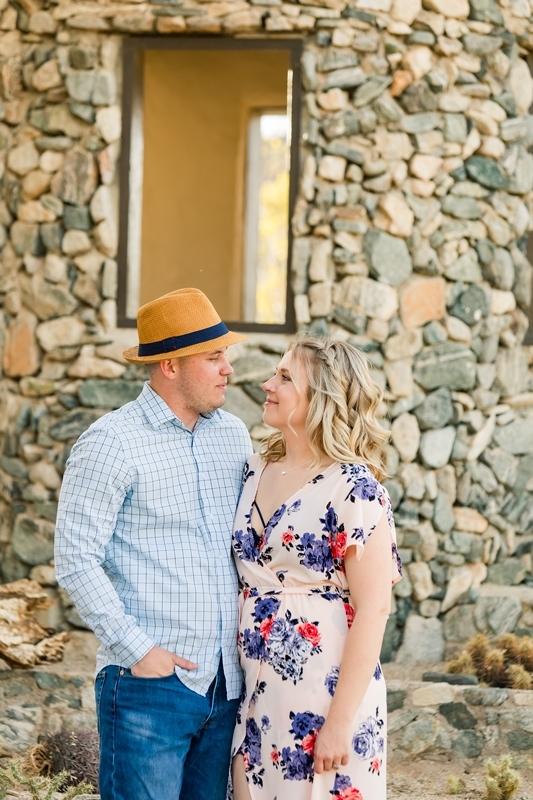 I am so excited to see them again in a couple of months for their Queen Creek wedding. 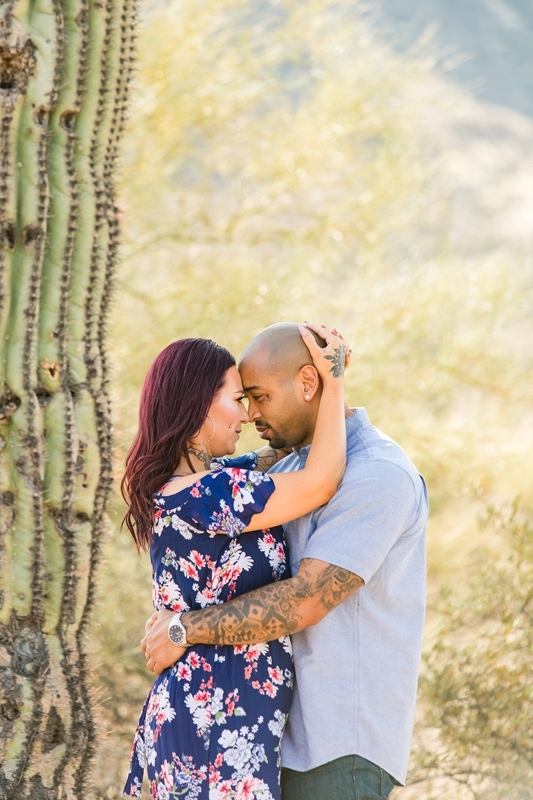 Thanks so much for a great session and for allowing me to be your Phoenix Engagement Photographer! 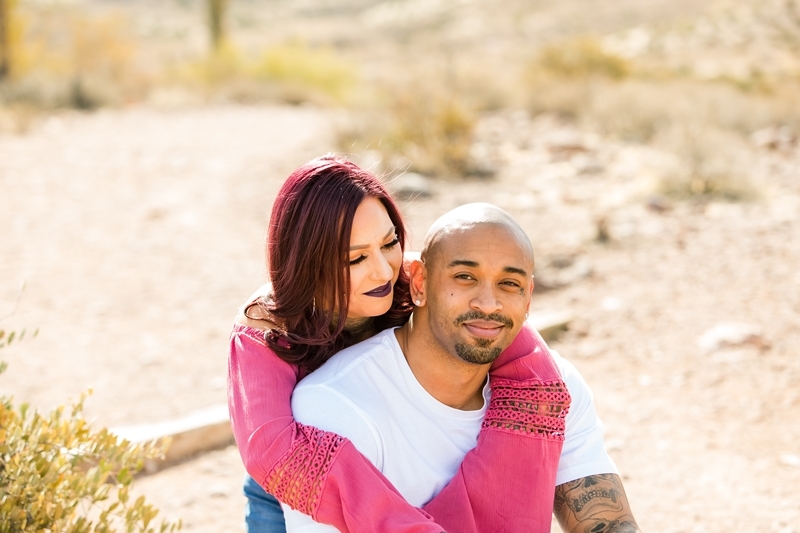 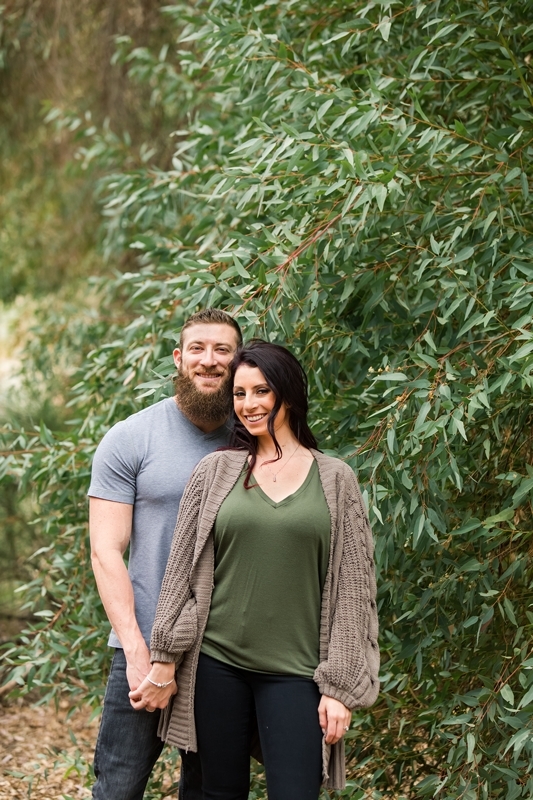 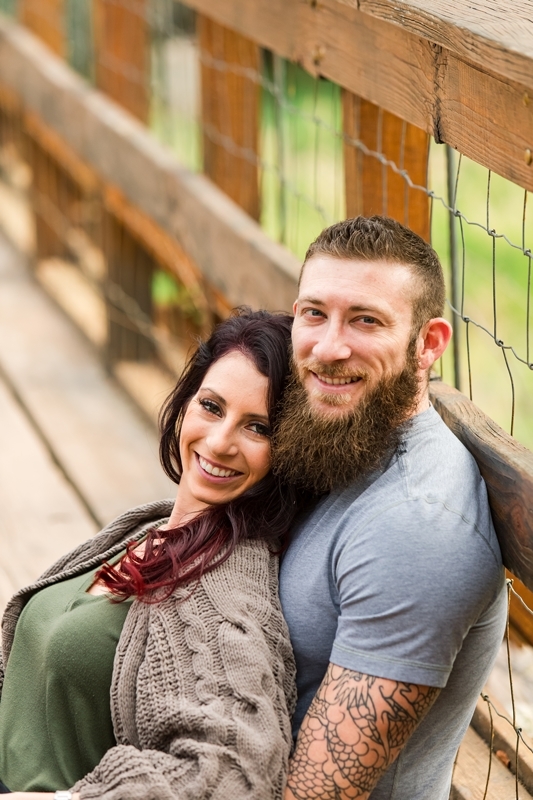 Jace and Kazandra were so much fun to take engagement photos of. 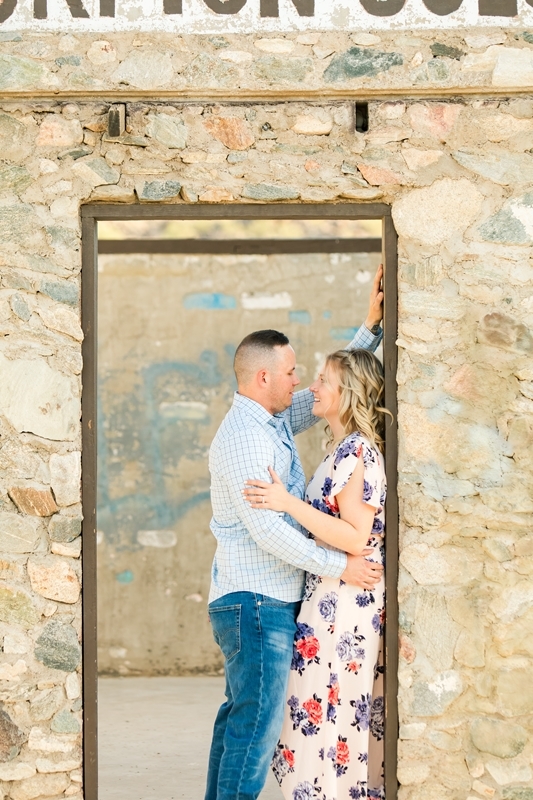 I love the location they chose for their session. 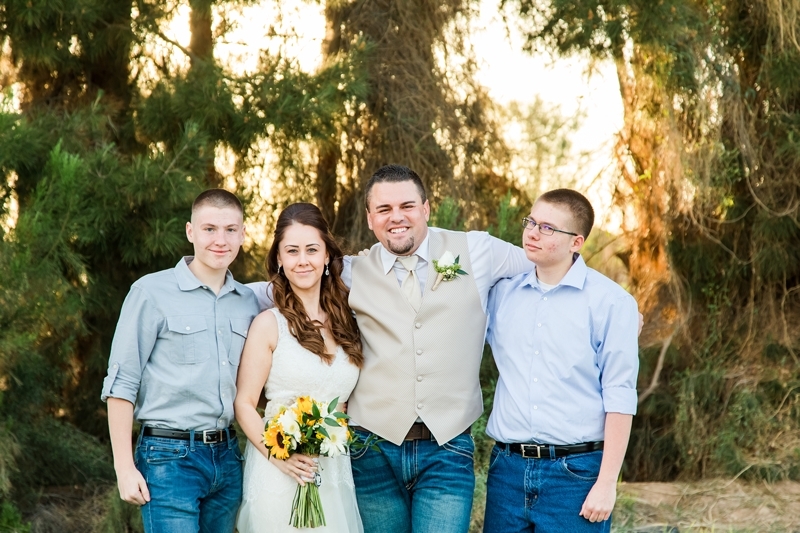 There is so much variety there. 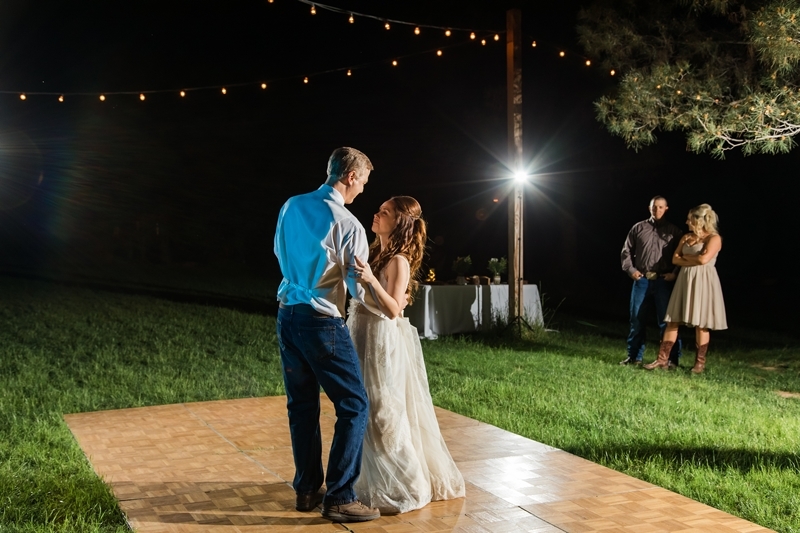 We chose the perfect evening to be there as well. 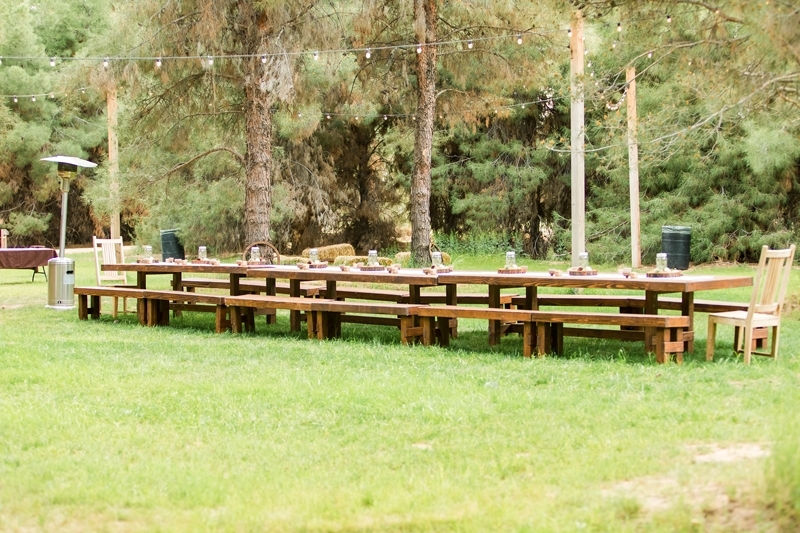 It wasn’t crowded and the weather was perfect. 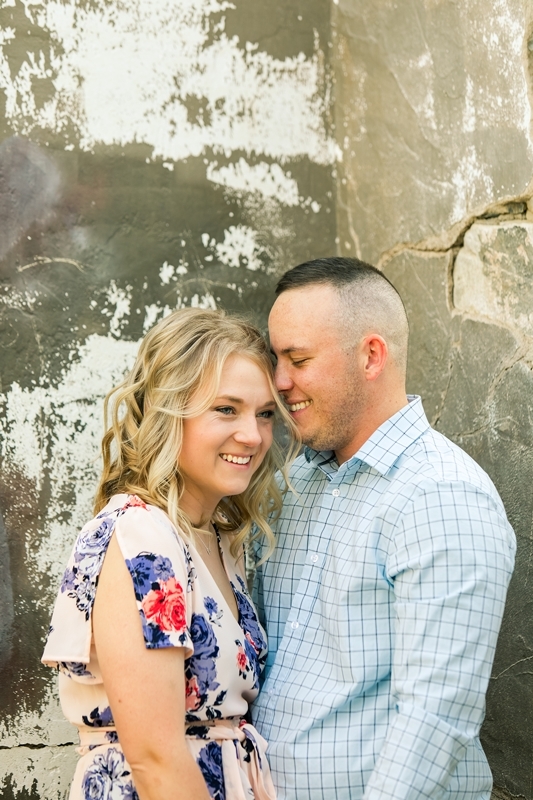 Their wedding is coming up this fall and I can’t wait. 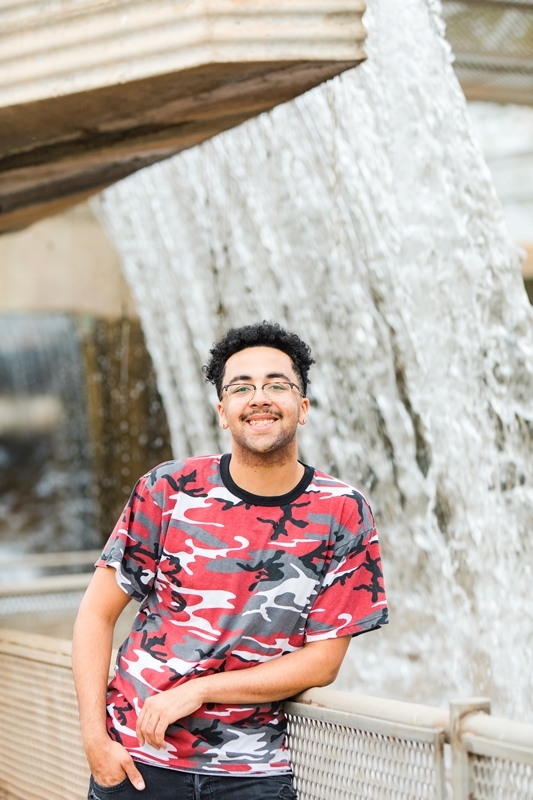 Photography has always been a huge part of my life. 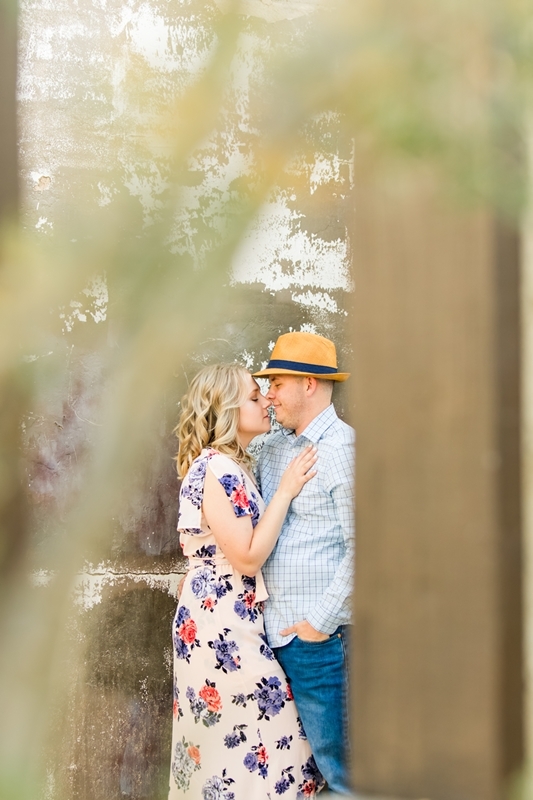 I love capturing raw emotion whether it be a couples love, joy amongst children, a parents complete love for their child or anticipation of a new addition. 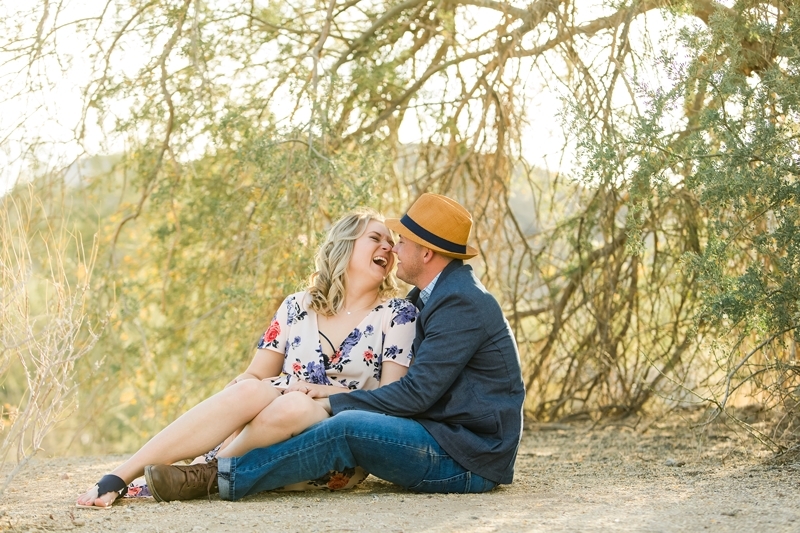 I love last minute fun and being spontaneous. 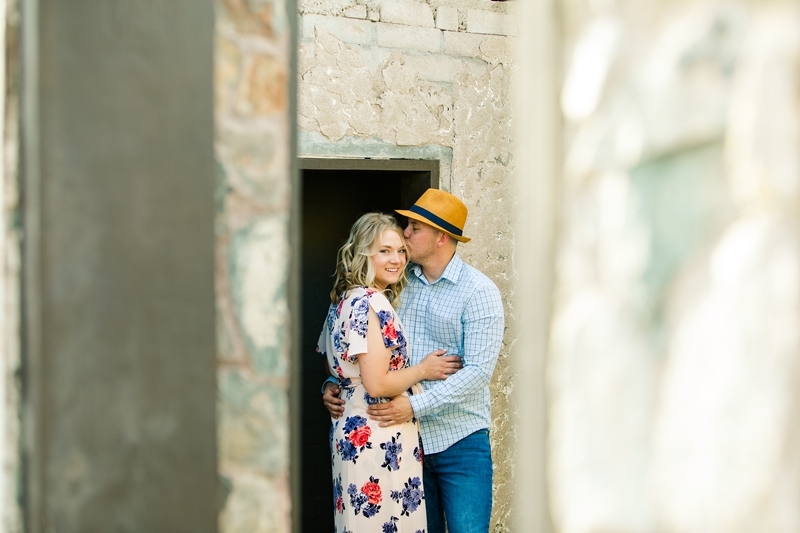 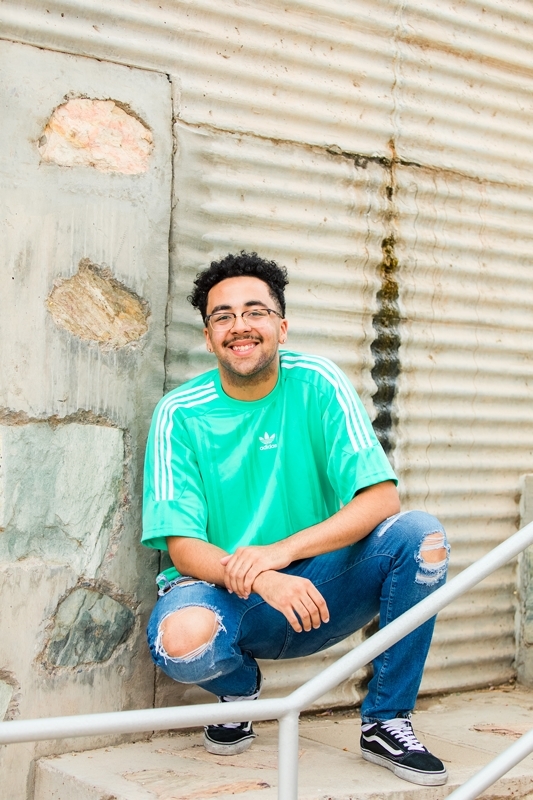 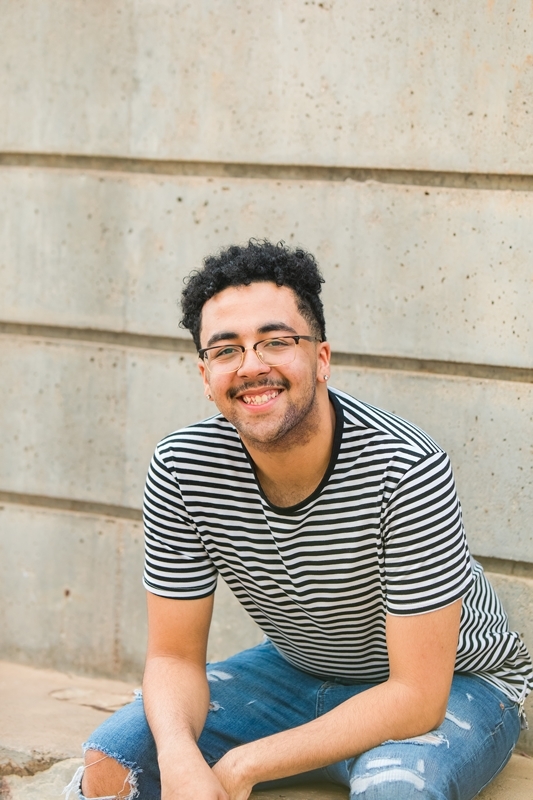 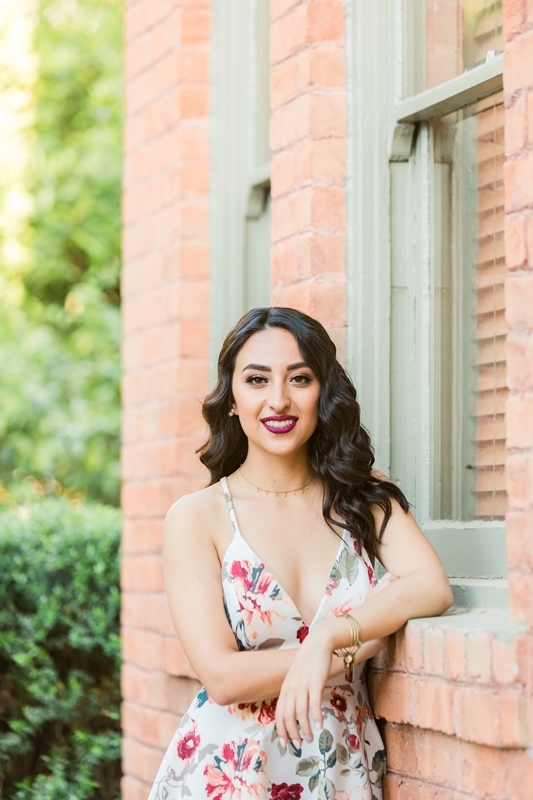 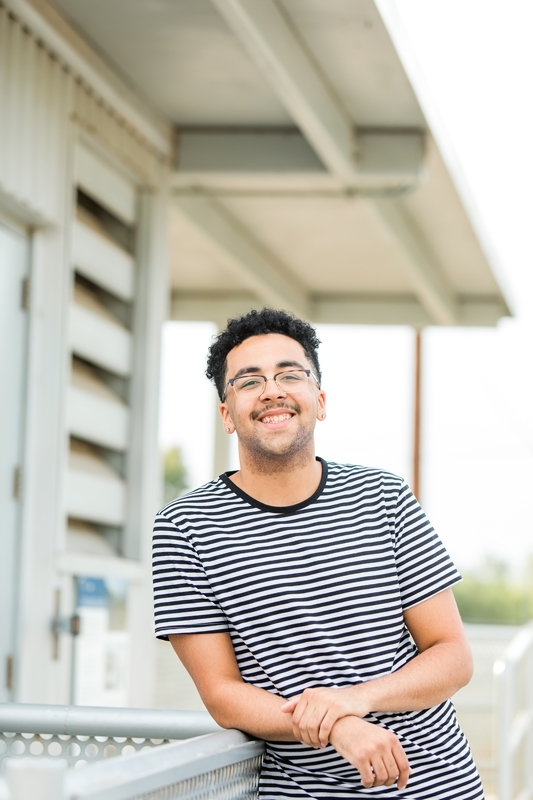 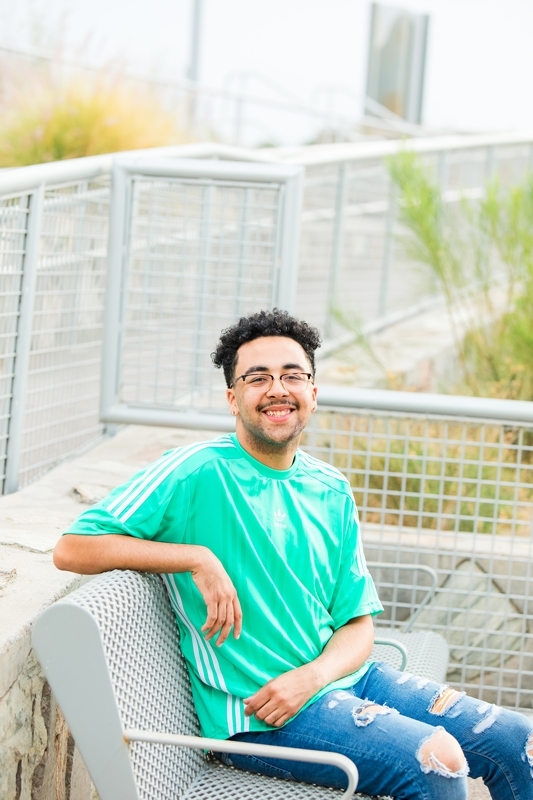 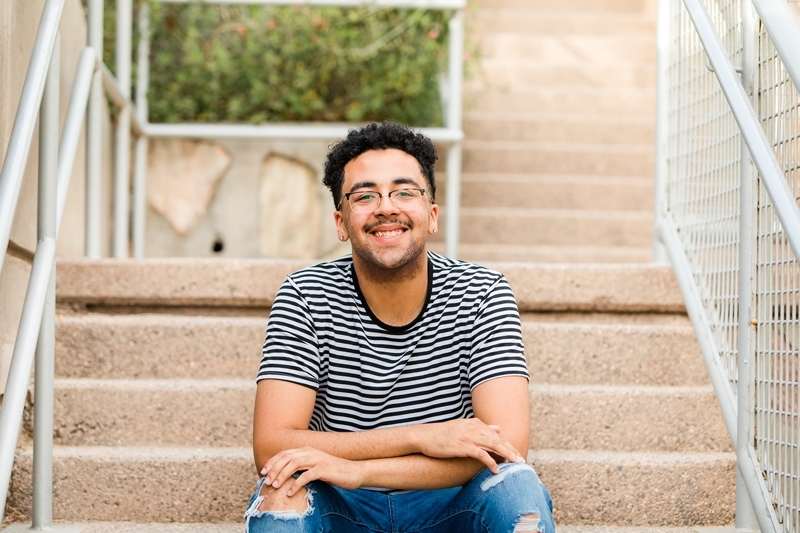 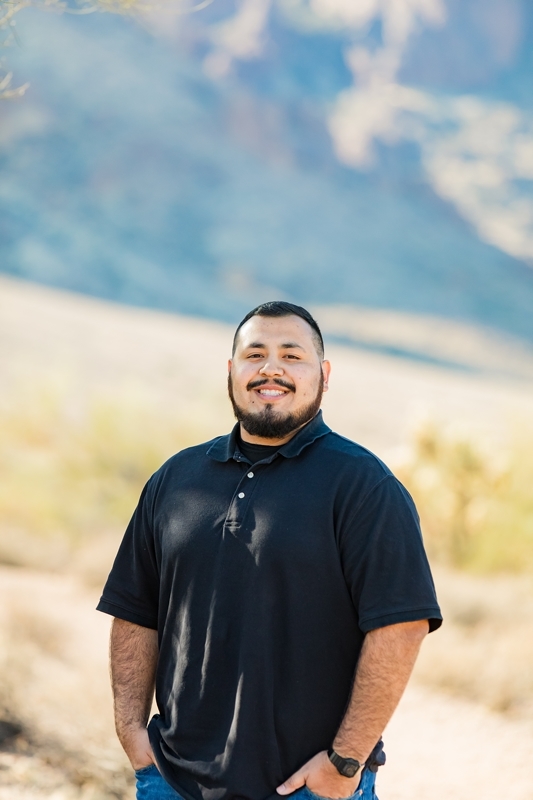 Now that you know all about me, I’d love to get to know you better at your session or wedding.